Over winter break, I had the opportunity to read two books about the Camino de Santiago by people I sorta know that capture the Camino Francés before and after the boom of the 2000s and 2010s. 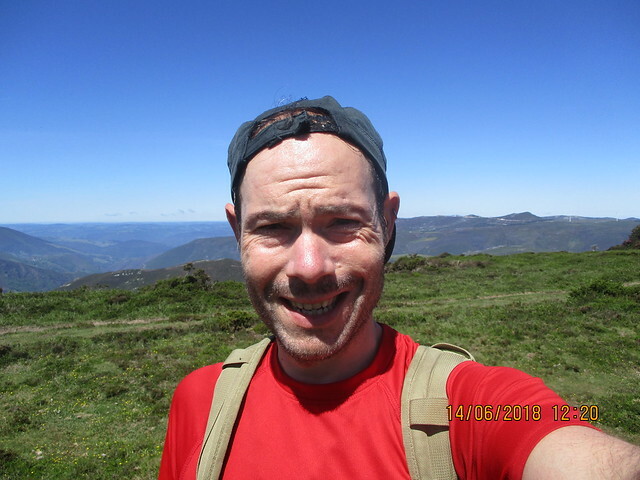 Durante las vacaciones de invierno, tenía la oportunidad de leer dos libros sobre el Camino de Santiago escritos por personas que casí conozco y sus libros capturan el antes y después del auge de peregrinos en los años 2000s y 2010s. 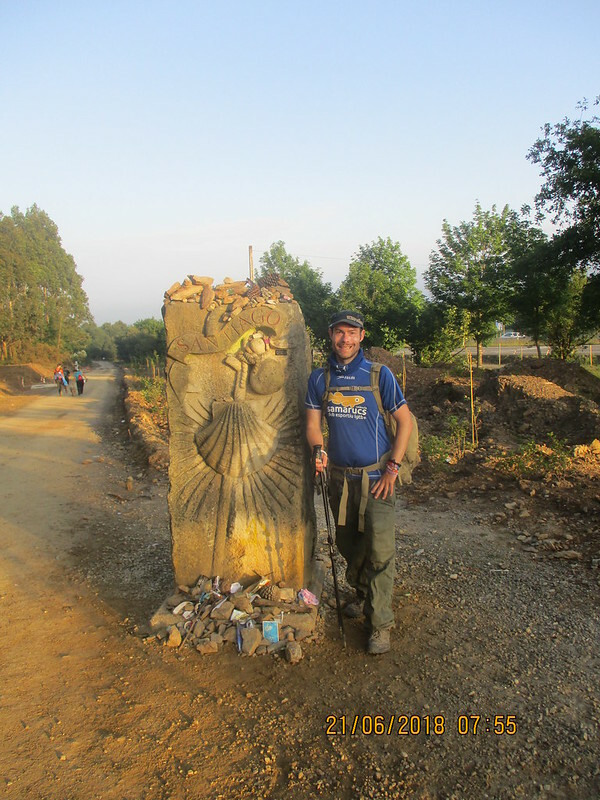 Road of Stars to Santiago by Edward Stanton was published in 1994 and is about his early 1990s pilgrimage to Santiago on the Camino Francés. Stanton was a Spanish language and literature professor at my undergraduate university, University of Kentucky, and while I never had any classes with him, one of my professors told me about this book every time we met up for Christmas lunch over the years. I finally tracked it down at the U of Illinois library and read it. It was a refreshing time capsule about a time before peregrinos were so common and albergues weren’t in every pueblo along the Francés. Sometimes he had to search for arrows. 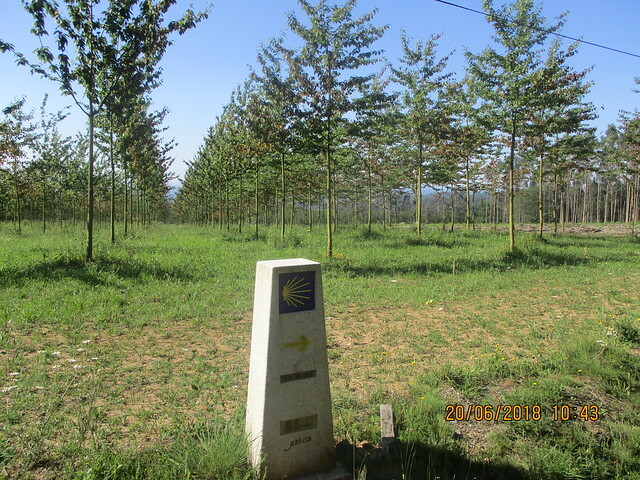 It was fascinating to read how the Camino was before its popularity took off. Camino de Estrellas a Santiago por Edward Stanton fue publicado en 1994 y trata de su peregrinación a Santiago en el Camino Francés. Stanon era un profesor de lengua y literatura española donde hice mis carreras de periodismo y estudios hispánicos. Aunque nunca tenía ninguna clase con él, el profesor con quien suelo comer una vez al año durante Navidades siempre me habló de este libro. Por fin, lo encontré en la biblioteca de la Univerisdad de Illinois y me lo leí. Era una capsula de tiempo fresco sobre una época antes de los peregrinos eran tan común y no todos los pueblos tenía albergues. A veces tenía que buscar las flechas. Me fascinó la historia del Camino antes de ser tan popular. 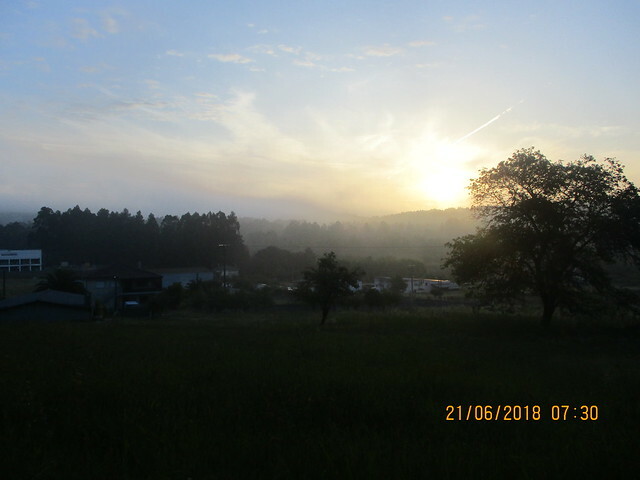 One of my favourite Camino blogs, Camino Times Two, written by Beth Jusino, has recently published a book about her experiences on the Camino Francés post-boom. 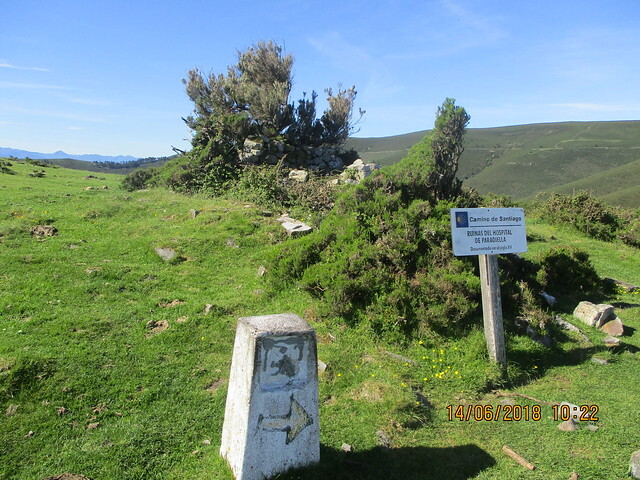 Walking to the End of the World: A Thousand Miles on the Camino de Santiago recreates her Camino, starting with the Chemin du Puy in France and the Camino Francés from Saint Jean Pied a Port to Finisterre at the end of the world in Galicia. 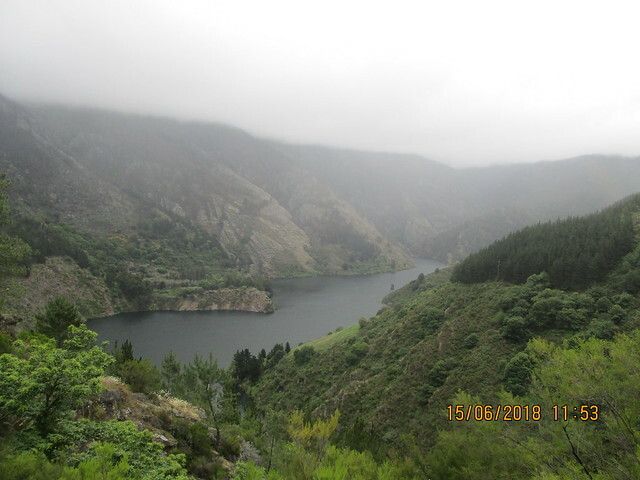 Uno de mis blogs favoritos sobre el Camino, Camino Times Two, escrito por Beth Jusino, ha publicado un libro sobre sus experencias en el Camino Francés después del auge del Camino Francés. 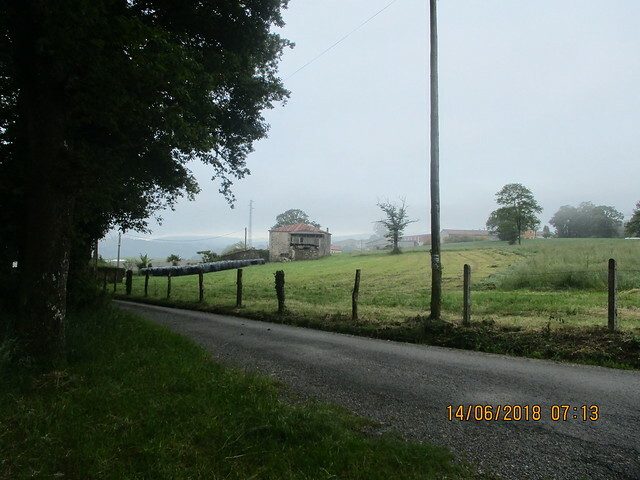 Walking to the End of the World: A Thousand Miles on the Camino de Santiago nos cuenta su Camino, empezando con el Chemin du Puy en Francia y el Camino Francés desde Saint Jean Pied a Port a Finisterre en el fin del mundo en Galicia. I related more to her story and her tales of the Ugly Americans and the Black Eyed B’s. I had decent shoes, but my backpack was just about as horrible as her first pair of boots were, I believe. I also realise how much I benefitted from living in Spain, as I knew where to go to find the amazing menús del día that had things other than French fries! Her book made me yearn to be back in my beloved Spain, preparing for another Camino. Me relacioné más con su experiencia y sus relatos de los Ugly Americans (estadounidenses feos que se comportan mal en extranjero) y los “Black Eyed B’s” (P’s con moretones de ojos). Aunque tenía zapatos buenos, tenía una mochila de mierda que era tan horrible como su primer par de botas, creo. También me di cuenta tanto beneficié de vivir en España, ¡porque sabía donde buscar los menús del día DPM que ofrecen más cosas que patatas frías! Después de leer su libro, anhelo estar en mi España querido, preparando para otro Camino. Both books are recommended for fans of Camino-related literature. Recomiendo ambos libros para los aficionados de literatura sobre el Camino. 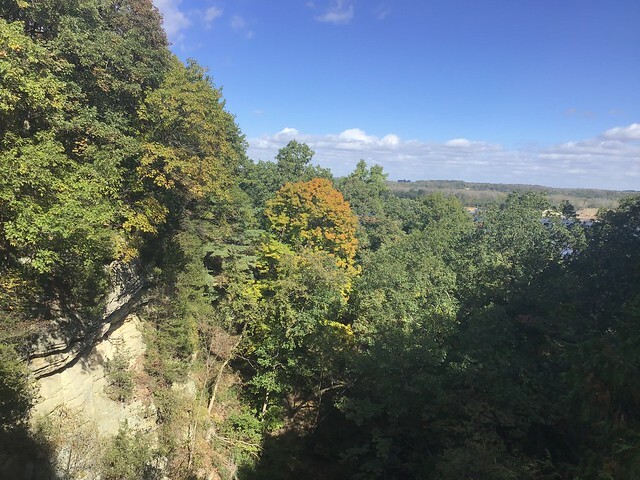 I needed to see fall foliage. Even while living in the Basque Country, I never quite found spectacular foliage, although had I gone to Selva de Irati a few weeks later, I would have found it. It was still a great trip. Tenía ganas de ver las hojas de otoño. 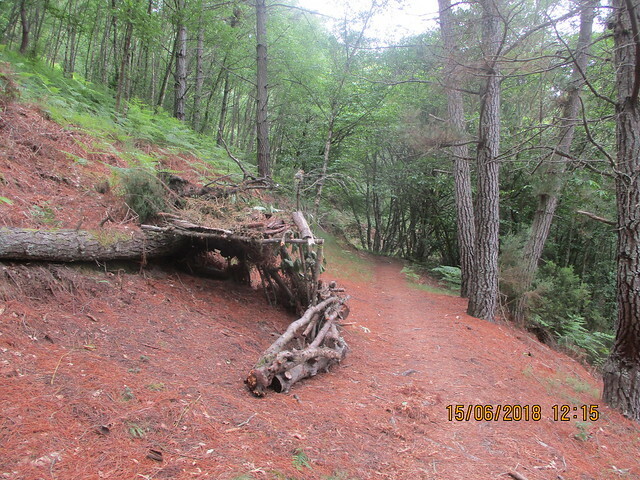 Incluso cuando viví en Euskadi, nunca pude encontrar hojas tan espectaculares, aunque si hubiera viajado a la Selva de Irati unas semanas más tarde, las habría podido encontrar. Todavía era un gran viaje. This year, I wanted to see it at all costs. 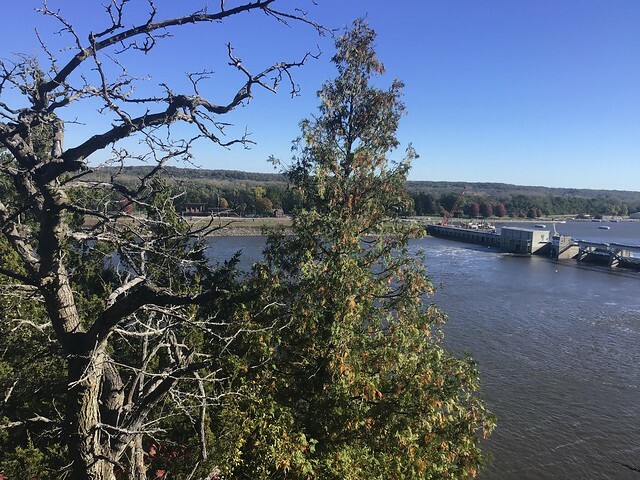 Illinois had a warm October that switched to snow overnight, went back to summer and then back to winter and has stayed winter, so the foliage wasn’t at peak when I went to Starved Rock State Park. Este año, quería verlo sí o sí. Illinois tenía un octubre caluroso que después cambió a nevar una noche, volvió a verano, y después a invierno y ha quedado invierno. 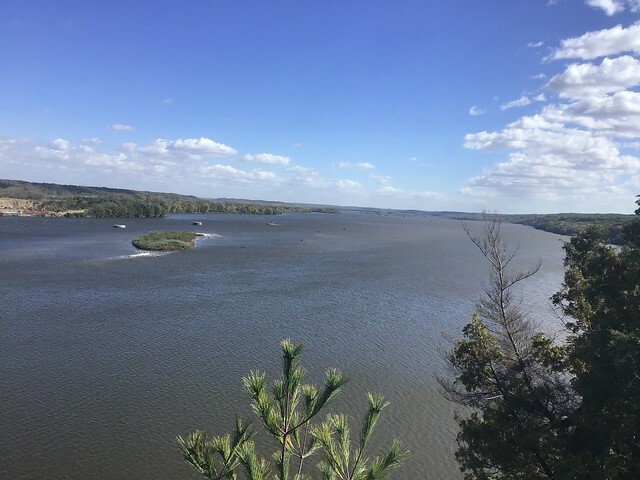 Entonces, el follaje no estaba en el mejor momento cuando fui a parque estatal Starved Rock (Roca de Hambruna). I went with the guy I’m seeing, and we left Chambana around 6:45. The ride took about two hours, but we stopped in Bloomington for a Starbucks run. We arrived around 9:00ish. 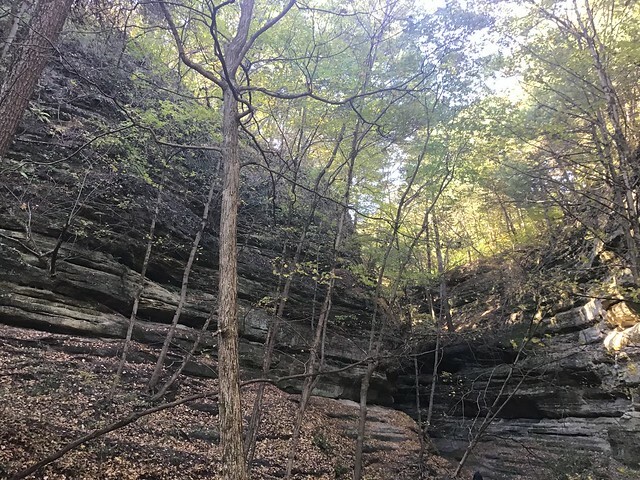 They had free guided hikes going on all day to Starved Rock and French Canyon. Fui con el chico quien estoy conociendo, y salimos de Chambana sobre las 6:45 de la mañana. 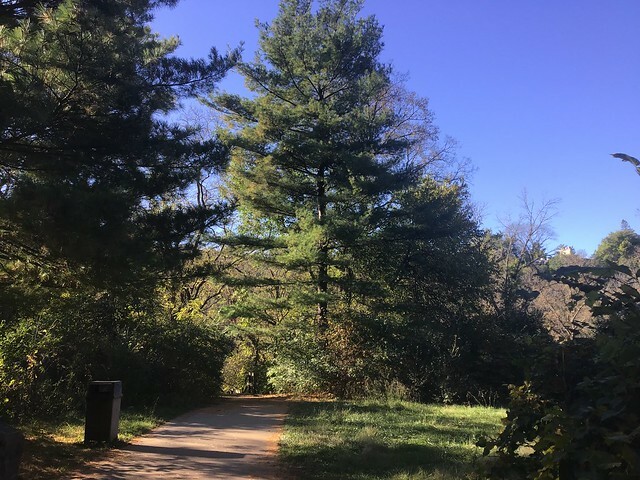 El viaje tardó unos dos horas, pero paramos en Bloomington para ir a Starbucks. Llegamos sobre las 9. 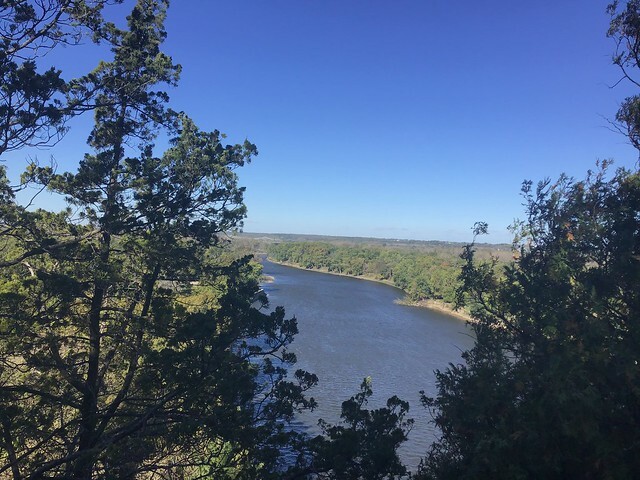 Había rutas guiadas todo el día a Starved Rock y el Cañón Francés. I’m not a fan of guided tours in general (people! Ahhh, people! I’m such the introvert), but the guide was very informative. They split us in two groups because there were so many people. We went at a slow pace to take in the incredible views. No me suelen gustar las rutas guiadas en general (¡Gente! ¡Socorro! Estoy tan introvertido), pero el guía era informativo. Nos dividimos en dos grupos porque había tanta gente. Caminamos despacito, suave-suave-cito para disfrutar de las vistas increíbles. 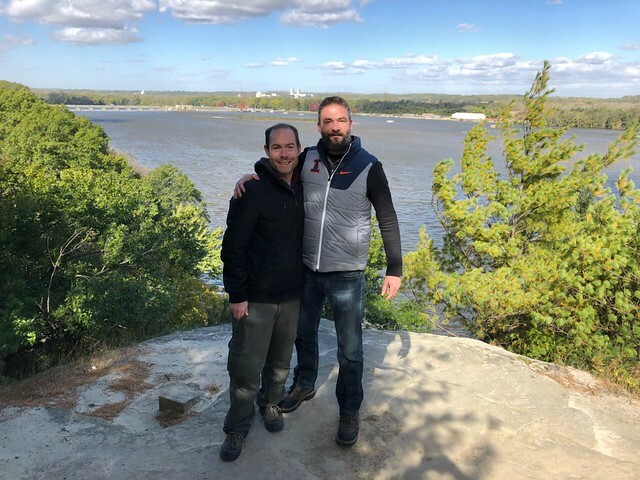 Later, we decided to go on a hike of our own to see more of the foliage and views of the Illinois River. It was a crowded weekend, but the views were worth it. 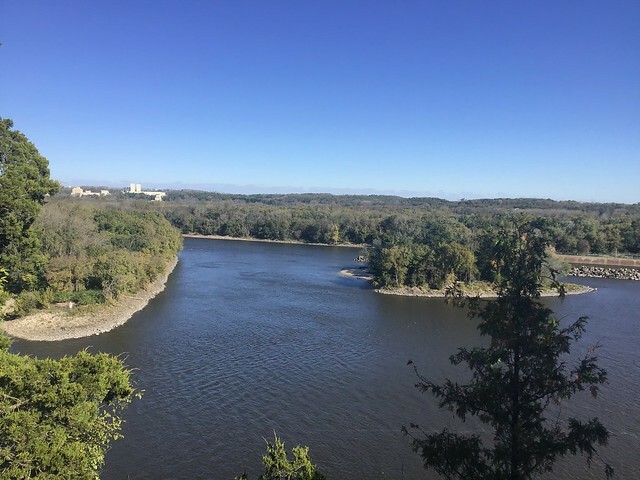 Después, decidimos hacer otra ruta por nuestra cuenta para ver más de follaje y vistas del Río Illinois. Había muchas personas este fin de semana, pero las vistas merecían la pena. 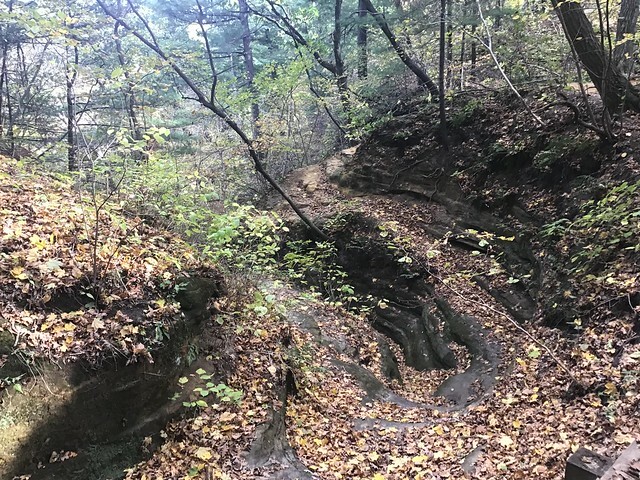 I missed hiking and still miss hiking and hope to get back out there to explore more of Illinois in the near future. 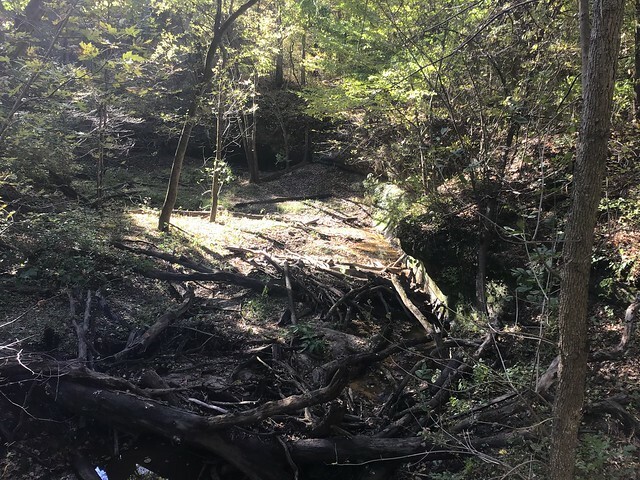 Echaba de menos senderismo y todavía echo de menos senderismo y espero volver pronto para explorar más del estado de Illinois en el futuro próximo. 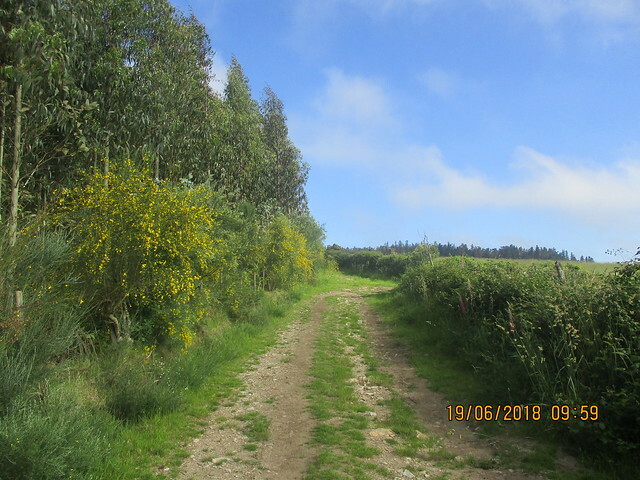 Camino Primitivo (Camino de Santiago) Etapa 12: O Pedrouzo – Santiago de Compostela. I awoke around 6 a.m. with butterflies in my stomach. The day had finally arrived. Me desperté a las 6 de la mañana nervioso. Por fin, el día ha llegado. 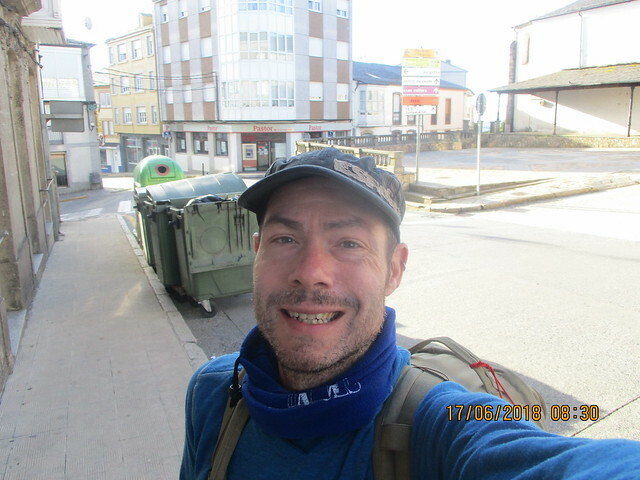 After 600 kilometres on the Camino del Norte, 121 on the Camino San Salvador and 323 on the Primitivo, I was going to arrive to Santiago. Only 19 kilometres separated me from the goal I had had since 2010. Was I ready? 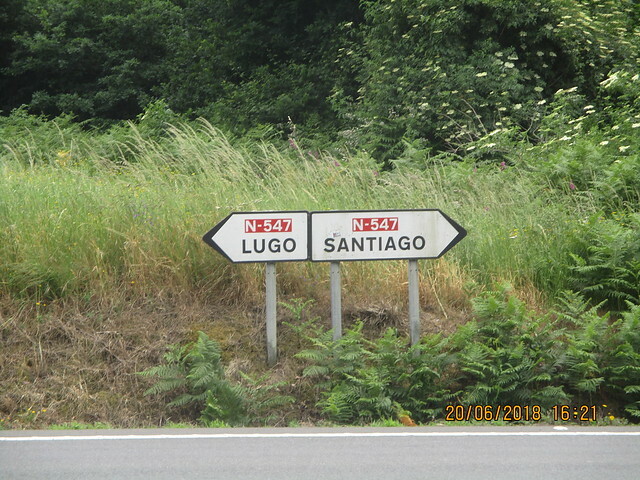 Después de 600 kilometros del Camino del Norte, 121 del Camino San Salvador y 323 del Primitivo, iba a llegar a Santiago. Solo 19 kilómetros me separó de la meta que había tenido desde 2010. ¿Estaba listo? There was an open bar just after I left the pensión, so I had my tostada and café and got the credentials stamped. I already saw a ton of peregrinos. O Pedrouzo feels more like tourist trap on the Mediterranean than a Camino town. Había un bar abierto justo después de la pensión, y desayuné la tostada y café con leche de siempre, y me sellaron las credenciales. Ya había muchos peregrinos. O Pedrouzo es más parecido a un pueblo de turistas del Mediterráneo que un pueblo del Camino. I was prepared for tons of peregrinos. 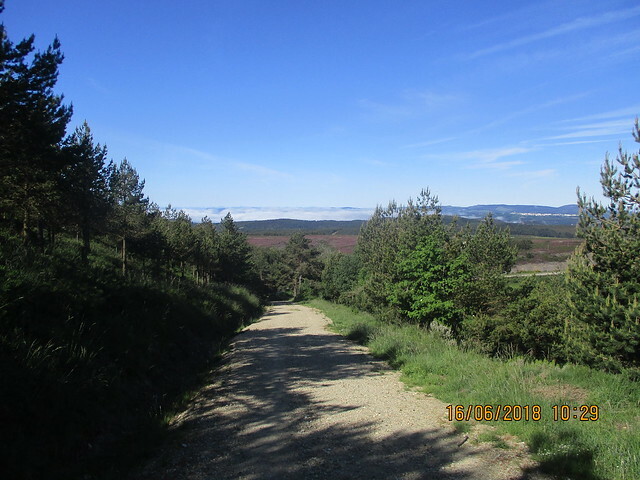 As the hospitalero in Bodenaya had explained it, as the Primitivo was the first Camino, it was the Caminos Francés and then del Norte that became the Primitivo, not the other way around. 1502 peregrinos registered with the office, and I know not every one goes to the office. Estaba preparado para muchos peregrino. El hospitalero de Bodenaya nos explicó que el Primitivo era el primer Camino, y por eso, era los Caminos Francés y después del Norte que se convierten al Camino Primitivo, no el Camino Primitivo que se convierte al Camino Francés. Había 1502 peregrinos se registraron aquel día con la oficina de peregrinos, y sé que no todos van a la oficina. I was right. It wasn’t as bad as I feared, as I was thinking it would be Les Rambles in Barcelona, but it was pretty bad. I somehow managed to walk alone for about 20 minutes in the first forests along the way. I was happy it wasn’t entirely industrial. It was gone too soon, as there were peregrinos everywhere. Tenía razón sobre el tráfico de peregrinos. No era tan mal como pensaba, porque pensaba que iba a ser como Les Rambles en Barcelona, pero aún así, era mal. 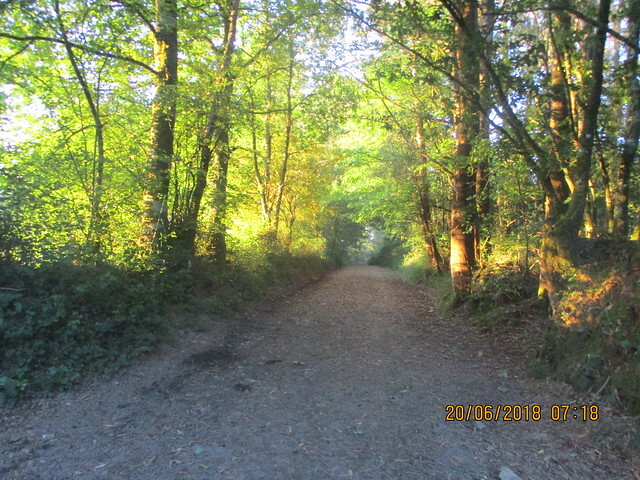 No sé como, pero tenía unos 20 minutos cuando caminé solo en los primeros bosques por el Camino. Me alegré que no hubiera todo industrial. La tranquilidad desapareció demasiado rápido, y después había peregrinos por todos los lados. 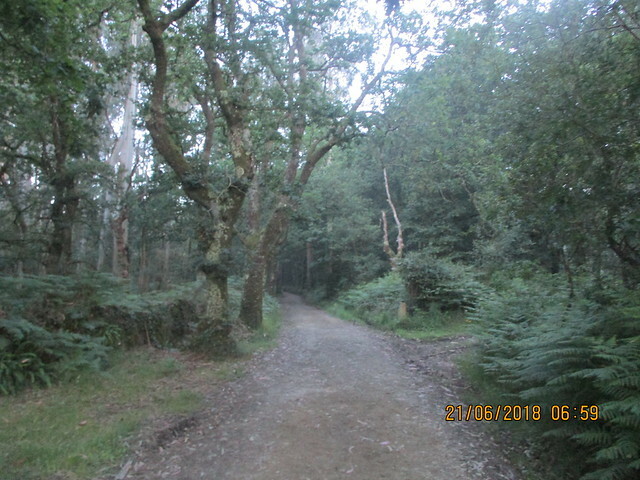 The last stretch feels more like walking from the car park at Disney to the actual park than walking the Camino. La última etapa es más como caminar desde el aparcamiento de Disney a Disney que caminar el Camino. I stopped at a church along the way for a stamp, and at a bar along the way. I saw a school transport bus try to park right in the Camino too. Paré en una iglesia para un sello, y también en un bar por el camino. Vi un autobús de transporte escolar intentar aparcar justo en el Camino. 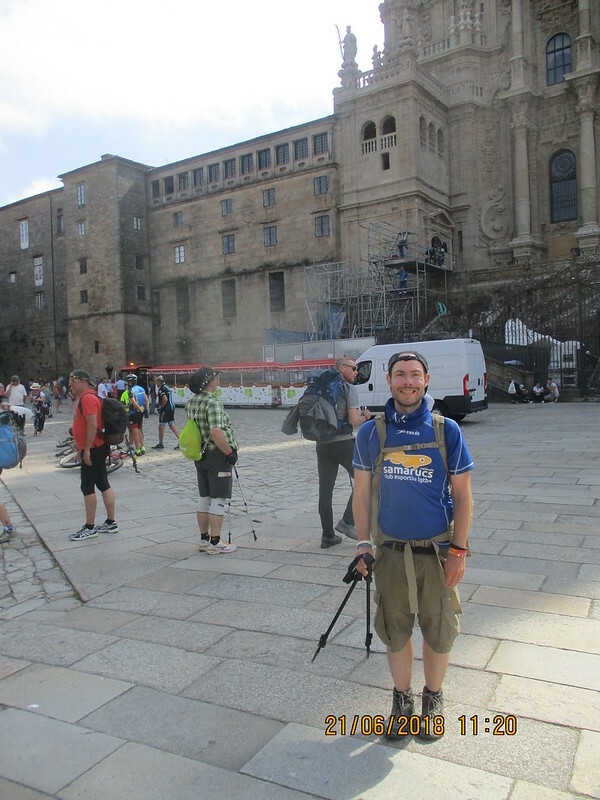 The good thing about running into a ton of peregrinos is that someone can always take your picture at all the Santiago de Compostela signs. 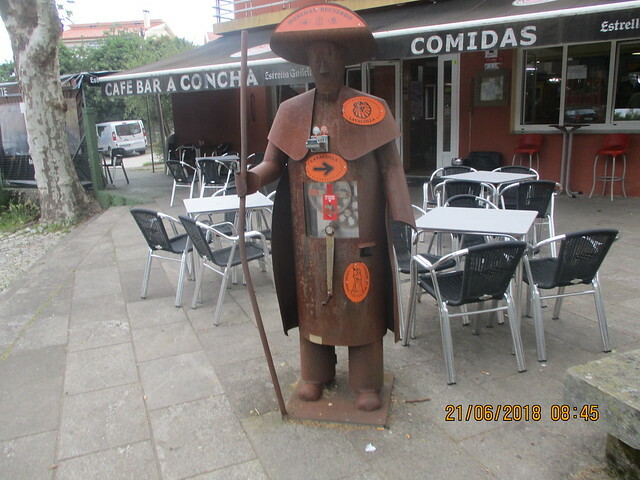 La cosa buena de ver muchos peregrinos es siempre hay alguien para hacerte una foto en todos las indicaciones de Santiago de Compostela. Everyone talks about how emotional they become when they see the cathedral from Monte de Gozo. I felt nothing. Anticlimatic much? Only 4 km left, and they went by in a flash. Todo el mundo habla de como la emoción que se siente cuando ven la catedral desde Monte de Gozo. No sentí nada. ¿Decepcionante? Solo me quedaban 4 kilómetros, y me pasaban rápido. I was a bit excited to pass the official sign saying I was in Santiago limits, but as I’ve already mentioned, it was a bit anticlimatic. As I walked through the Santiago streets, I remembered my 2009 visit. I had lost my debit card and saw it on an extreme budget. I more or less remembered the streets. Me emocioné un poco cuando vi que estaba entrando los limites de Santiago, pero como ya había dicho, era algo decepcionante. 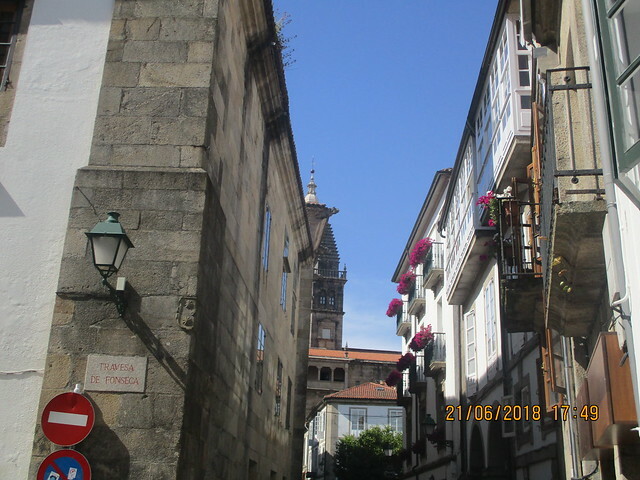 Mientras caminé por las calles de Santiago, recordaba mi visita de 2009. Perdí la tarjeta de débito y vi la ciudad con un presupuesto catalán, digo extremo. I found my way to the cathedral. I was a bit excited, but I felt no sense of accomplishment, no sense of self-discovery, no sense of relief. Encontré la catedral. Estaba un poco emocionado, pero no me sentí que había conseguido algo, ningún sentido de auto-conocimiento, no sentido de alivio. 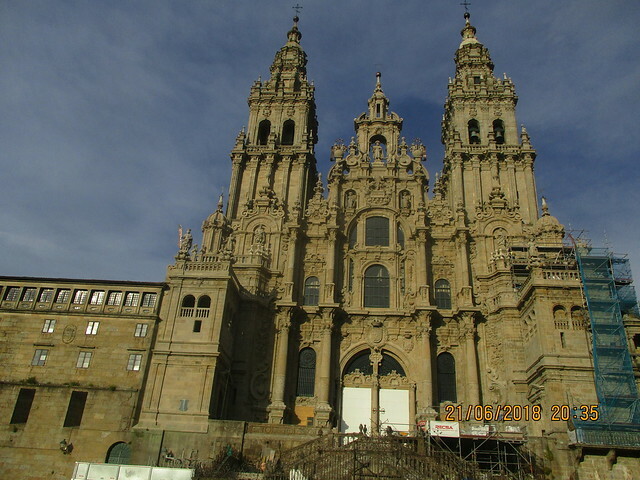 The actual arrival to the Cathedral of Santiago will not give anyone sudden answers to the meaning of life. La llegada a la Catedral de Santiago no te va a dar las respuestas de la vida. 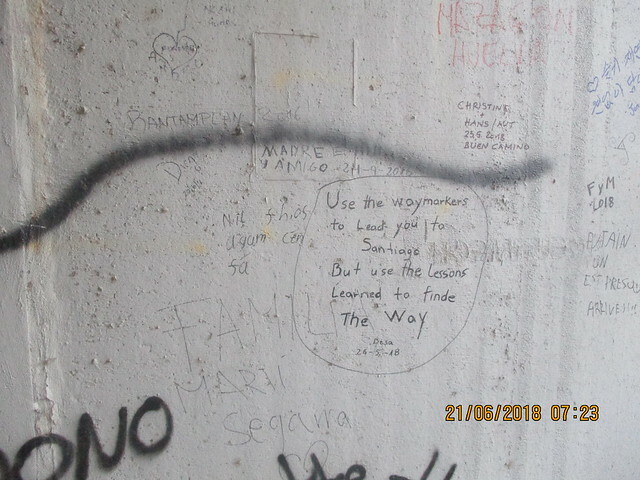 The Camino as a whole will teach you everything there is about life and about yourself, but these lessons are not obvious. 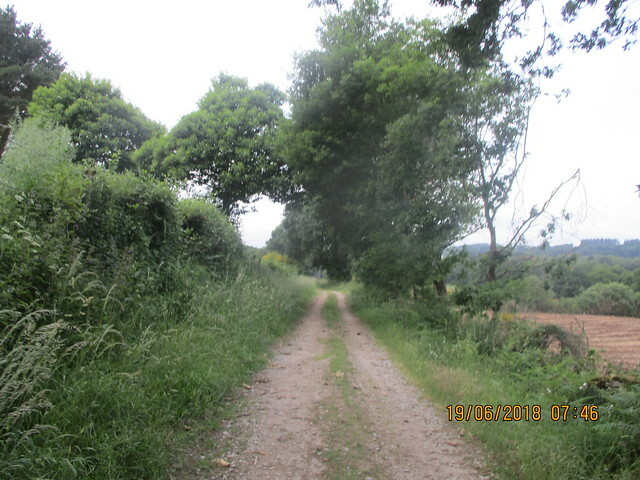 Nothing on the Camino is obvious. El Camino te va a enseñar todo sobre la vida y sobre ti mismo, pero sus lecciones no son obvias. Nada del Camino es obvio. I was going to go to the noon peregrino mass, but I didn’t want to pay to store my backpack, so I opted for the afternoon mass. I did get my Compostela after waiting in queue for an hour. I returned the next day to pick up a certificate of kilometres walked. I don’t know WHY my initial reaction was “no” to that! Había pensado en ir a la misa de peregrino a las 12, pero no quería pagar una consigna para dejar la mochila. Por eso, fui a la misa por la tarde. Conseguí la Compostela después de esperarla una hora. Volví el día siguente para el certificado de kilometraje. No sé porque no quería uno al principio. I went to my pensión, had lunch, rested, purchased new jeans (I had tossed mine in the donation bin in Oviedo) and meandered to buy souvenirs. I enjoyed being in such a beautiful city. Fui a la pensión, comí, descansé, compré vaqueros nuevos (había tirado los míos en el contenedor donativo en Oviedo) y callejeé y compré regalos. Disfruté de estar en una ciudad tan bonita. Santiago, population 95,671, was originally a Roman cemetery in the fourth century. 500 years later, Bishop Theodemar of Iria claimed to have discovered Saint James’ remains. Construction on the current cathedral began in 1075 and wasn’t finished until 1211. 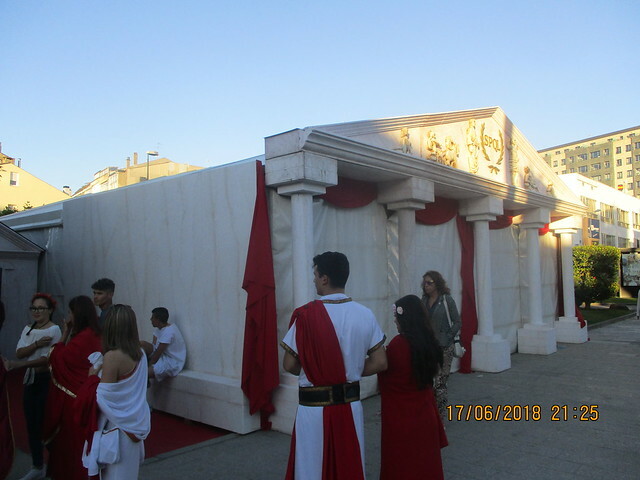 Santiago, población 95.671, era un cementerio romano en el Siglo IV. 500 años después, el Obispo Teodemar de Iria dijo que descubrió los restos mortales de Apóstol Santiago. La construcción de la catedral actual empezó en 1075 y no se acabó hasta 1211. I arrived to the cathedral nearly an hour before the pilgrim’s mass and had no line to enter and only a short one to hug the Apostle James. I found a seat for the mass. I was in luck as someone had paid to have the botafumeiro ritual done that day. It was as cool as promised. Llegué a la catedral casi una hora antes de la misa de peregrino y no tenía que esperar para entrar y solo tenía que esperar unos minutos para abrazar el Apóstol Santiago. Me sentí y esperé la misa. Tenía suerte, porque alguien había pagado para tener el ritual de botafuimero aquel día. Era muy chulo. 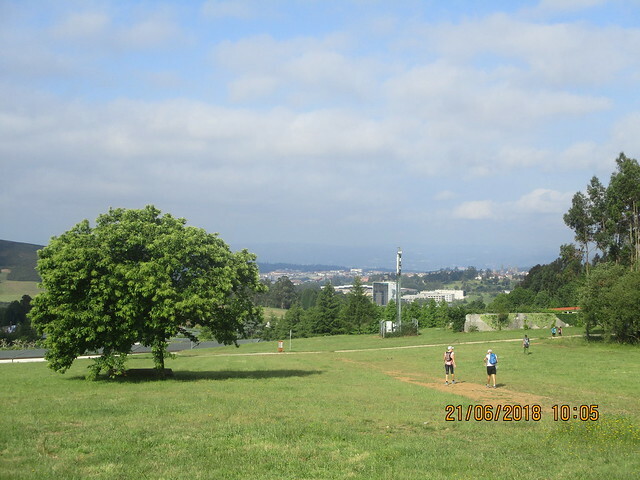 After mass, I hung out in the Praza de Obradoiro, people watching. I did get a bit emotional then. Después de misa, me quedé en la Praza de Obradoiro, mirando la gente. Vale, por fin me emocioné algo. I had dinner and went back to the pensión to rest. I didn’t have to wake up early the next morning. My Camino routines were over. Cené y volví a la pensión para descansar. No tenía que madrugar. 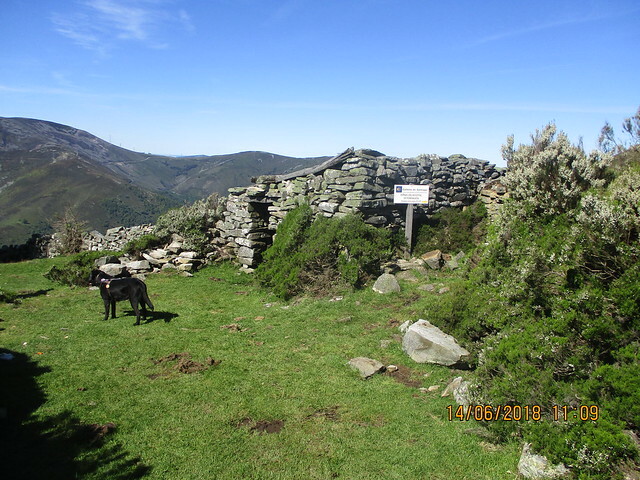 Las rutinas del camino se han acabado. 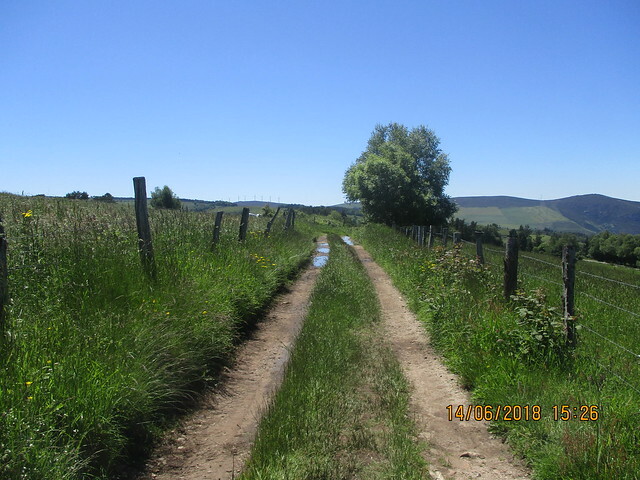 There was still one thing left to do before I could say my Camino was officially over though. Todavía me quedaba una cosa de hacer antes de poder decir que había acabado el Camino. Nothing makes a 40 kilometre day even longer like getting completely lost. No hay nada para hacer un día de 40 kilómetros aún más largo como perderse por completo. The day didn’t start out well. I didn’t sleep well, as the other peregrinos made noise all night long. Several of them were the rude type that went to bed late and then were up before everyone else making noise as they got ready for the day. I dragged myself out of bed and got ready as it was better lying in bed, stewing. El día no empezó bien. No dormía bien, como los peregrinos del albergue hicieron ruido toda la noche. Muchos de ellos era el tipo sin educación que se acuestan tarde y después se levantan tarde, haciendo mucho ruido como se preparan por el día. Me arrastré de la cama y me preparé por el día, como era mejor que quedarme en la cama enfadado con el mundo. I stopped for breakfast and immediately felt better. Everyone else seemed to skip it, which made me happy. For me, the tostada and café con leche in a cozy bar is an essential part of my morning (even in normal days). The Spanish definitely understand how much it is a part of daily Spanish life. Desayuné y después me sentí mejor. Todos los demás lo saltaban, que me hizo contento. Para mi, es esencial un café con leche y tostada en un bar acogedor todas las mañanas, no importa si estoy en el Camino o no. Lo españoles me entienden perfectamente como es parte de la vida española. 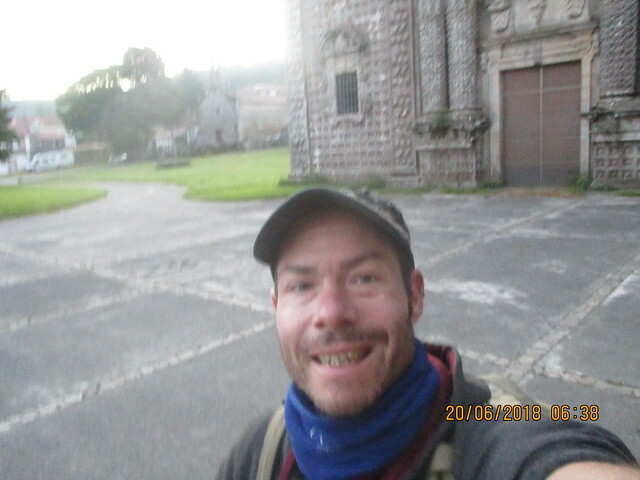 I had the Camino to myself for about an hour or so as the sun rose over the monastery and Galician landscape. 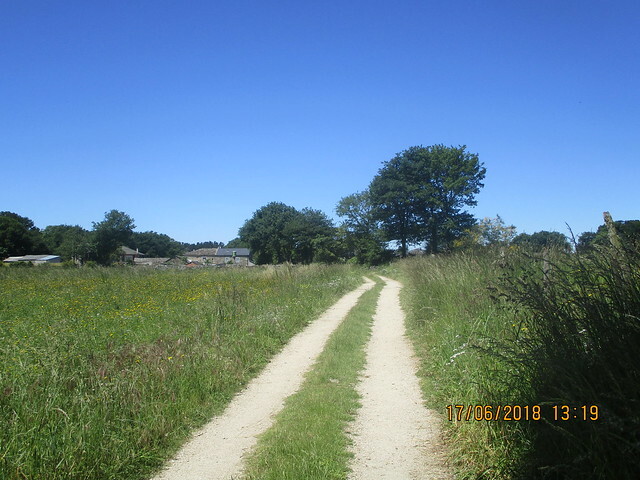 I remember it started out on a path that didn’t really go anywhere before going down into another settlement of houses. 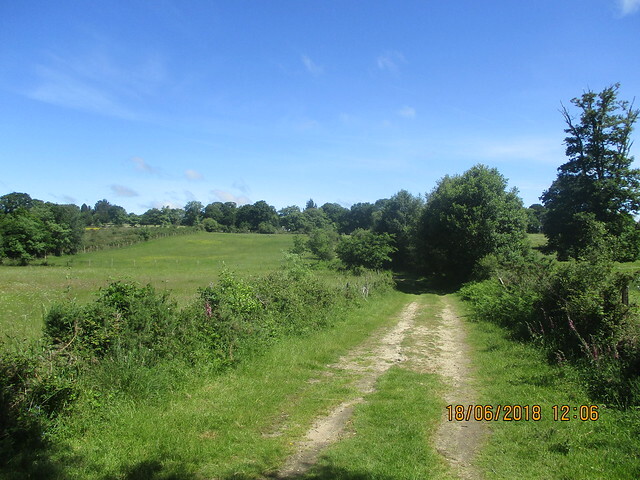 I feared it would be all asphalt, but a lot of it was nice ground paths. 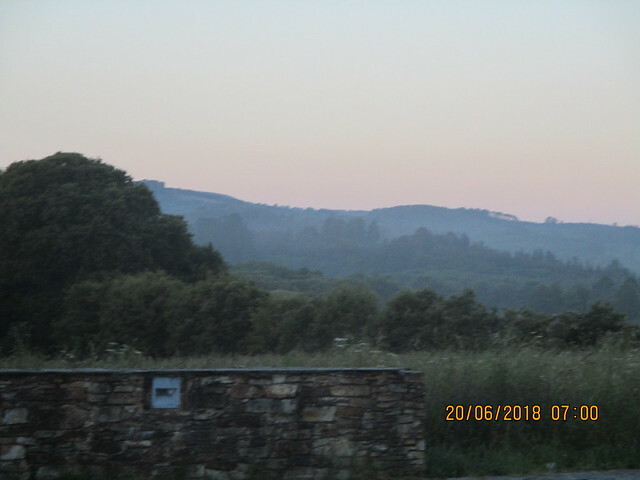 Caminé solo durante una hora mientras el sol se levantó encima el monasterio y paisaje gallego. Recuerdo que empezó en un sendero que no iba a ningun lado antes de bajar hasta un grupo de casas. Pensaba que iba a ser todo asfalto, pero había mucho de pista de tierra. A few peregrinos passed me, and I let them advance on. I wanted the serenity of being at one with nature to last as long as possible. Unos peregrinos me adelantaron y los dejé seguir. Quería tranquilidad y estar solo en la naturaleza durante tanto tiempo como posible. 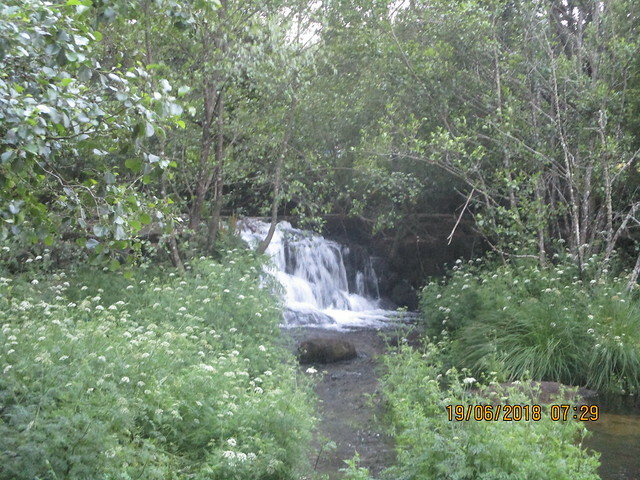 The first village is at around 10 kilometres. 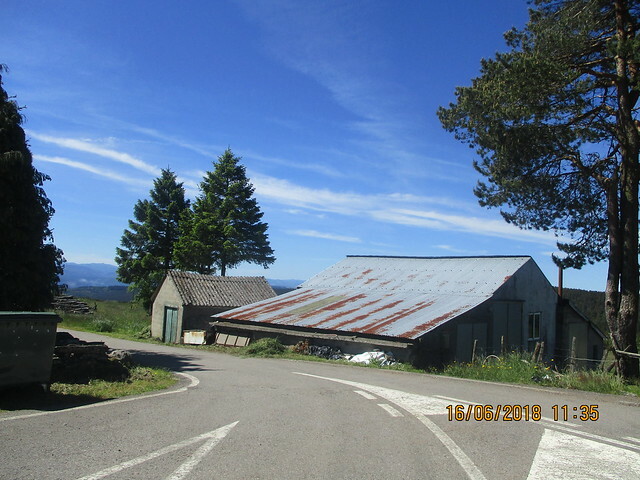 Boimorto, population 2040, offered a few bars and also has an albergue. 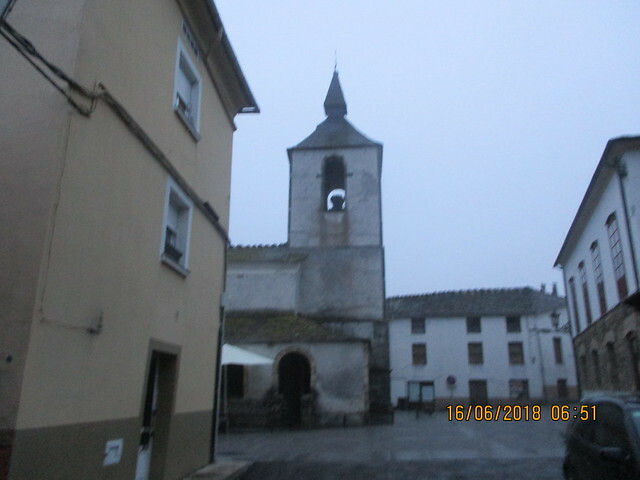 I had stopped at a bar before arriving to the village to double check the Camino alternative that starts outside Boimorto. A 10 kilómetros se encuentra el primer pueblo, Boimorto, población 2040. Hay unos bares y también disponible de un albergue. Había parado en un bar antes de llegar al pueblo para verificar el variante del Camino que empieza después de Boimorto. 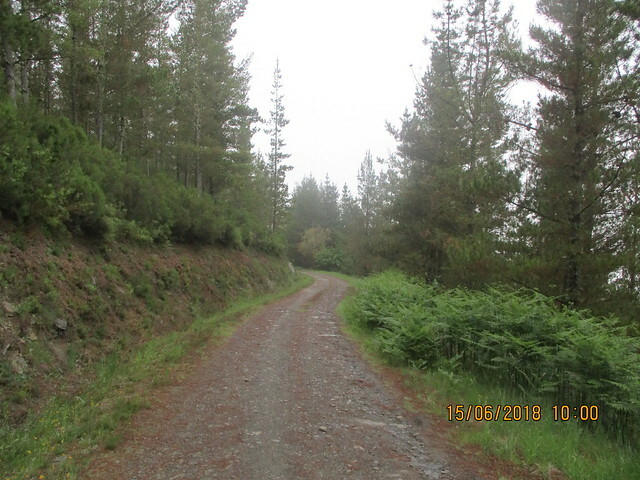 I wanted to avoid the masses for as long as possible, so I was going to follow the variant that goes to Santa Irene, 3 kilometres ahead of O Pedrouzo, where I had a reserved pensión waiting for me. Quería evitar las aglomeraciones durante tanto tiempo posible. 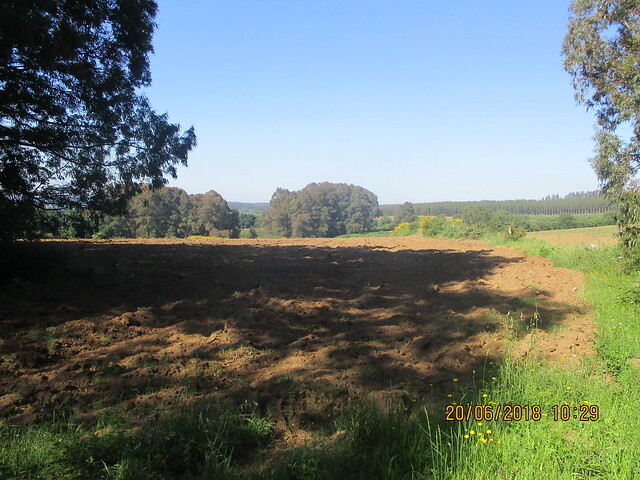 Iba a seguir una variante hasta Santa Irene, a 3 kilómetros de O Pedrouzo, donde tenía una pensión reservada. I missed the turnoff. I was following the normal del Norte route. I figured it out soon enough and found a road that took me to where I needed to be. No harm done and no extra kilometres. Pedí el desavío. Estaba en la ruta del Norte normal. Me di cuenta enseguida y encontré una carretera que me llevó a donde necesitaba estar. No pasa nada y no kilómetros de más. The one bar along the alternative is more of a restaurant, and they were just opening up when I passed around 11. El único bar por este variante es más restaurante, y estaban abriéndose cuando lo pasé sobre las 11. This variant goes on and on without end. The views don’t change. 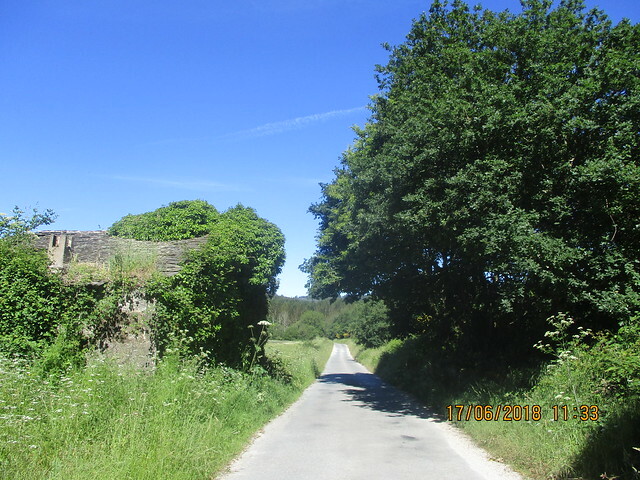 It’s a road that is seldom driven on, and it goes through forests and farms. I saw one small church to break up the monotony, and I saw the only peregrino of the day there. El variante seguía para siempre. 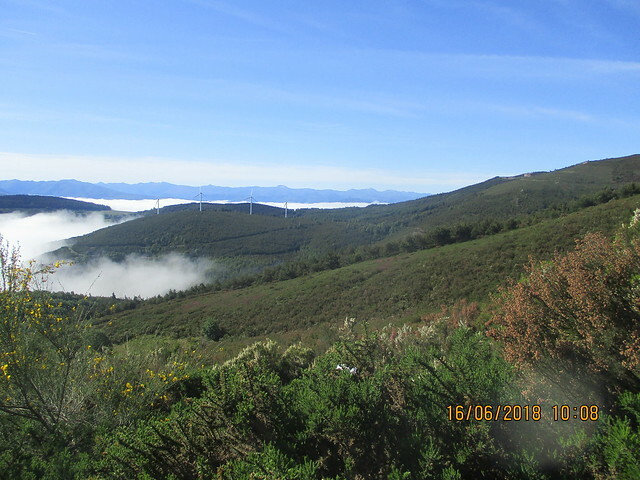 Las vistas nunca cambian. Hay poco tráfico, y pasa por bosques y granjas. 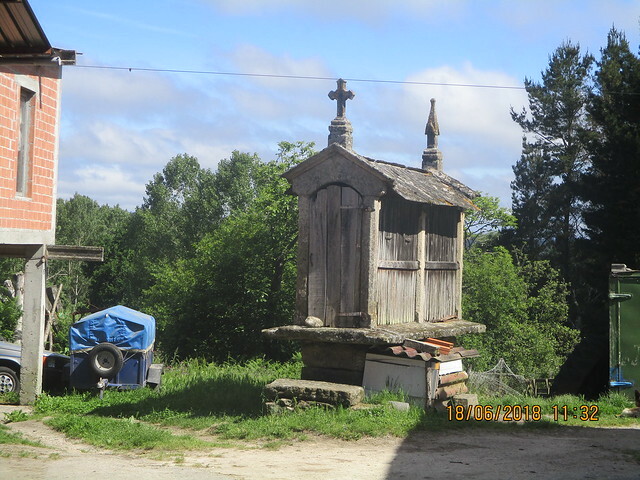 Vi una ermita, donde vi el único peregrino del variante que vi aquel día. 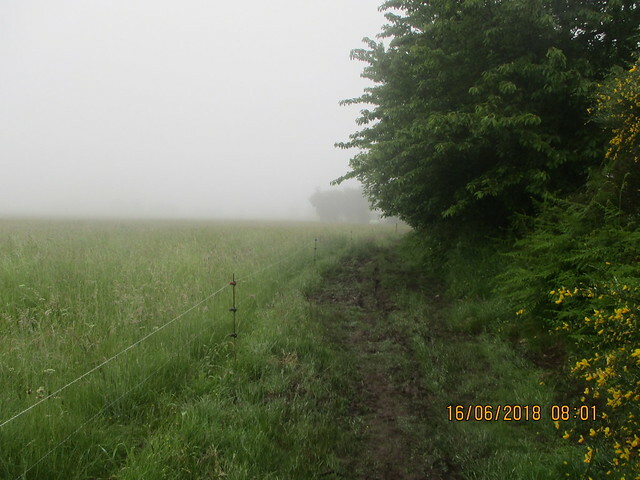 At 10 kilometres, I made my second mistake and continued following the marked route. I should have taken another route that would have taken me to Santa Irene. 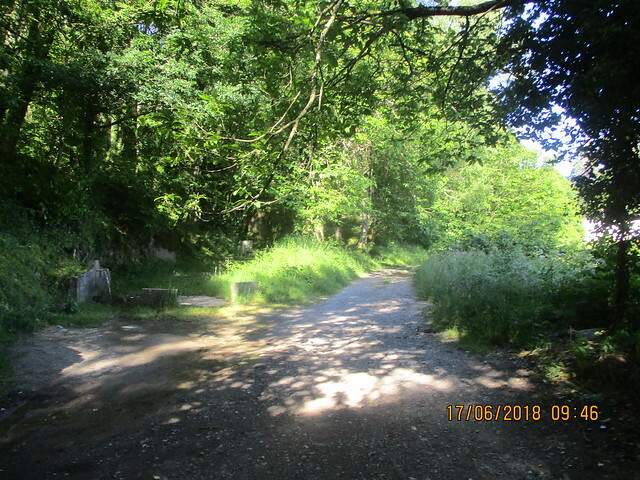 The marked route changes to gravel and then back to more road walking. A 10 kilómetros, hice otro error y seguía los mojones. Había otra ruta que tenía que seguir para llegar a Sta. Irene. La ruta señalizado cambia a grava y después una vez más a asfalto. I stopped in the shade to eat a bit, and my water was starting to run low. If I had been following the Sta. Irene route, I wouldn’t have too much more to go. Alas…Paré en la sombre un rato para comer. No me quedaba mucho agua. Si hubiera estado en el buen Camino a Sta. Irene, no me quedaría mucho…pero bueno…. 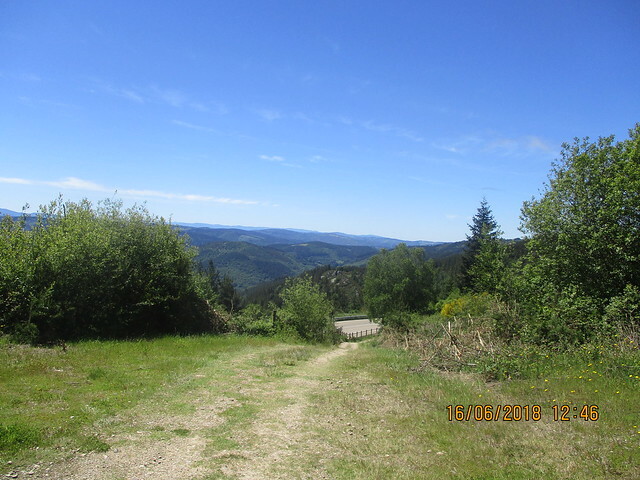 This variant would be ideal for someone who started in Boimorto and wanted to avoid the Camnio Francés as it joins up with the Camino Francés at a point only 14 kilometres or so from Santiago. I found that out too late. Este variente sería ideal para alguien que empieza en Boimorto y quería evitar el Camino Francés porque uñe el Francés en un punto donde solo quedan unos 14 kilómetros a Santiago. When I got to the 20 kilometre point, I figured out my mistake. I used maps.me to try to find my way to Sta. Irene from there, and it said 45 minutes. 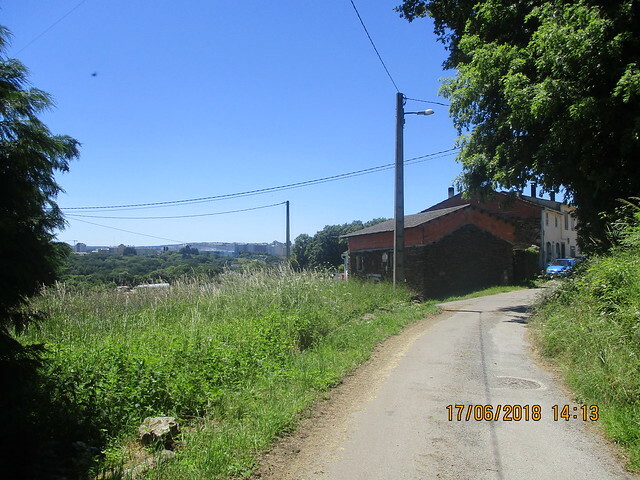 It was around 14, and it was extremely hot, especially for Galicia. I had practically no water. Cuando llegué al mojon de 20 kilómetros, me di cuenta de mi error. Abrí maps.me para encontrar una ruta a Sta. Irene, y me dijo 45 minutos. 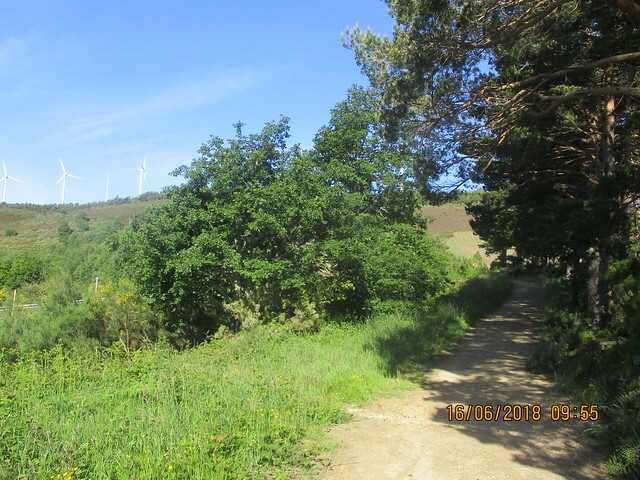 Ya eran las 14, y hacía bastante calor, especialmente para Galicia. Apenas tenía agua. The route took me uphill, just what I needed (/sarcasm). I thought maybe there would be a place to find water. No such luck. I nearly collapsed at the top under a tree and drank most of my remaining water supply. La ruta me llevó arriba. Que bien (/sarcasmo). Pensaba que quizás hubiera un sitio para encontrar agua. No tenía suerte. Casi me desmayé arriba en la sombra de un árbol y bebí lo que me quedaba de agua. Now, I usually start with a litre and a half of water, and I was barely left with water. I trudged on. Maps.me was not aware that they were building a new highway and their route was closed. Another detour had to be made. Normalmente empiezo todos los días con un litro y medio de agua. Ya apenas me quedaba. Seguía caminando arduamente. Maps.me no sabía que estaban construyendo una autovía nueva y no se podía ir por su ruta. Tenía que hacer otro desavío. I crossed the highway construction, looking at my phone every few metres, desperate to arrive to a place with water. My quest for solitude had me feeling lonely, not alone, and wanting water. Crucé las obras de autovía, mirando mi móvil cada pocos metros, desesperado llegar a un sitio con agua. La búsqueda de soledad ya me tenía sentir solo, no estar solo. Y quería agua. I was also without mobile coverage. I was supposed to call the pensión to once again confirm that I would arrive if I was to arrive after 15:00 as O Pedrouzo is full a week beforehand. It was approaching 16. También estaba sin cobertura de móvil. Tenía que haber llamado la pensión una vez más para confirmar si iba a llegar después de la 15, como O Pedrouzo está completo una semana antes. Ya era casí las 16. I was actually excited to see groups of peregrinos in the distance. I came out next to the albergue of Santa Irene. I didn’t backtrack to see the church at that point. I went inside the albergue (not a popular one as most peregrinos go on to O Pedrouzo) and asked if I could refill my water bottle. No problem, and I drank and refilled. I confirmed my arrival at the pensión, and I wouldn’t have to worry about having a bed. Estaba emocionado ver grupos de peregrinos en la distancia. 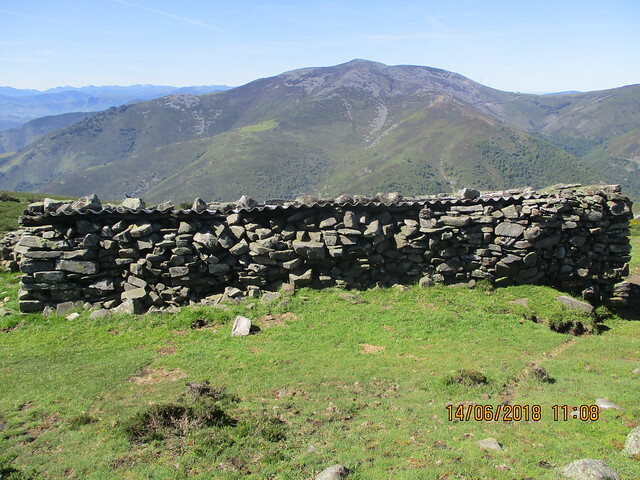 Llegué al Camino Francés justo a lado del albergue de Sta. Irene. No fui a la iglesia. Entré el albergue (no es muy popular porque la mayoría de peregrinos van hasta O Pedrouzo) y pregunté si pude rellenar la botella de agua. No había problema. Bebí y la rellene. Confirmé la llegada a la pensión, y no tenía que preocuparme de no tener cama. Yes. There were a ton of peregrinos, more than I ever had seen before. Most were with small backpacks and fresh clothes as they started in Sarria and were shipping their bags ahead every day. There were more turigrinos than peregrinos. Sí. Habia un montón de peregrinos, más que había visto en la vida. La mayoría iban con mochilas pequeñas y ropa fresca como empezaron en Sarria y estaban enviando las mochilas por Correos todos los días. Había más turigrinos que peregrinos. At one point, they have scrolling updates of how many beds were ahead in the next village. How I missed my solitude of the San Salvador and Primitivo! It was still beautiful, I can’t deny. Hay un punto donde tenía actualizaciones electrónicas de cuantas camas quedaban antes de llegar a un pueblo. 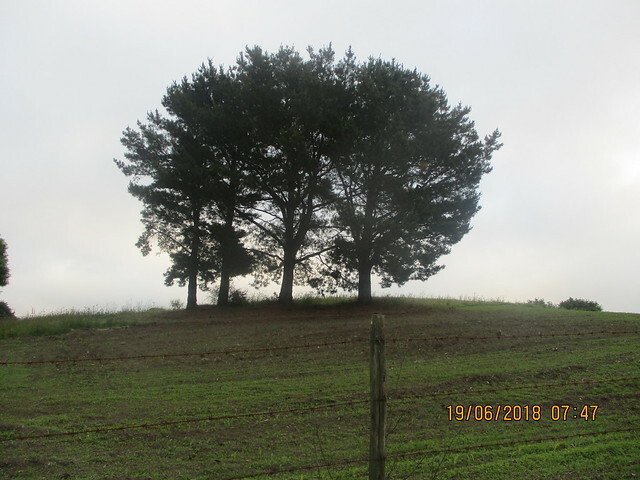 ¡Como echaba de menos la tranquilidad del San Salvador y del Primitivo. He de admitir que era muy bonito. I arrived to the pensión around 17. It was decent. I showered, stretched and rested. I made it to the pilgrim mass at 19, and it was extremely crowded. I had to wait to stamp my credentials after. Llegué a la pensión sobre las 17. Estaba bien. Me duché, estiré y descansé. Fui a la misa de peregrinos a las 19, y había mucha gente. Tenía que esperar para sellar las credenciales después. 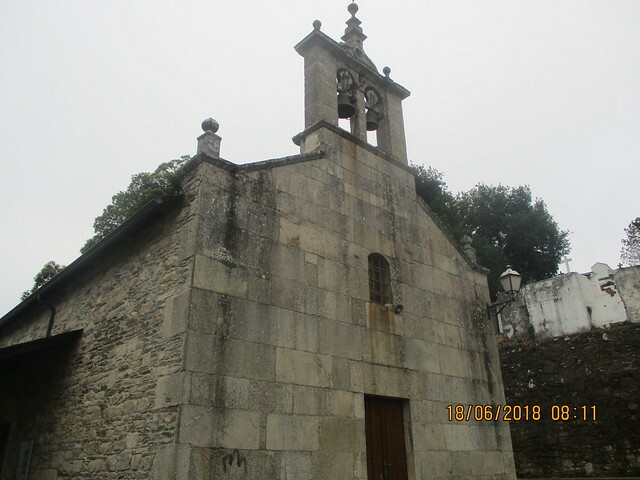 O Pedrouzo, which means “The Stone” in Galician, has a population of 618. I’d say it has more peregrinos than people who live there every day of the year. O Pedrouzo, que significaba “la piedra” en gallego, tiene una población de 618. Creo que hay más peregrinos que habitantes en cualquier día. After the mass, I went to buy a few things (including extra water) and had an early dinner. The waiter was extremely friendly, and Spain beat Iran in the World Cup that day. Después de la misa, fui a comprar algunas cosas (incluso una botella de agua de sobra) y cené pronto. El camarero era muy amable, y España ganó contra Iran en el Mundial aquel día. I watched the sunset from my hotel bed, dreading and anticipating the next day. 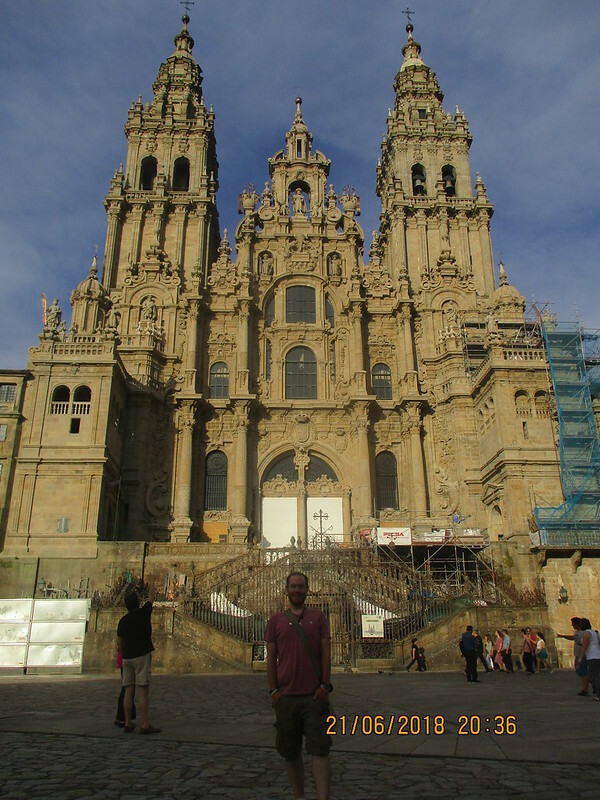 Nearly four years after my first Camino day in Irun, I was going to arrive to Santiago. Vi la puesta del sol de la cama de la pensión, anticipando y deseando que nunca llega el próximo día a la misma vez. 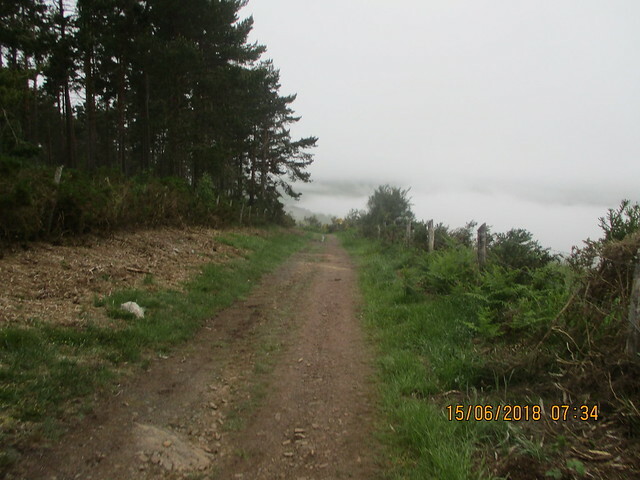 Casí cuatro años después de mi primer día del Camino en Irun, iba a llegar a Santiago. Only 19 kilometres separated me from my goal. Solo 19 kilómetros me separaron de la meta. Santiago was just three days away. 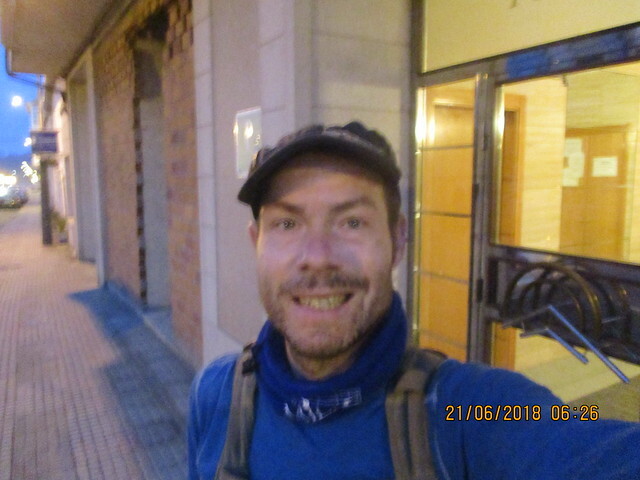 Each kilometre was another kilometre closer to arriving to my goal of the past eight years of arriving to Santiago on foot. It didn’t seem possible. Solo me quedaban tres días para llegar a Santiago. Cada kilómetro era un kilómetro menos para lograr un reto que había tenida desde hace 8 años: llegar a Santiago a pie. No parecía posible. 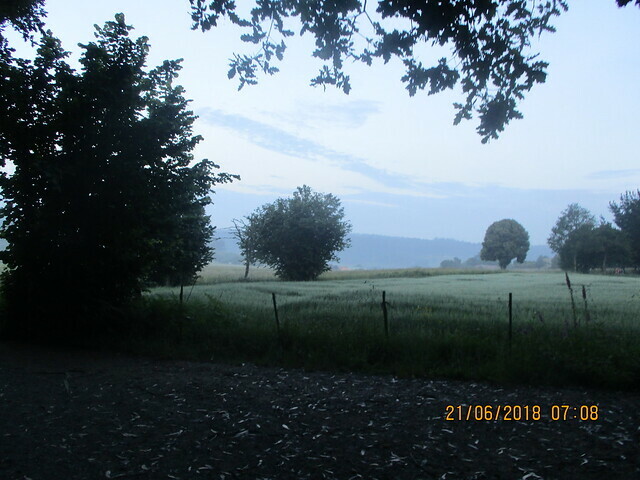 I awoke that Tuesday morning in Friol well rested. I timed leaving the pensión at the same time the bar downstairs opened (7 a.m.) so I could have breakfast before leaving. Me desperté aquella martes por la mañana en Friol bien descansado. Salí de la pensión a la misma hora que el bar abajo abrió sus puertas (a las 7) para poder desayunar antes de irme. 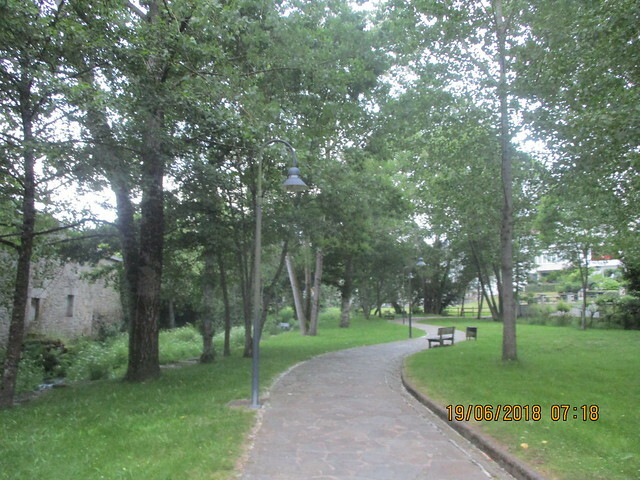 The second day of O Camiño Verde begins with a stroll by the river in the Friol park. I didn’t see any green arrows, but I had read enough online to know this was the way. Once again, the morning was full of grey skies. The clouds would dissipate throughout the day. El segundo día de O Camiño Verde empieza con un paseo por el río en el parque de Friol. No vi ninguna flecha verde, pero había leído suficiente por Internet para saber que iba en buen camino. Una vez más, el cielo estaba gris. Los nubes desaparecían durante la mañana. I was a bit worried about running into impassable mud. I had even thought about taking the road just to avoid it. With the 30ºC sun the day before, the mud was drying out and I had no problems. Estaba algo preocupado de encontrar barro que no podía pasar. 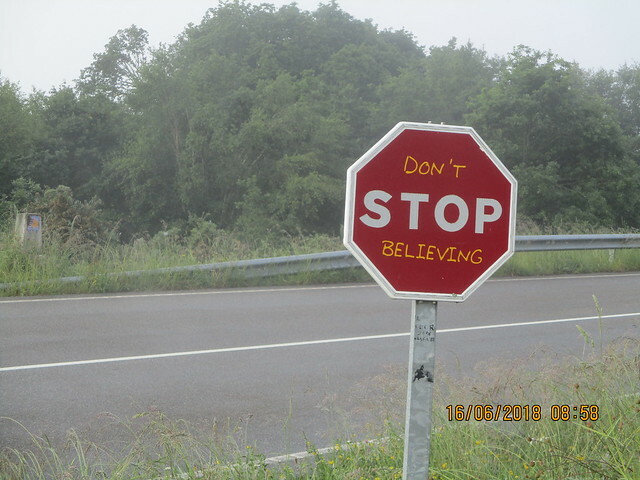 Estaba pensando en caminar por la carretera por evitarlo. Pero con el sol y 30º grados el día anterior, el barro estaba secando y no tenía problemas. 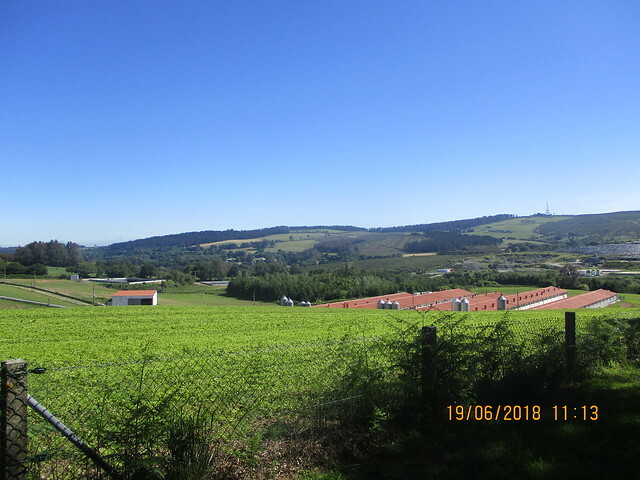 O Camiño Verde passes through some beautiful Galician farmland and back roads. Around 9:30 I arrived to the bottom of a hill. The sun had made its appearance and the heat was rising. I could go to the road, which would take me to Sobrado dos Monxes much quicker, or I could continue with the green arrows. 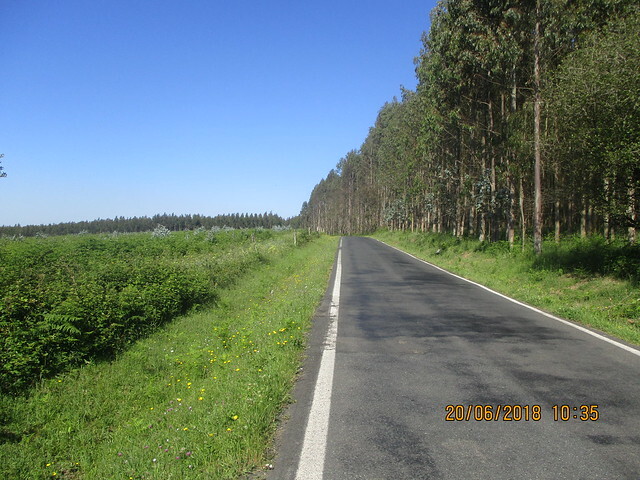 O Camiño Verde pasa por campos gallegos bonitos y carreteras secundarias. Sobre las 9.30, bajé una colina. El sol ya había aparecido y el día estaba calentando. Podía ir hacía la carretera hacía Sobrado dos Monxes, que ahorraría bastante tiempo, o podía seguir las flechas verdes. 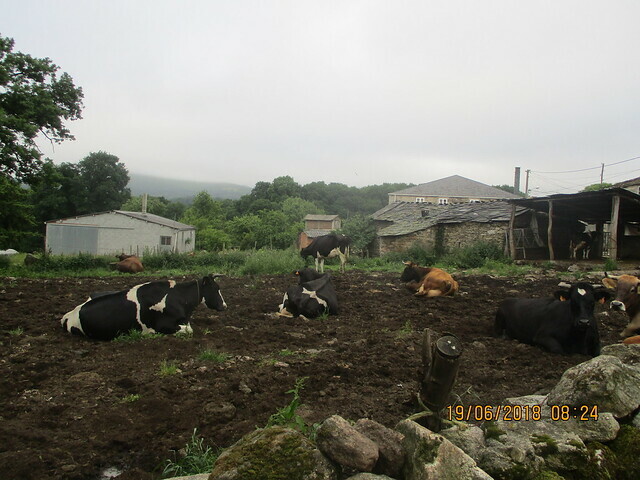 I went through small populations and saw farms, cows, dogs and other sights of rural Galicia. 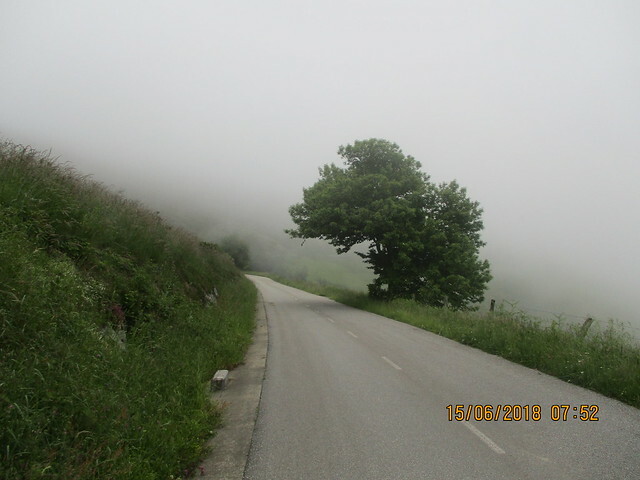 I wasn’t sure if I wanted to arrive to O Mesón where O Camiño Verde ended or enjoy the isolation and quiet. 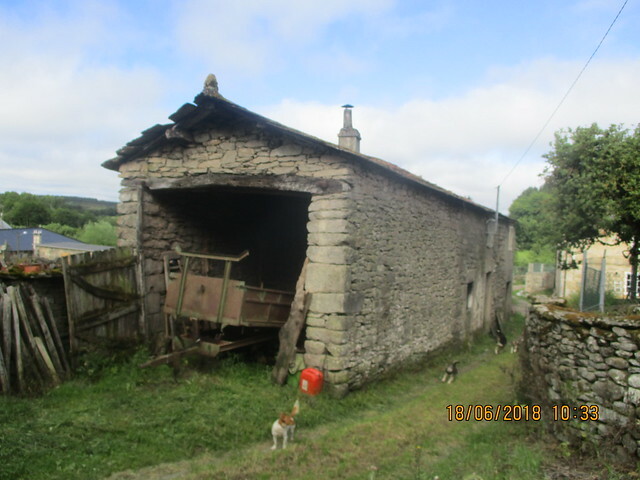 Pasé por poblaciones pequeñas y vi granjas, vacas, perros y otras cosas comunes de Galicia profunda. 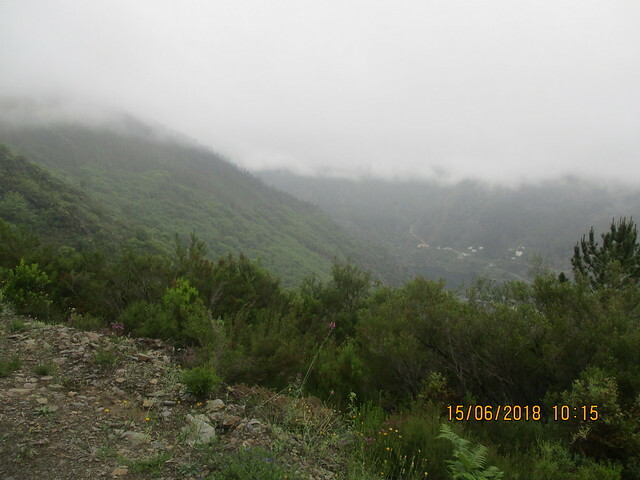 No sabía si quería llegar a O Mesón donde O Camiño Verde acaba o disfrutar más el aislamiento y tranquilidad. I arrived to O Mesón and immediately saw a bunch of peregrinos. Granted, I’m sure there were far more on the Francés, but the peregrinos del Norte were increasing steadily from my prior adventures on it. It felt right to be on the Norte again, but I already missed the solitude of el Primitivo and el San Salvador. Llegué a O Mesón y inmediatamente vi bastantes peregrinos. Vale, seguro que hay más en el Camino Francés, pero los peregrinos estaban aumentando aún más desde mis aventuras anteriores. Me sentí bien estar en el Norte otra vez, pero ya echaba de menos la tranquilidad del Primitivo y del San Salvador. I stopped at a bar, but they no longer give cake to peregrinos from O Camiño Verde. Darn. The café was good though. (Note: O is “the” in Galician, and I can’t right “the O”!) Fui a un bar, pero ya no daban tarta a los peregrinos de O Camiño Verde. Bueno. El café estaba bueno. (Nota: “O” es “el” en gallego, y no puedo escribir “el O” jaja). 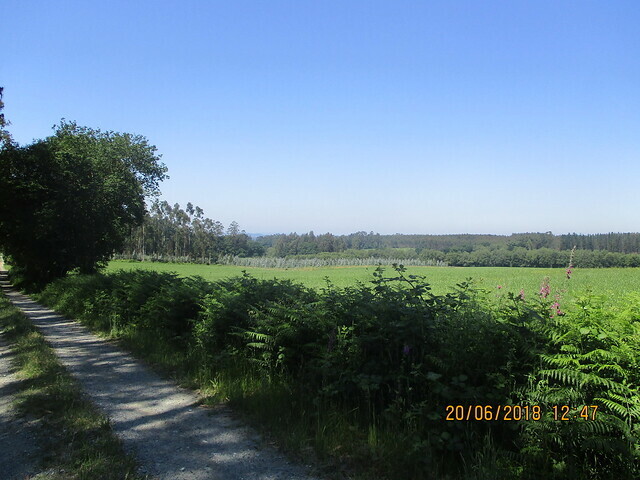 The last bit of the Camino del Norte that day went through a forest with beautiful views. Even near its end, it is a delight. It also went up, down and all around. 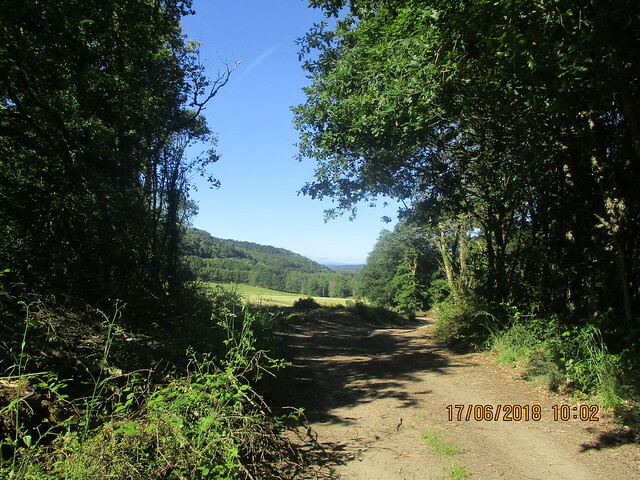 La última parte de esta etapa del Camino del Norte pasó por un bosque con vistas preciosas. Incluso al final del camino, es un placer. 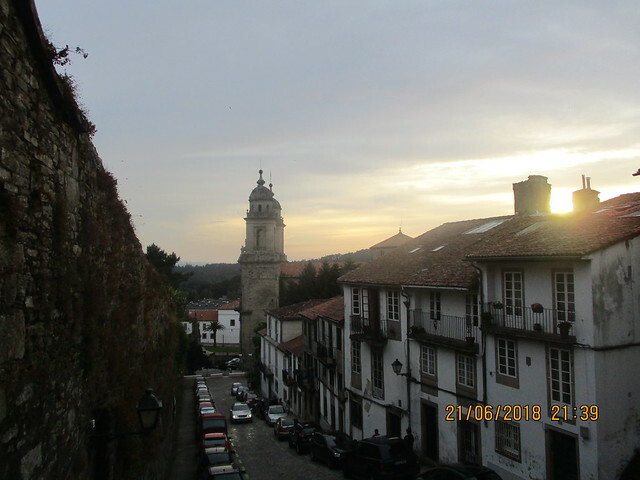 I wanted to stay at the albergue in Sobrado dos Monxes, even if it meant for a long penultimate day. 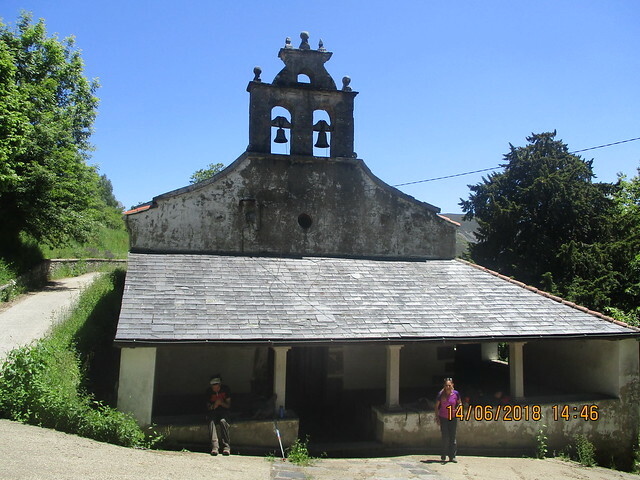 The village of 1847 residents is officially known as Sobrado, but everyone adds the Galician “of the monks” to its name. 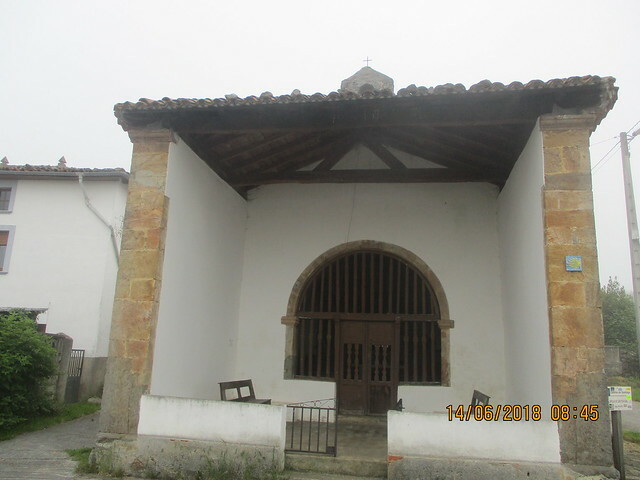 The albergue is located in the Monasterio de Santa María de Sobrado. Quería dormir en el albergue en Sobrado dos Monxes, aunque significaba que tendría un penúltimo día muy largo. 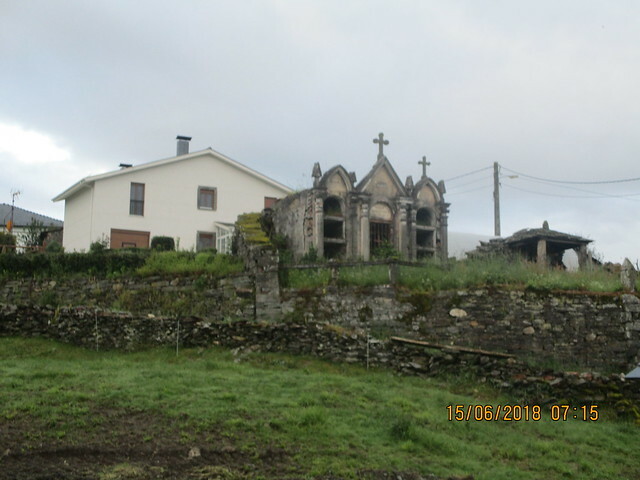 El pueblo de 1847 habitantes se llama oficialmente Sobrado, pero es más conocido con dos monjes en gallego después del nombre. 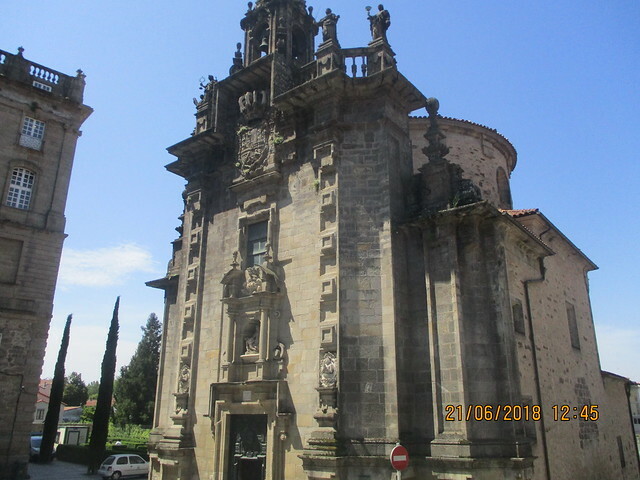 El albergue está situado en el Monasterio de Santa María de Sobrado. Construction on the beautiful monastery began in 952. I checked in and showered quickly, as it is closed between 13:30 and 16:00. The monk who checked me in was very friendly and funny. 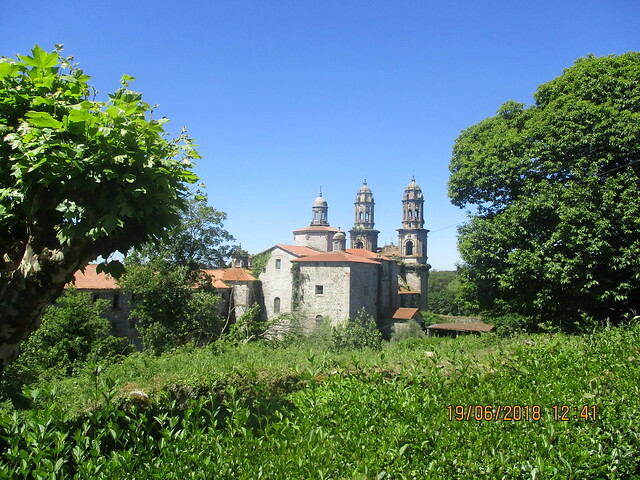 La construción del monasterio precioso comenzó en 952. Me registré y me duché rápidamente, porque el monasterio se cierra entre las 13:30 y las 16. El monje que me registró era muy amable y gracioso. I had a menú del día and rested near the monastery until it opened again. I also explored the nearby church. I would have liked to have gone back out to the lake I had seen a kilometre outside of town, but I was too tired for that. Comí un menú del día y descansé un rato a lado del monasterio hasta que se abrió otra vez. También exploré la iglesia que estaba justo a lado. 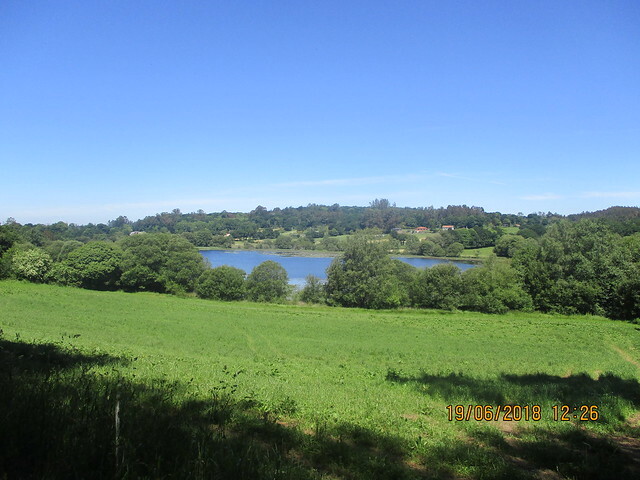 También me habría gustado visitar el lago que estaba a un kilómetro antes del pueblo si no estuviera tan cansado. I met a few peregrinos from the Norte, but the camaraderie I had with those on the Primitivo wasn’t there. There were a few annoying ones who I avoided at all cost. 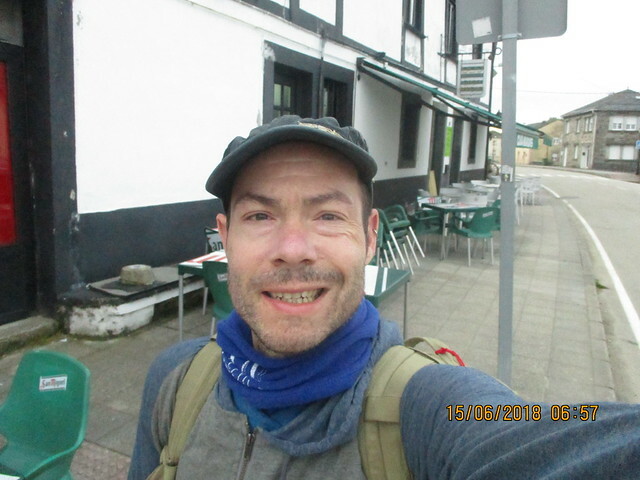 When I saw the German peregrino from O Camiño Verde, we were old friends and talked about our adventures and shared stories. Conocí a unos peregrinos del Norte, pero las amistades que tenía con los del Primitivo no estaban allí. Había unos muy pesados quien evité como pudiera. 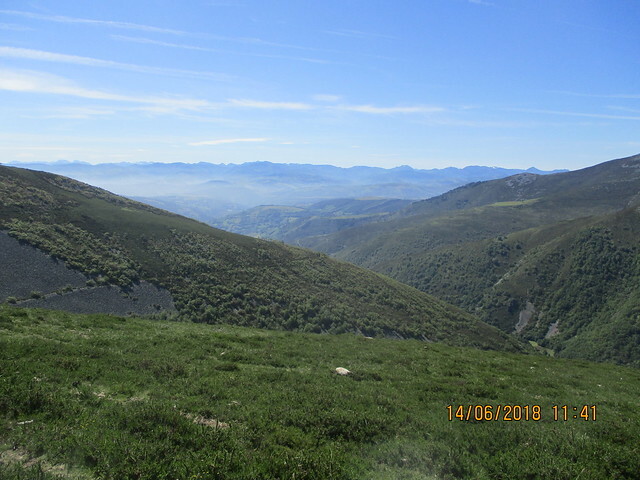 Cuando vi el peregrino alemán de O Camiño Verde, era como si fuésemos amigos viejos y hablamos de nuestras aventuras y compartimos historias. I was so ready to arrive to Santiago, even if it meant my adventure was over. Estaba más que listo llegar a Santiago, aunque significaba que la aventura ha acabado. At 19:00, the monks have an “oratorio”, which is chanting-prayer of sorts. It was interesting to see. A las 7, los monjes tienen un servicio oratorio, que es algo de una combinación de canto y oración. Era interesante ver. I had a small dinner in town before watching the sun set from the monastery. While there were more peregrinos than I had seen in the entire 390 kilolometres I had walked so far, it was going to get worse. 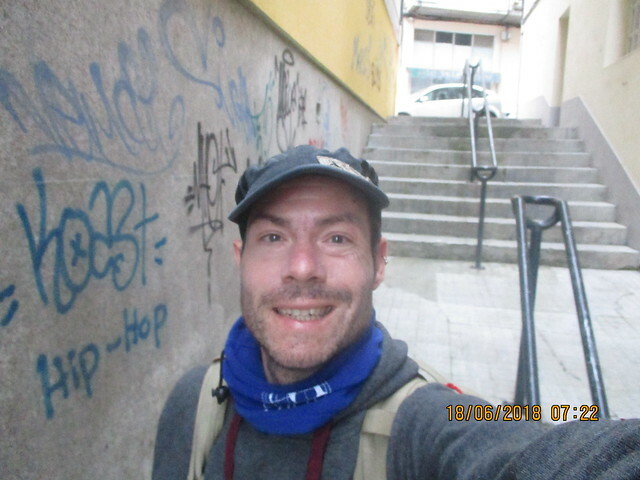 I was dreading the impending Camino Francés, and I was going to do whatever I could to avoid it for as long as possible. 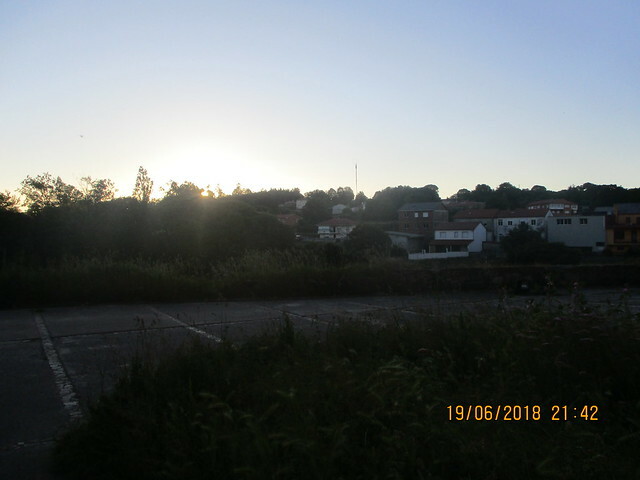 Cené un poco en el pueblo antes de ver la puesta de sol desde el monasterio. Aunque eran más peregrinos que había visto en todos los 390 kilómetros que había caminado hasta este punto, iba a empeorar. No quería ni pensar uñir el Camino Francés, y iba a hacer lo que pudiera para evitarlo por tanto tiempo como posible. Even if it meant….Aunque significaba…. 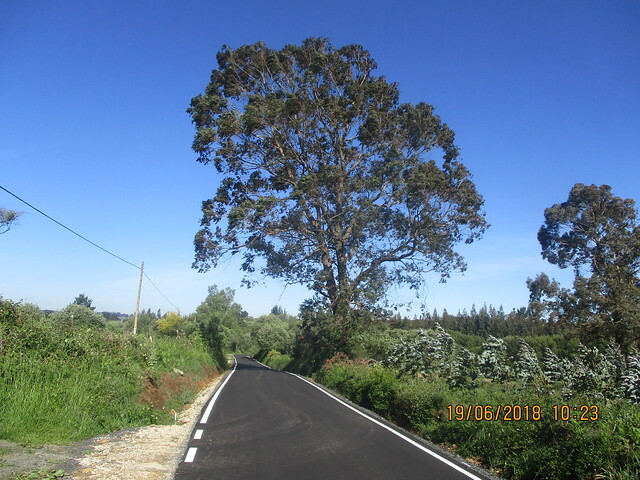 O Camiño Verde Etapa 1. 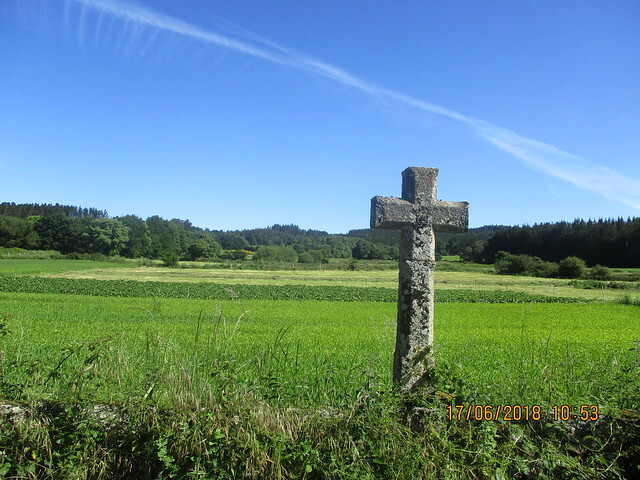 (Camino de Santiago-Camino Primitivo Alternative). 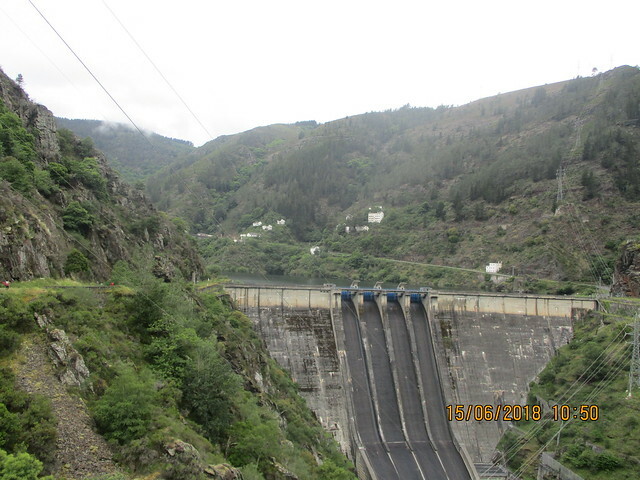 Lugo-Friol. I took a chance, and it paid off beautifully. 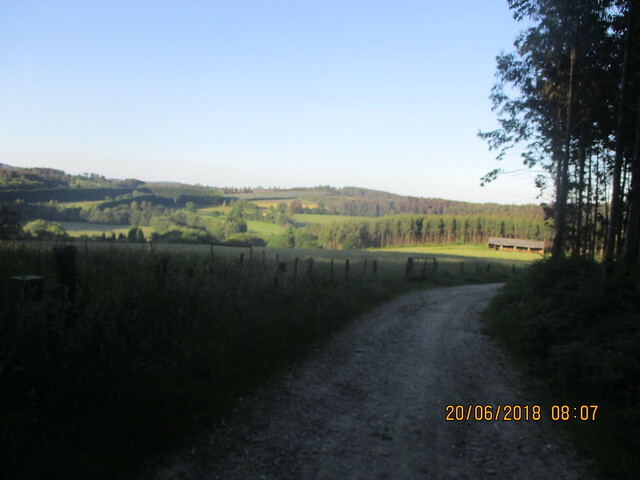 The Camino provided me with exactly what I needed. 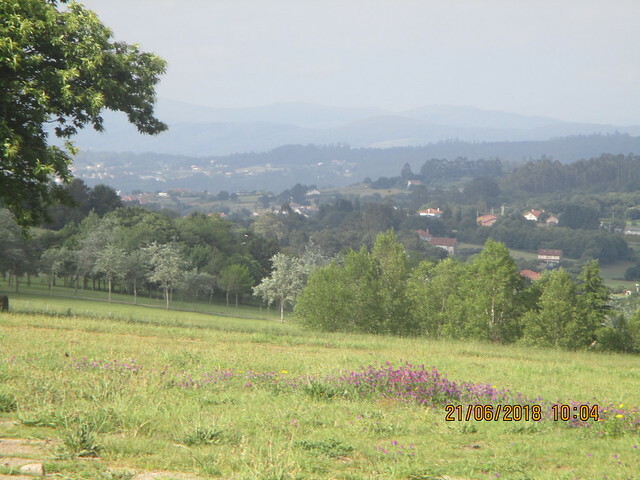 Complete solitude in the beautiful Galician countryside. Me arriesgué, y la resulta fue genial. El Camino me premió con lo que me hacía falta. Estaba solo para contemplar el paisaje gallego precioso. 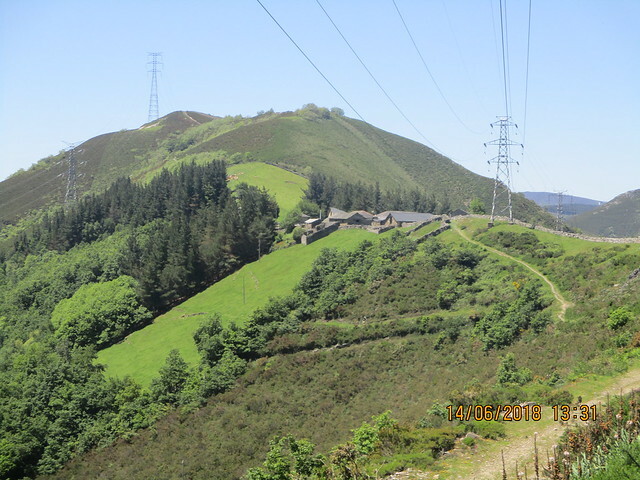 For those brave peregrinos on the Primitivo who want to avoid the crowds of the Camino Francés as long as possible, there is a two-day, 50 kilometre alternative that links up with the Camino del Norte. It’s known as the “O Camiño Verde”. 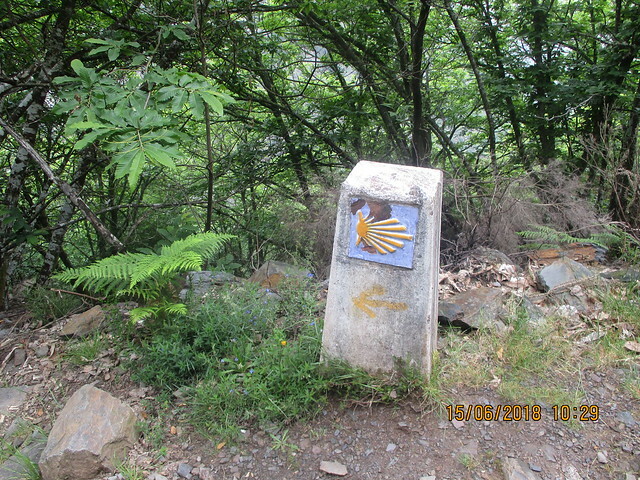 Thanks to José Manuel Sánchez Grande, known as xmsg on Camino forums, the trail is marked with green arrows. Para los peregrinos más atrevidos que hacen el Primitivo quien quieren evitar los multitudes del Camino Francés durante tanto tiempo como posible, hay una alternativa que dura dos días y 50 kilómetros que conecta el Camino Primitivo con el Camino del Norte. Es conocido como “O Camiño Verde”. 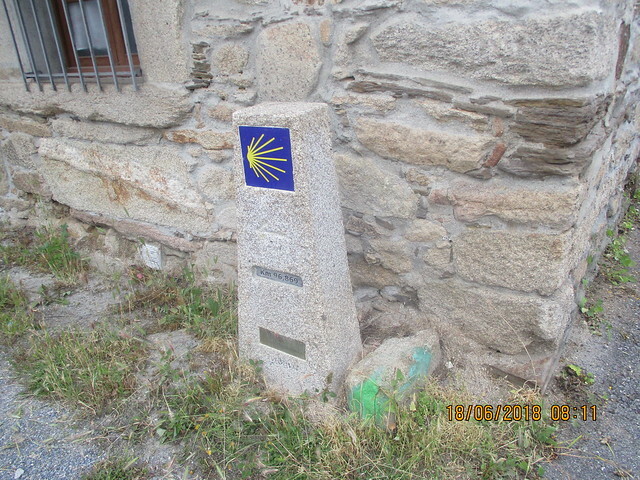 Gracias a José Manuel Sánchez Grande, conocido como xmsg en los foros del Camino, el camino es señalizado con flechas verdes. 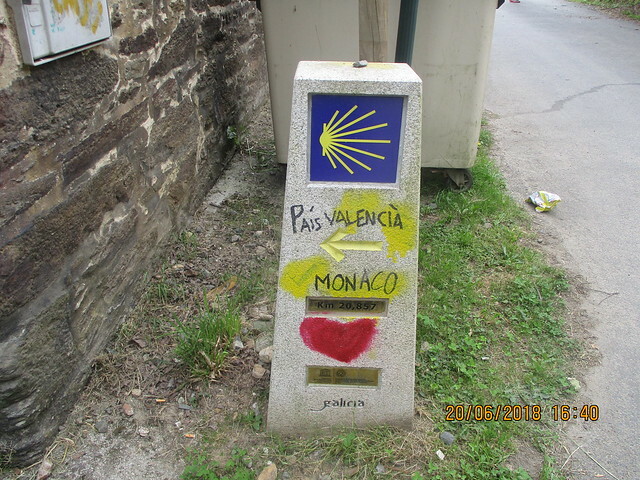 I say “brave peregrinos” because this is not an official Camino. There aren’t many services, no albergues, it’s easy to get lost, and at times you have to cut across large grass and weeds or cross rivers. 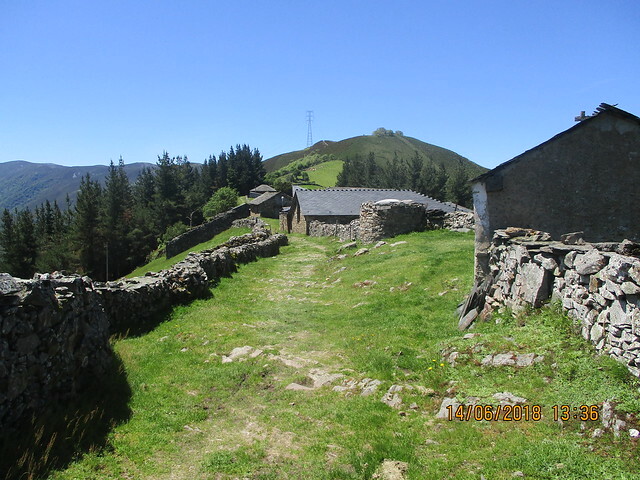 I only saw one other peregrino, and that was at the Friol pensión, Casa Benigno, which gives a great pilgrim discount. Digo “peregrinos atrevidos” porque no es un Camino oficial. Carece de servicios y albergues, es fácil perderse, y a veces hay que cruzar pastura alta o ríos. 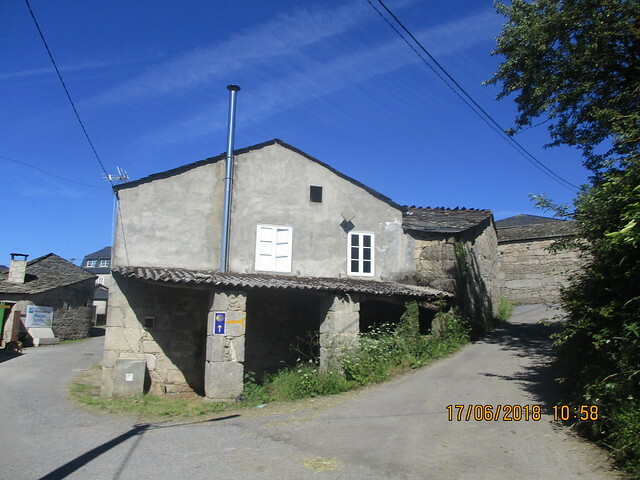 Solo vi a solo un peregrino más que yo, y eso era en la pensión de Friol, la Casa Benigno, que da un buen descuento a los peregrinos. 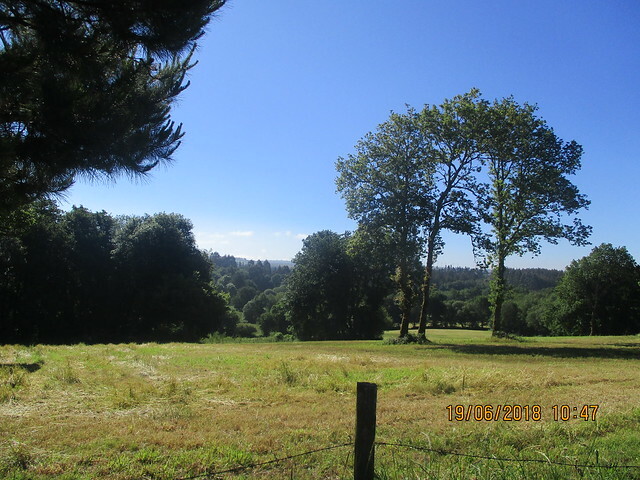 After suffering from the crowds of the medieval festival in Lugo, I was ready for some peace, quiet and solitude. I definitely found it. Después de sufrir con los multitudes del festival medieval en Lugo, estaba listo para paz y tranquilidad. 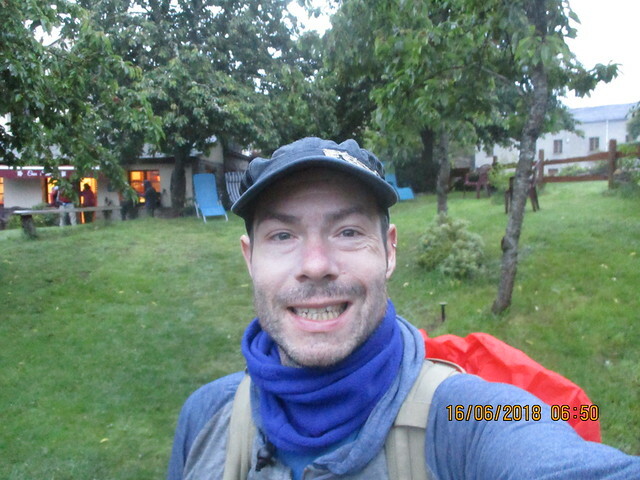 I had a bit of a lie-in, for the Camino that is, until 7. I had breakfast at a bar named Faison, who is my all time favourite General Hospital villain (Felicia is my fave character and I still reference fuzzy handcuffs 19 years later, even if I haven’t watched the show since 2005). I stopped at Roots and Boots, as I remembered that place from the year before and loved it. They have an albergue, but I can only attest to the café part. Dormí tarde por el Camino, hasta las 7. Desayuné en un bar que se llamaba Faison, quien es mi malo preferido de General Hospital (Felicia es mi personaje favorita, y todavía hablo de las esposas mullidas 19 años después, y dejé de ver la telenovela en 2005). Paré en Roots and Boots. Recordaba ir a este bar el año pasado y me gustaba mucho. También tiene un albergue, pero solo puedo hablar del bar. I saw several peregrinos. 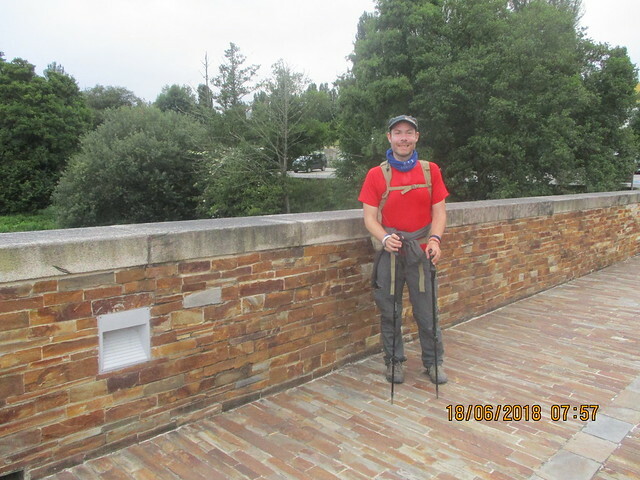 A French peregrino and I took photos of each other on the beautiful Roman bridge crossing the River Minho. Vi muchos peregrinos en la salida de Lugo. 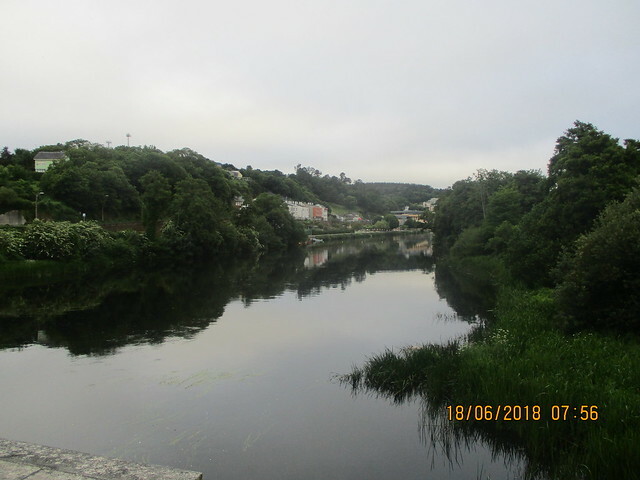 Un peregrino francés y yo nos hicimos fotos en el puente romano hermoso que cruce el Río Mino. Shortly after crossing the Roman bridge comes the decision. I would say 98% of peregrinos continue with the Primitivo. 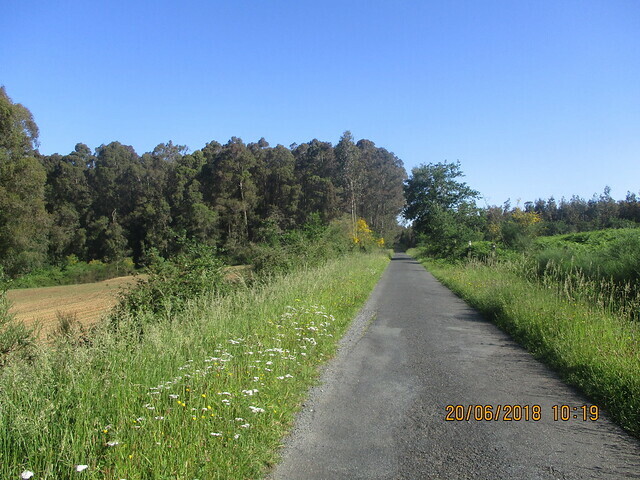 I saw someone take O Camiño Verde before me, but after I passed her, I never saw her again so I’m not sure if she took another Camino alternative or whatever happened to her. Después de cruzar el Puente Romano, hay que tomar una decisión. Diría que 98% de los peregrinos siguen con el Primitivo. Vi a alguien tomar O Camiño Verde antes de yo, pero después de adelantarla, nunca la vi otra vez. 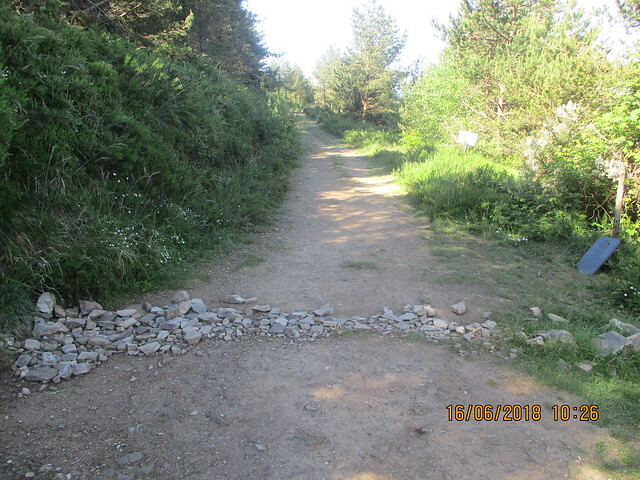 No sé si hizo otra alternativa del Camino o que le pasó a ella. 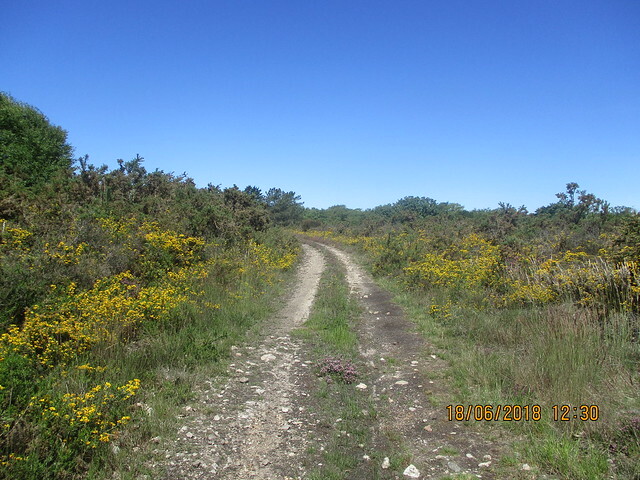 Cosas del Camino. 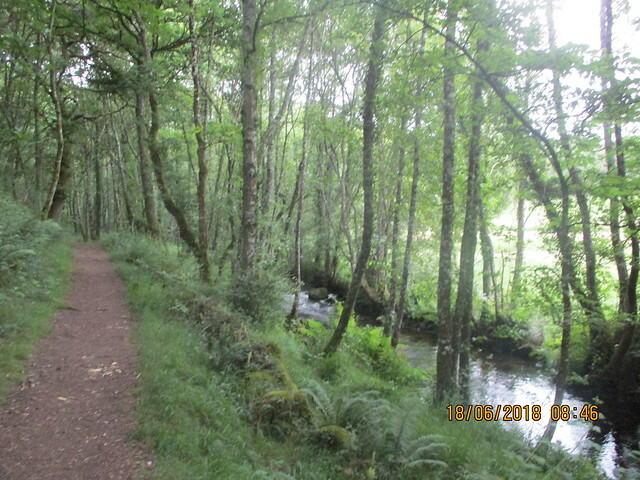 O Camiño Verde begins with a trail by the river that goes through a forest. 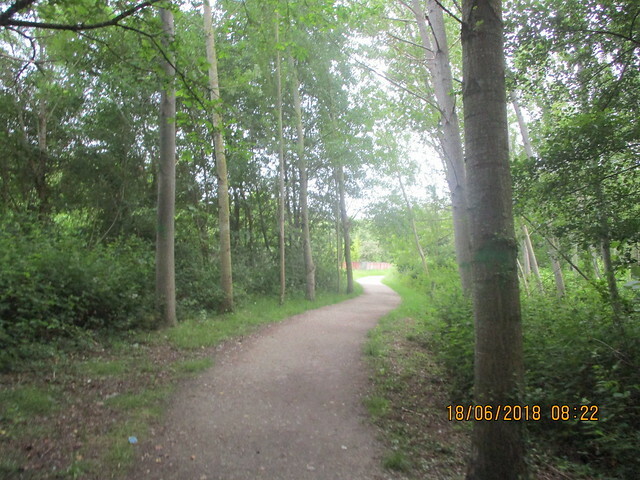 It has a bit of road walking too. I felt as if I were in a fairy tale inspired by the Black Forest. 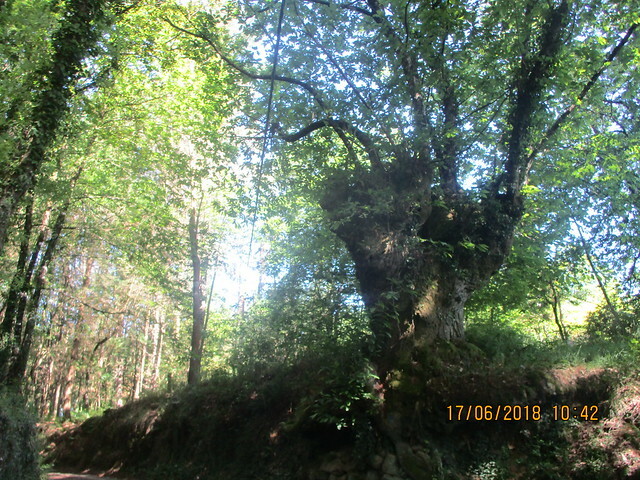 O Camiño Verde empieza con una senda por el río que pasa por un bosque. También hay bastante por carretera. Me sentí como si estuviera en un cuento de hadas inspirado por la Selva Negra. 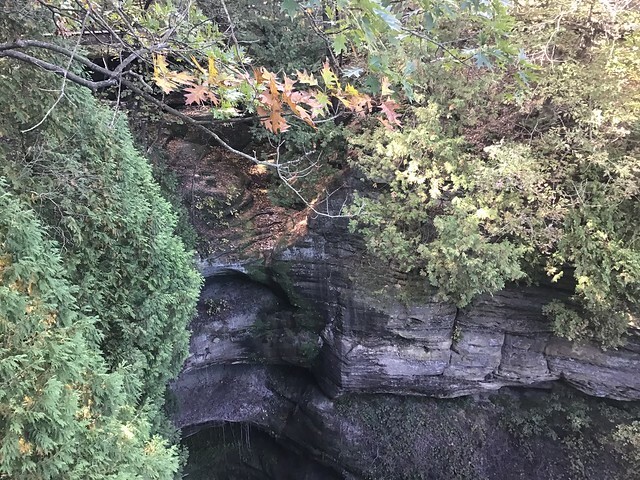 After about 45 minutes I came to a building next to a waterfall. Cue the Twin Peaks theme. Después de unos 45 minutos, llegué a un edificio a lado de unas cascadas. Imaginé el tema de Twin Peaks. 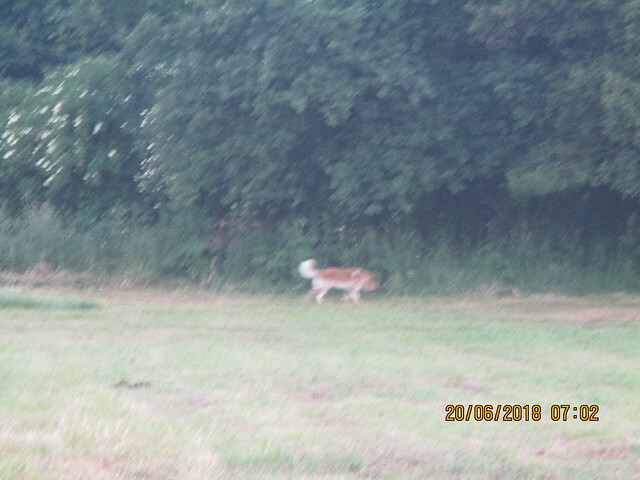 Then I had to cross a meadow in the woods with very tall grass. It was a chore to wade through. The solitude was worth it. Después, tenía que cruzar un prado por el bosque con césped muy alta. Me costaba cruzar. Pero el aislamiento merecía la pena. 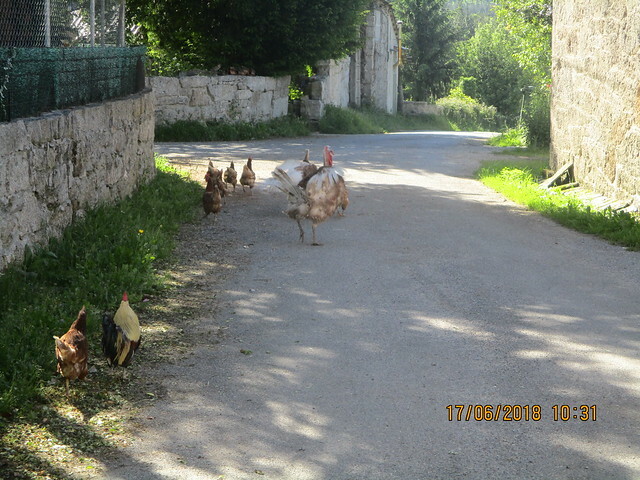 I saw a few people in the small villages I passed through. One even stopped to ask me if this was the “Camiño Verde” as he didn’t know it passed through there. 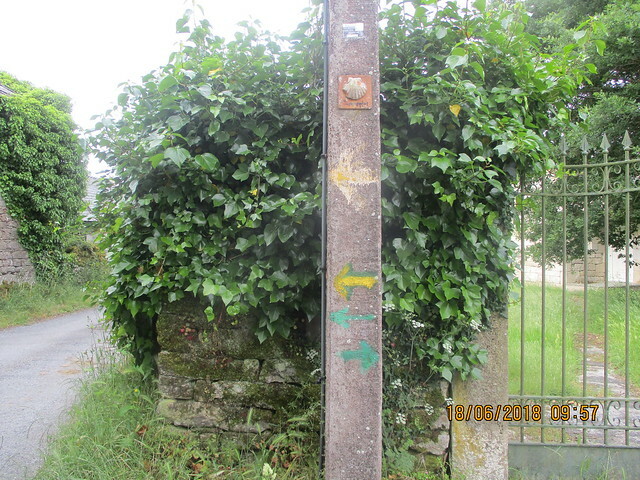 In typical Galician fashion, one post had green arrows marking two distinct ways, one following SOME official Camino with a yellow arrow. I think it goes by a church or monestary that the current Primitivo doesn’t pass. Vi pocas personas en las aldeas. Uno me paré para preguntar si estaba haciendo O Camiño Verde como no sabía que pasaba por allí. 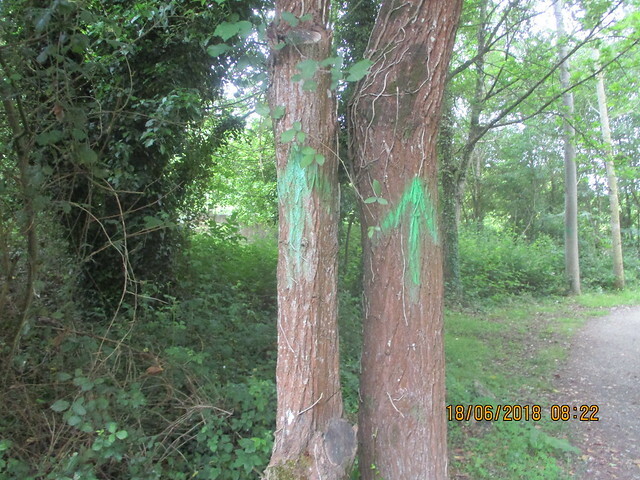 Como el tópico gallego, un señal tenía flechas verdes señalizado ambas direcciones. Uno seguía ALGÚN Camino oficial con una flecha amarilla. 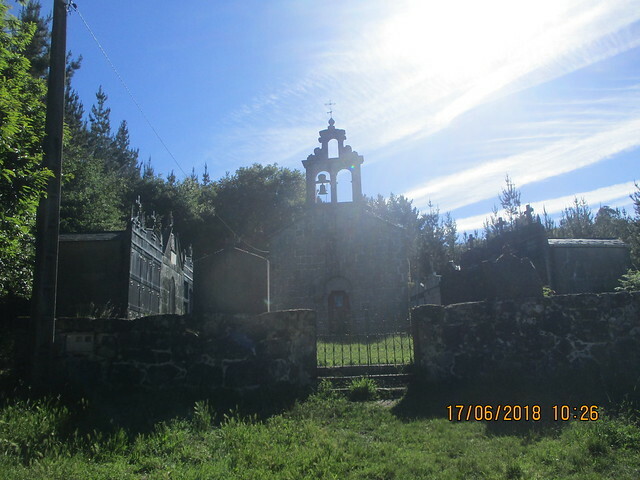 Creo que pasa por una iglesia o monasterio que el Primitivo actual no pasa. I came across a few muddy places. At one point, I wasn’t sure where which right turn the green arrows wanted me to take, but after 100 metres of nothing looking right, I returned to the road to see the turn was ahead. I also found two four-leaf clovers! Pasé unos sitios barrosos. En un punto, no sabía cual giro a la derecha las flechas verdes estaban señalizando, pero después de unos 100 metros donde nada parecía correcto, volví a la carretera para ver que el giro a la derecha estaba por delante. I arrived to Friol around 13:30 and had an Aquarius in the first bar just to stamp my credentials. 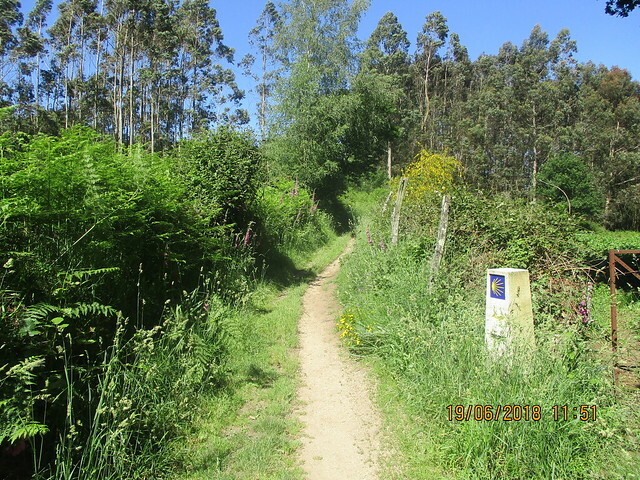 I was in the last 100 kilometre stretch so needed two a day to qualify for the Compostela in Santiago. Llegué a Friol sobre las 13.30 y tomé un Aquarius en el primer bar para sellar las credenciales. 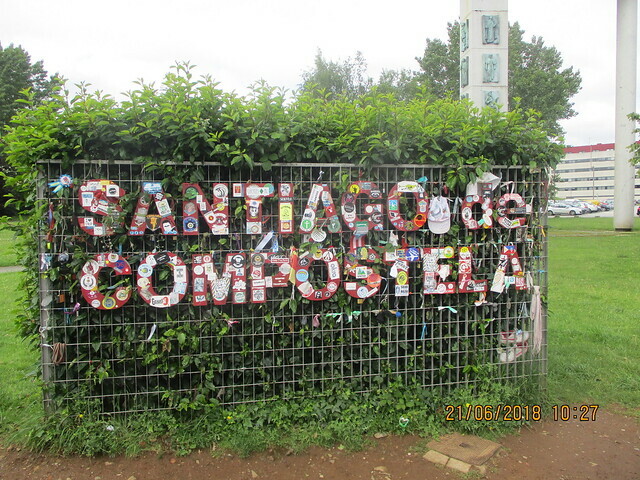 Estaba en los últimos 100 kilómetros y hace falta dos sellos cada día para conseguir la Compostela en Santiago. I checked into the pensión and had a great lunch. I remember either a Partido Popular scandal or a 45 scandal on the news, but since both have new ones every hour, I can’t remember which was the responsible one or which scandal it was. Melania’s coat was the same day I arrived to Santiago, but I really don’t care, do you?) . Hice check-in en la pensión y comí bien. Recuerdo que había algún escándalo o del Partido Popular o de Trump en las noticiás, pero como los dos tienen uno nuevo cada hora, no recuerdo cual era el responsable o cual escándalo era. La chaqueta de Melania era el mismo día que llegué a Santiago, pero a mi no me importa nada, ¿y a ti? The pension was nice, and I rested a bit and even saw an episode of Friends. 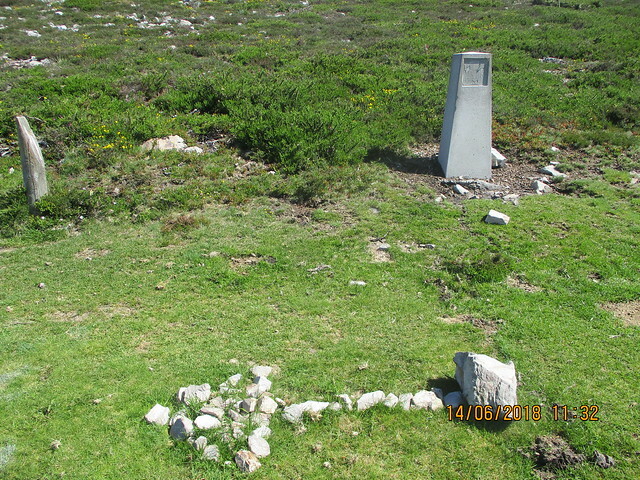 The pilgrim price was 16€ in 2018. La pensión estaba bien, y descansé un rato y vi un capítulo de Friends. El precio de peregrino era 16€ en 2018. 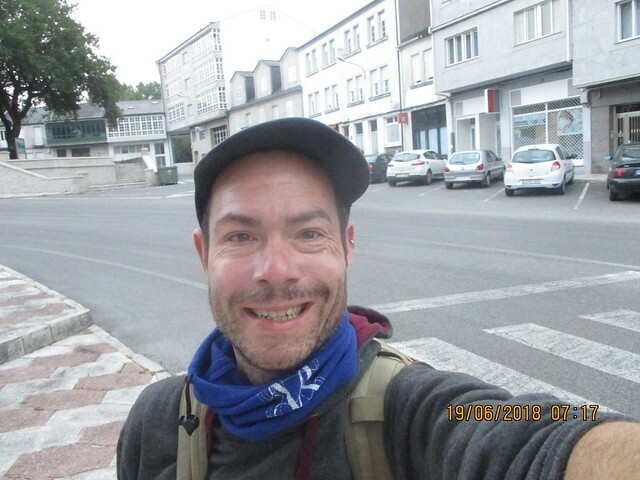 I met an interesting German peregrino who had left from his house in Germany a few months ago who was also dreading the hordes of people on the Francés. Conocí a un peregrino aleman interesante. Hace unos meses había empezado en su casa en Alemana y tampoco quería estar con toda la gente del Francés. 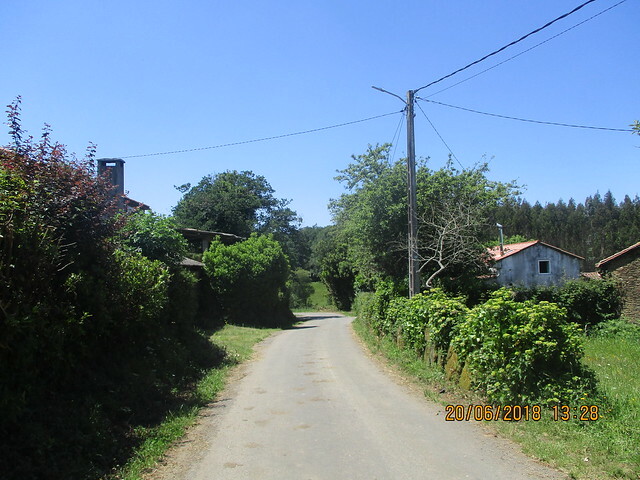 It was extremely hot for Galicia, even in the summer, so it wasn’t until about 19:00 when I ventured out to explore the town of 4533 inhabitants. I went to the church but they were giving mass to one person so I didn’t go inside. I got dinner (empanada de carne) and some cold water at a supermarket. 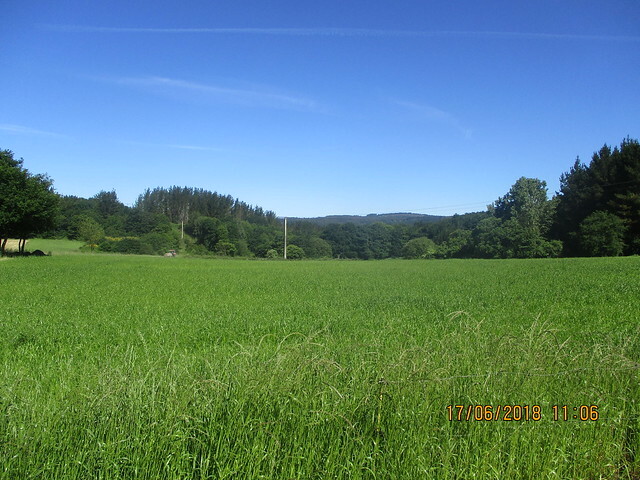 Hacía mucho calor para Galicia. No fui a explorar el pueblo de 4533 habitantes hasta les 19. Fui a la iglesia pero estaba dando misa a solo una persona. Por eso, no entré. Compré la cena (empanada de carne) y agua fresca en un supermercado. 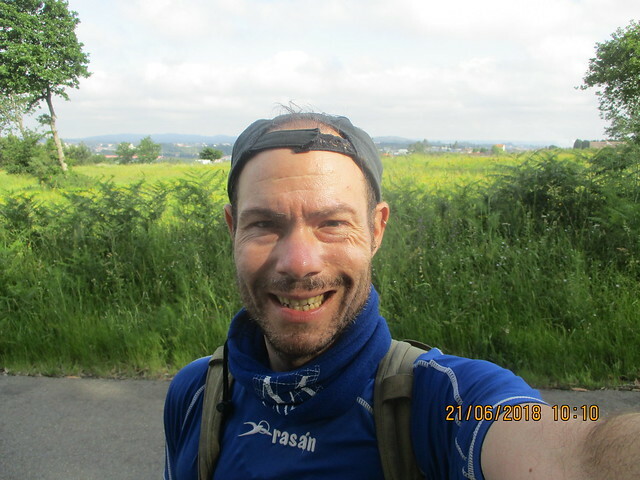 There is a difference between being alone and being lonely, and I was quite happy to be alone to reflect on the Camino, the past year and the immediate future in a positive way. Hay una diferencia entre estar solo y sentirse solo. Estaba contento estar solo para reflexionar en el Camino, el año pasado y el futuro inmediato en una manera positiva. Santiago was just three days away. Solo me quedaban tres días hasta mi llegada a Santiago. Sometimes you gotta do what you gotta do. A veces hay que hacer lo que tienes que hacer. 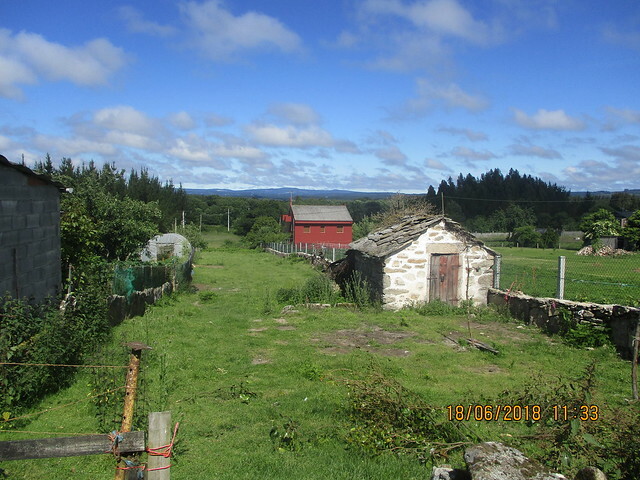 I had already booked a pensión in Santiago for Thursday night when I thought I was going to head to Ourense to finish via the Camino Sanabrés. 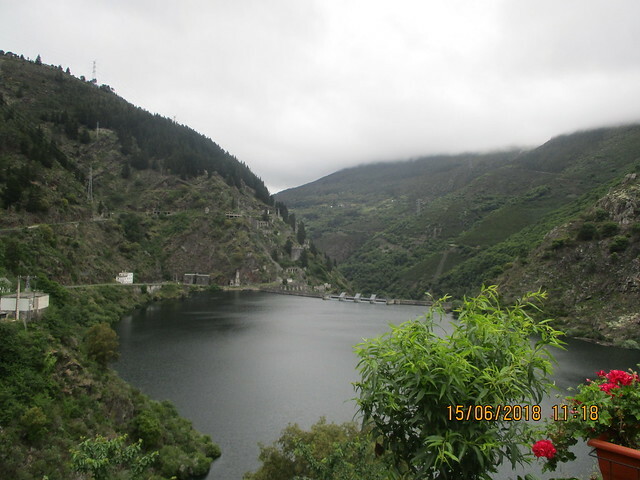 I changed my mind, and while I was able to find lodging in Lugo, Santiago was already pretty booked. I knew I didn’t want any more albergues once I arrived there, and I didn’t want to pay 100€ a night, so I decided to catch the bus from A Fonsagrada to Castroverde, skipping one stage. 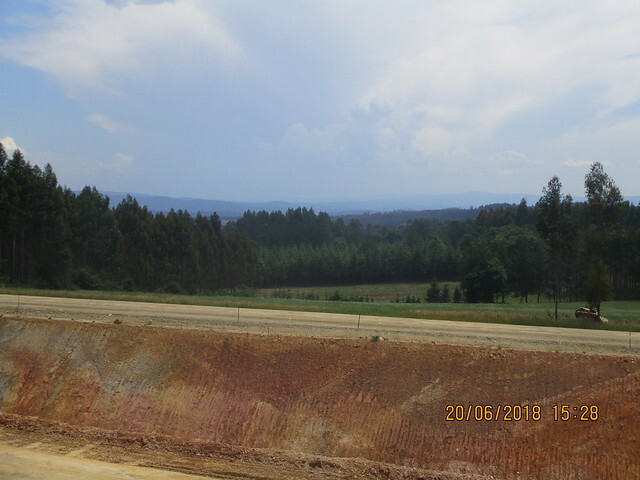 Ya había reservado una pensión en Santiago para jueves cuando estaba pensando en ir hasta Ourense para acabar el Camino con el Sanabrés. Me cambié de mente. Pude encontrar alojamiento en Lugo, pero ya quedaba poca cosa en Santiago. 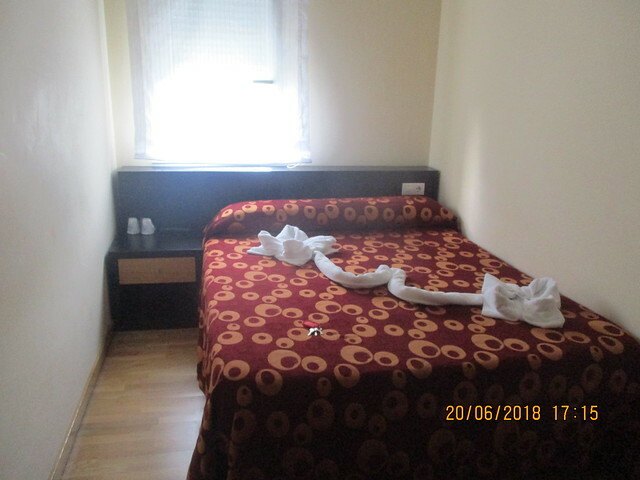 Sabía que no quería dormir en un albergue después de llegar a Santiago, y tampoco quería pagar 100€ para una noche. Decedí coger el autobús desde A Fonsagrada a Castroverde, adelantándome una etapa. 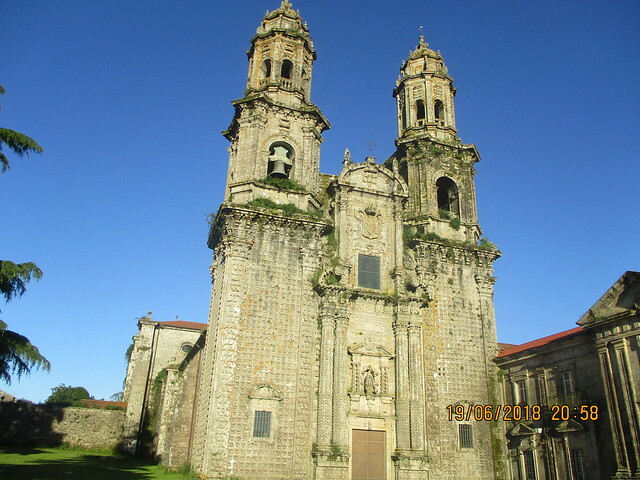 I felt bad, but I also wanted to see more places in Galicia post-Camino. Me sabía mal, pero también quería ver más sitios gallegos después del Camino. It turns out I wasn’t the only peregrino waiting for the bus that morning. 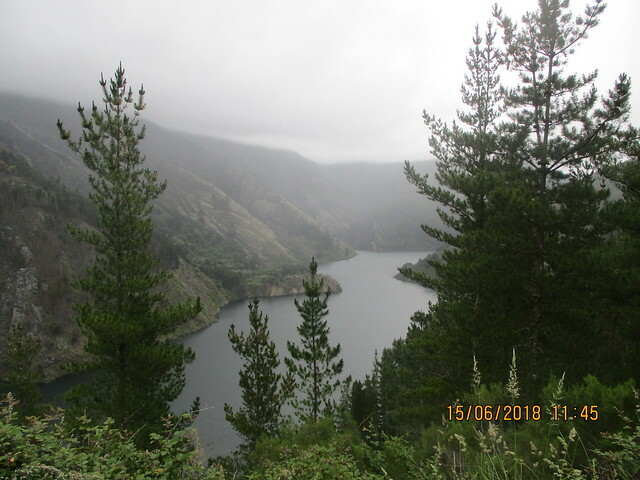 The Andorrans were only doing about 10 km due to the husband’s leg still giving him problems, and the Valencians had to return to la ciutat de caloret. It was a morning of goodbyes. Al final, no era el único peregrino que estaba esperando el autobús. Los andorranos solo iban a caminar unos 10 kilómetros porque todavía le dolía la pierna al marido. Los valencianos tenían que volver a la ciutat de caloret. Era una mañana de despedidas. It was around 9:20 when I arrived to Castroverde. 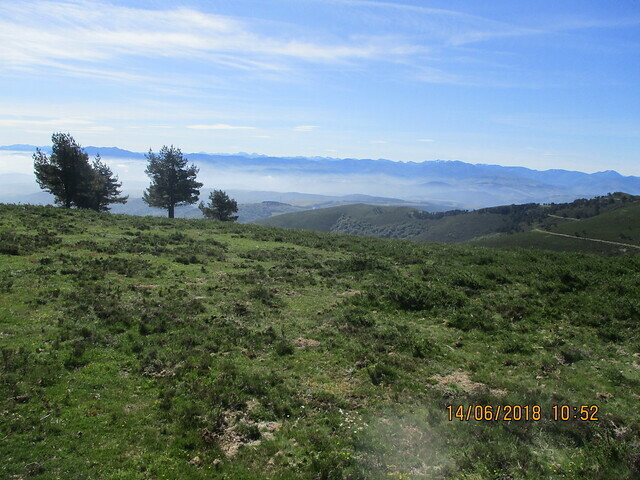 I stopped for a café con leche and stamp and found my way to the Camino. 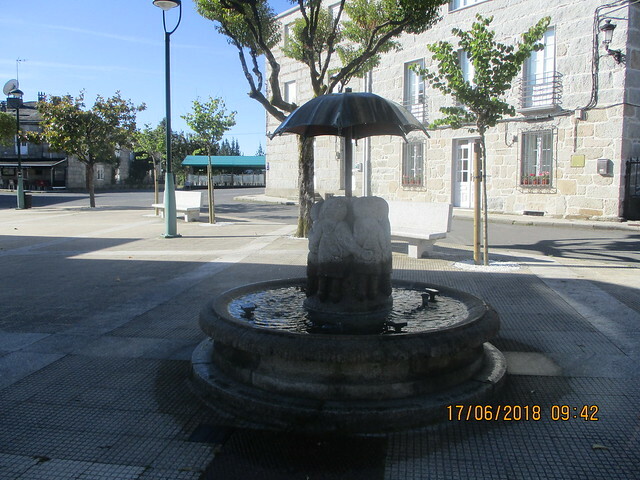 I immediately saw a bunch of peregrinos, so I killed a bit of time taking pictures of the church (closed, on Sunday morning) and fountain in the main plaza. Era sobre las 9.20 cuando llegué a Castroverde. Tomé un café con leche y me sellaron las credenciales y encontré el Camino. Inmediatamente vi a unos peregrinos, y perdí tiempo. Hice fotos de la iglesia (que estaba cerrada un domingo por la mañana) y fuente en la plaza mayor. I finally got going, and it felt like a different Camnio all together. It felt like it would never end. A lot of it was road walking, and the pista was always the same. At least I met a German Shepherd along the way. Por fin empecé a caminar. Era como un camino distino. Tenía la sensación que nunca iba a acabar. Había mucho por la carretera, y la pista siempre era el mismo. Al menos conocí a un pastor alemán. I passed a few villages. They’re putting in a new albergue that may already be open now. I wished “buen camino” to the peregrinos I saw, but they were strangers. 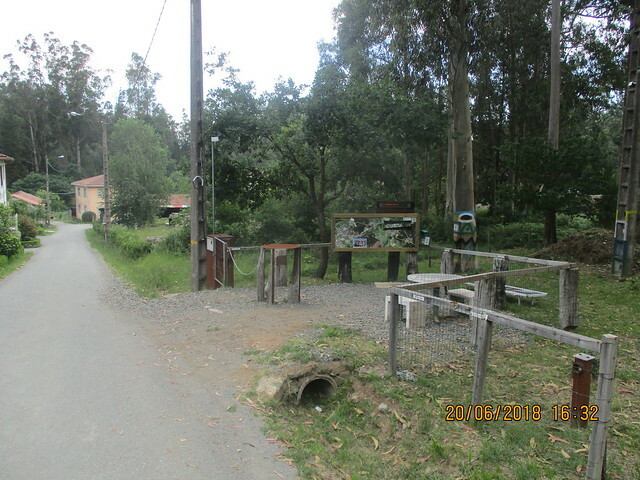 There was a place with vending machines, but no option for food or drink between Castroverde and Lugo (although that new albergue will change that.) Pasé unos pueblos. 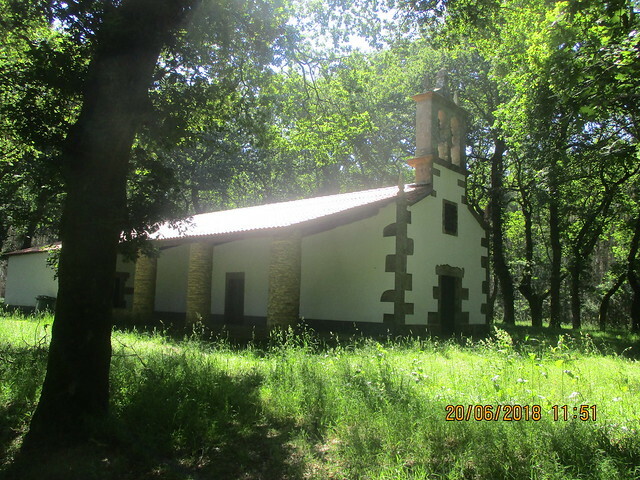 Estaban construyendo un albergue nuevo que, a lo mejor, ya está abierto. Deseé “buen camino” a los peregrinos que vi, pero eran desconocidos. Había un sitio de máquinas de bebidas, pero no había otra opción de comida o bebidas entre Castroverde y Luego. El albergue nuevo cambiará eso. I took the option that went by a church, and it was worth it. It got me off the road a bit, and the church was nice. I saw a lot of farms. 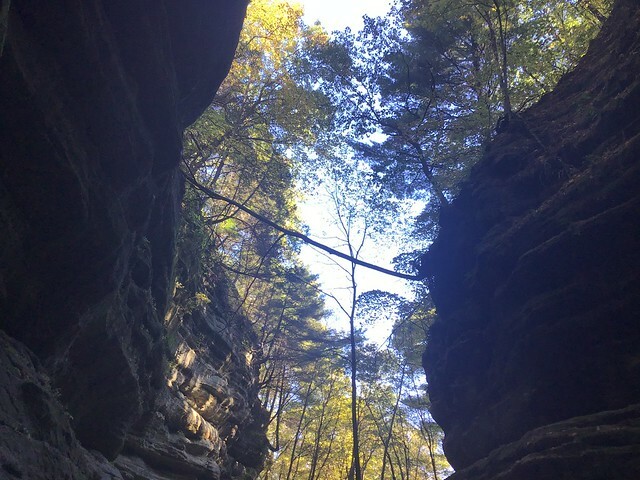 It reminded me a lot of Northern Ohio. Hice el desavío que pasó una iglesia, y merecía la pena. Me alojé de la carretera un rato, y la iglesia era bonita. Vi muchas granjas. Me acordaba bastante del norte de Ohio. 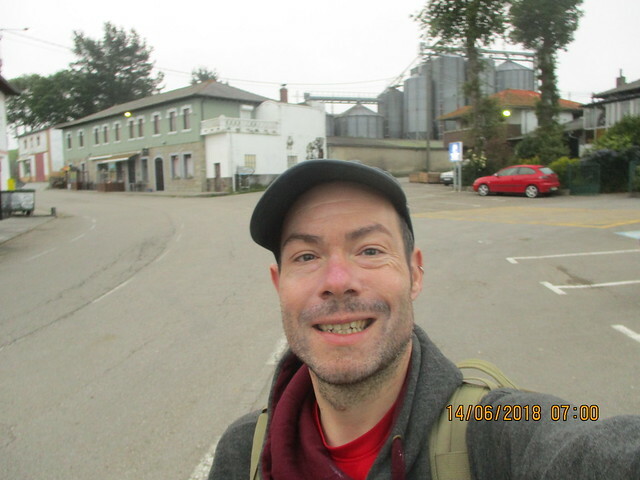 I stayed at a pilgrim-friendly bed and breakfast, B&B Muralla Romana, just outside the Roman walls near the Cathedral and near the next day’s Camino starting point. It was extremely welcoming and I recommend it. 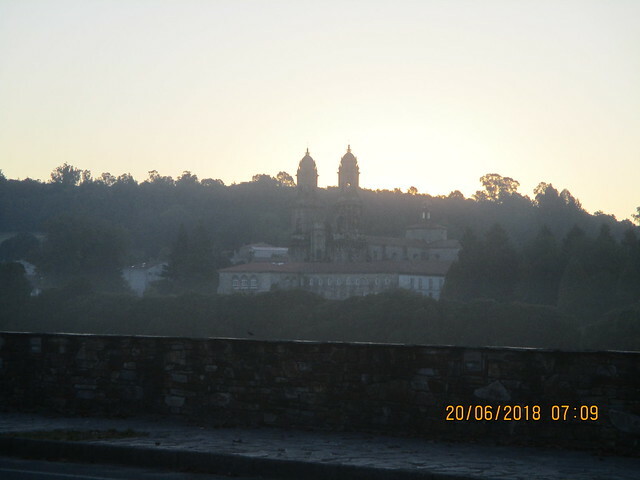 Dormí en el B&B Muralla Romana, a lado de las murallas romanas cerca de la catedral y donde empieza el Camino el próximo día. Era muy acogedor y os lo recomiendo. Lugo was having a medieval fiesta all weekend long, so the prices were exhorbitant and it was difficult to find a decent place to eat that had normal prices. 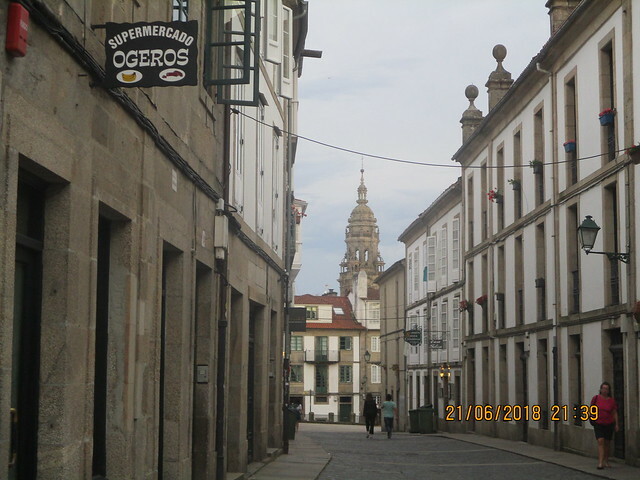 I had been looking forward to a return to Lugo after my visit to the city last summer, and I was really looking forward to those great tapas. Había una fiesta medieval en Lugo todo el fin de semana, y los precios estaban muy altos. Era difícil encontrar un buen sitio para comer que tenía precios normales. Estaba anticipando estar en Lugo otra vez después de mi visita a la ciudad el verano pasado. Estaba anticipando esas tapas famosas. Alas, with the fiestas, the tapas were barely existant. Everything was super expensive. Lamentablemente, con las fiestas, apenas había tapas. Todo era muy caro. 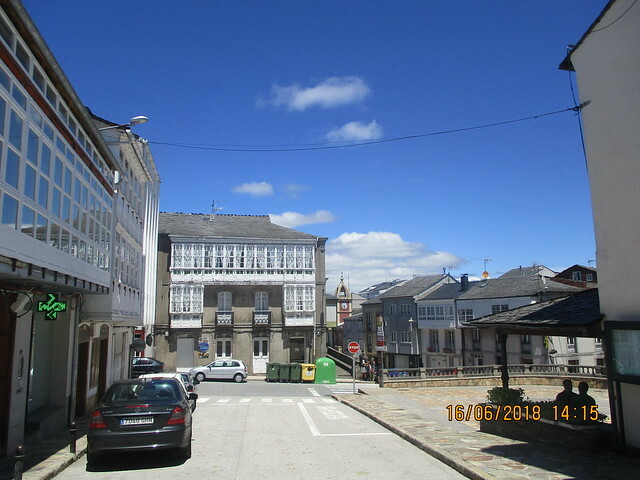 Lugo is the fourth-largest city in Galicia with a population of 98,560. 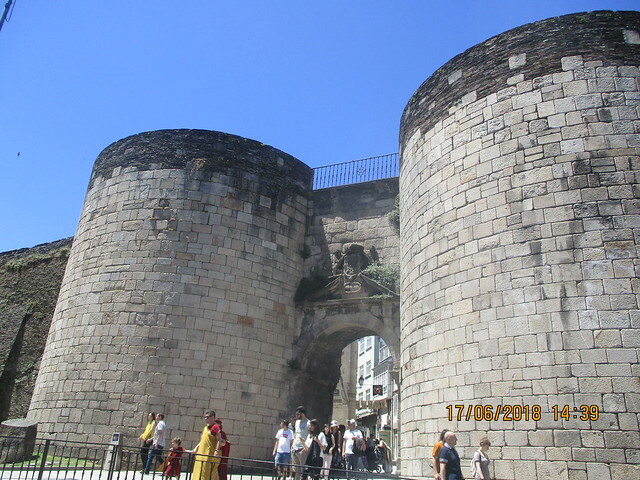 It is the only city in the world to be completely surrounded by intact Roman walls. 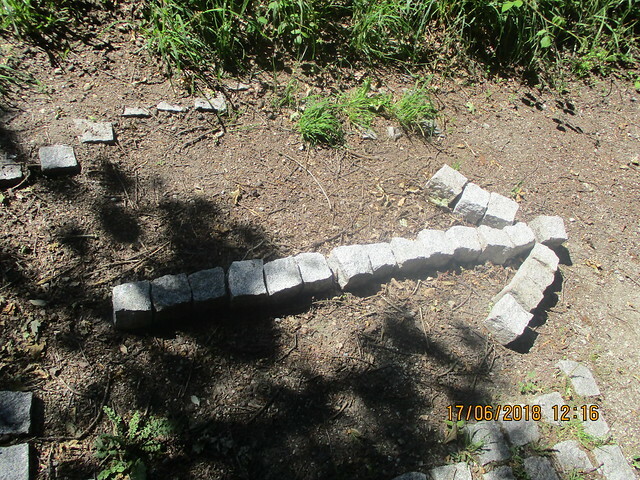 (I had walked on top of them the summer prior, so I rested this time). 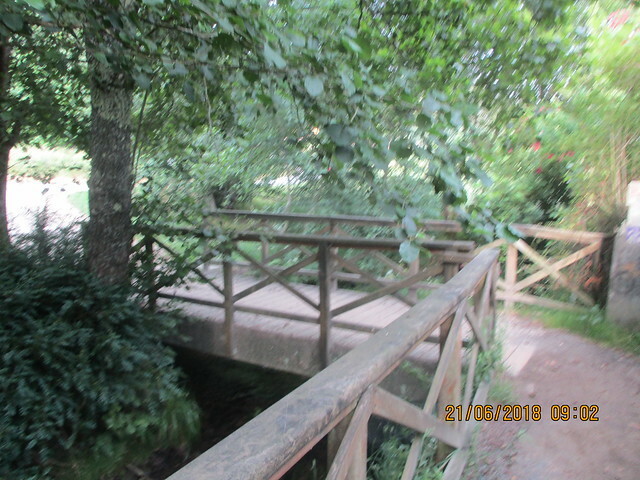 It also features a Roman bridge that crosses the River Minho, which the Camino uses. 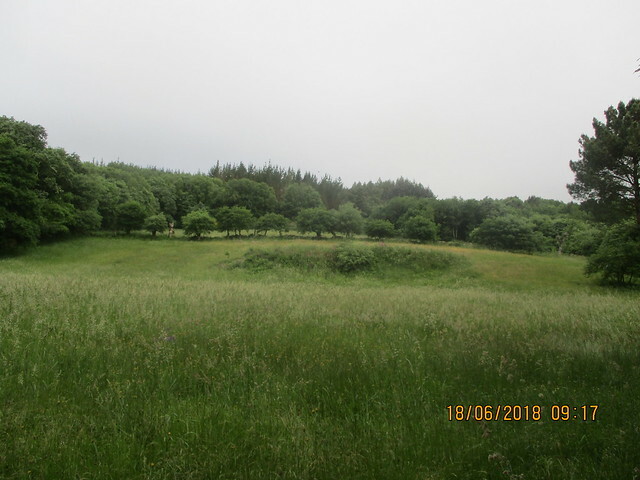 Lugo es la cuatra ciudad en Galicia con una población de 98.560. Es la única ciudad en el mundo para tener una muralla romana intacta alrededor la ciudad. Ya había caminado por encima las murallas el verano pasado y esta vez descansé. 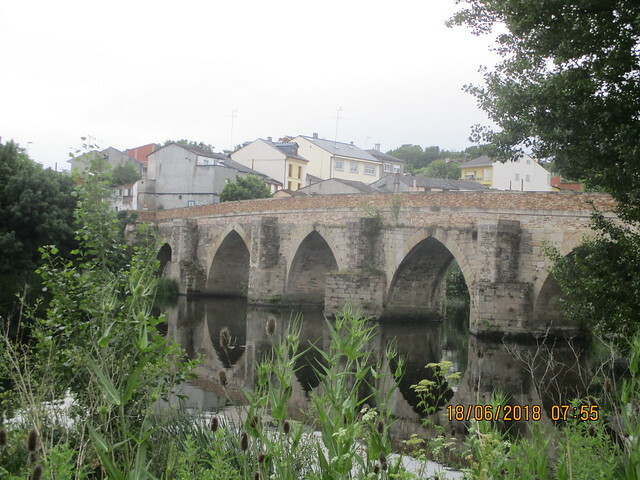 También hay un puente romano que cruce el Río Minho. El Camino pasa por el puente. I arrived to the Cathedral just after the peregrino specialist finished her shift, so I had to find a priest to get their special stamp. It was a surreal experience as he was reading the Bible and I didn’t want to bother him. He was hard of hearing, but I had no problem getting the stamp when he noticed me. Llegué a la Catedral justo después de la especialista de peregrinos había terminado el día. 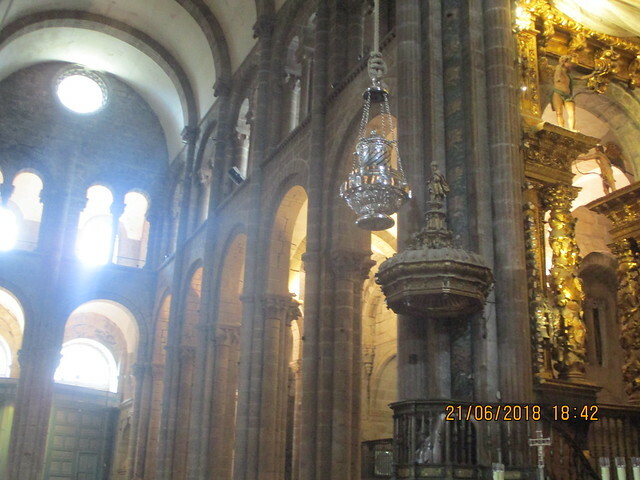 Tenía que buscar un curo para conseguir el sello especial de la Catedral. Era una experiencia surrealista porque estaba estudiando la Biblia y no quería molestarle. Era algo sordo, pero cuando me vio, no tenía ningún problema en obtener el sello. I will be honest, I did have a lot of anxiety and even suffered a panic attack due to all the people in the city that I wasn’t expecting. Voy a ser sincero. Tenia mucha ansiedad hasta el punto que sufrí un ataque de pánico dado a toda la gente en la ciudad que no estaba esperando. 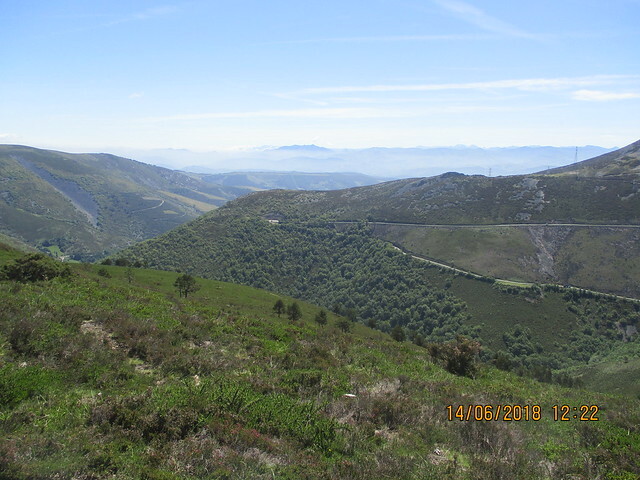 However, due to my Camino plans, I would have the chance to be completely alone in nature the next two days, avoiding the masses of the Camino Francés as long as possible. Sin embargo, dado a mis planes del Camino, iba a tener la oportunidad para estar solo en la naturaleza durante los dos próximos días y evitar los multitudes del Camino Francés tanto como posible. It was another one of those days that started out bad but ended up great. Era otro día que empezó mal pero se acabó genial. So great that I ended up changing my mind. 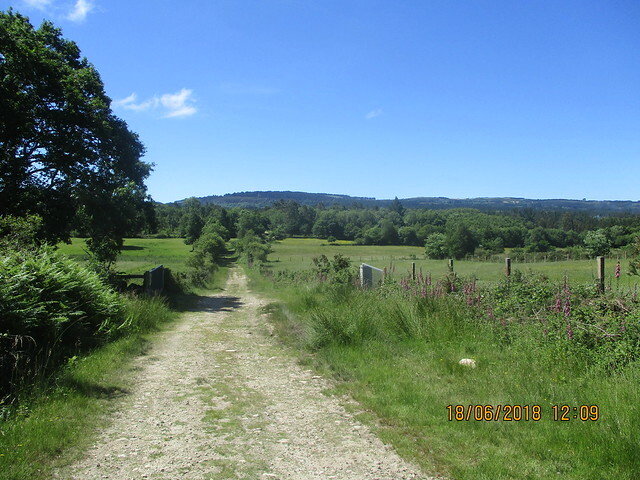 I was going to catch a bus to Lugo and head to Ourense to finish via the Camino Sanabrés, as Ourense was the only Spanish province I hadn’t set foot in. I ended up waiting until visiting it after my arrival in Santiago. Tan genial que me cambié de mente otra vez. Iba a coger un autobús a Lugo e ir a Oursense para terminar por el Camino Sanabrés, como Ourense era la única província española que no había pisado. Al final, esperé visitarla hasta después de la llegada a Santiago. I didn’t want to leave the Primitivo just yet. No quería dejar el Primitivo todavía. However, that morning was rough. I woke up to grey skies and drizzle despite the forecast sun. The peregrinos that had made noise all night were making noise at 6 a.m. I got ready and was out the door by 6:50. Bar Avenida was open, and so I had breakfast. Sin embargo, lo pasé mal por la mañana. Me desperté a un cielo gris y sirimiri a pesar de la predicción de sol. Los peregrinos que hacían ruido toda la noche estaban haciendo ruido a las 6 de la madrugada. Me preparé por el día y salí a las 6.50. El Bar Avenida estaba abierto y desayuné. 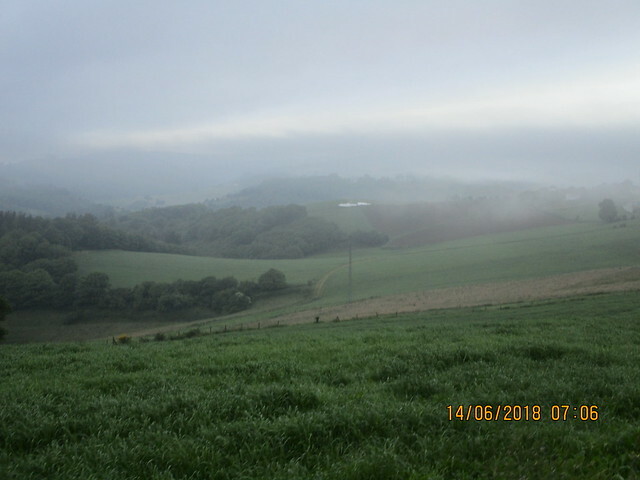 The grey skies stuck around, although the Camino was pleasant enough scenery. The bar/tienda wasn’t open yet by the time I passed the first village. When I arrived to Castro, the Valencianos and Palencian were still at the albergue when I passed around 8:15. It looked like a nice one. 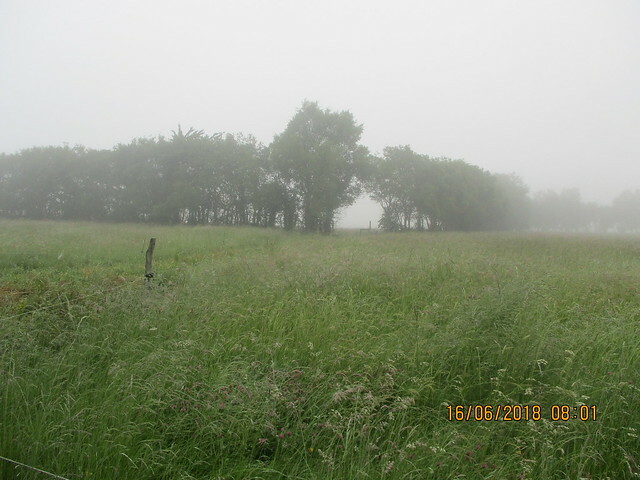 El cielo gris seguía, aunque el paisaje del Camino era bonito. El bar-tienda no se había abierto cuando pasé el primer pueblo. Cuando llegué a Castro sobre las 8.15, los valencianos y palentino todavía no se habían ido. El albergue parecía bien. After Castro came more forest. 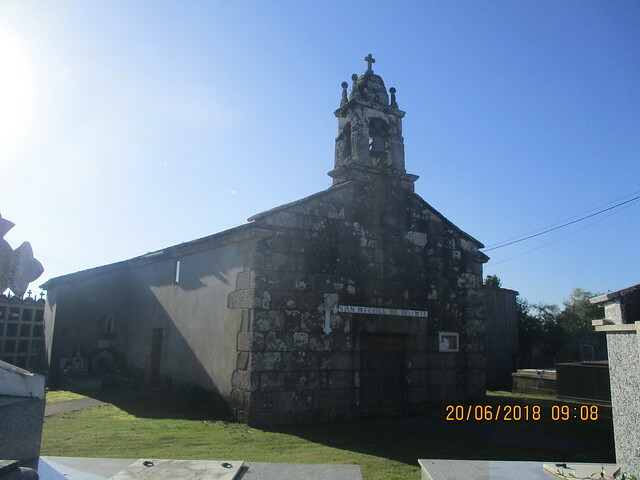 I visited an interesting ermita. 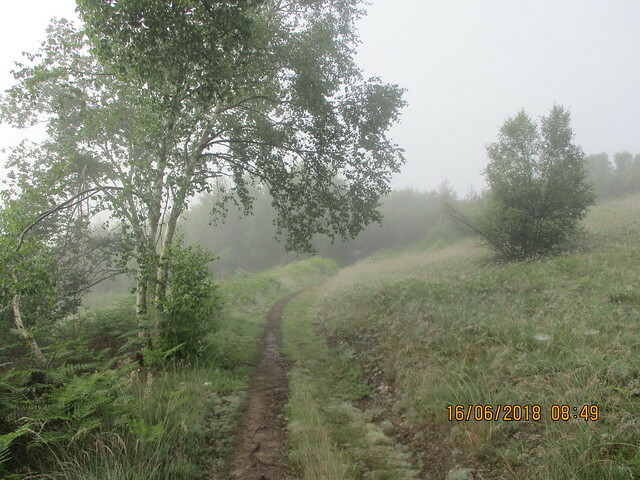 Then the forest walking ended for road walking as the fog began to lift. Después de Castro, había más bosque. 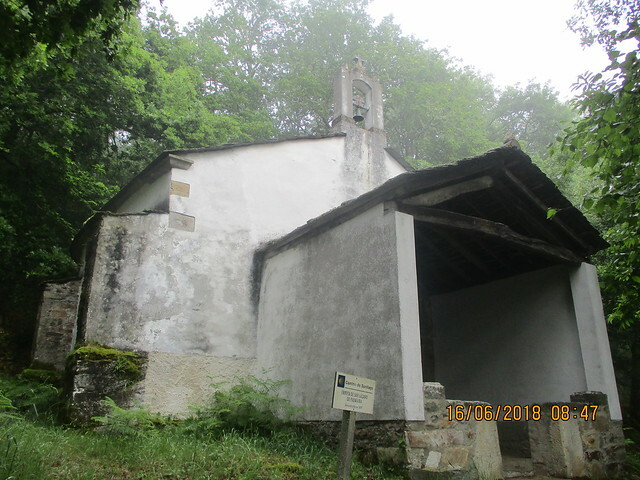 Visité una ermita interesante. 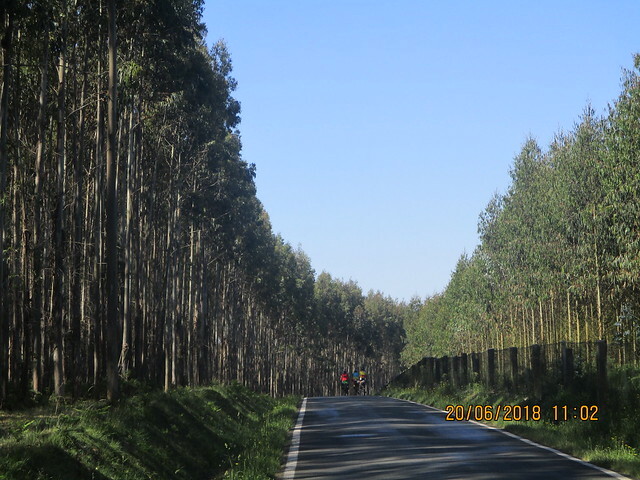 Y después, se acabó la senda de bosque para caminar por la carretera. 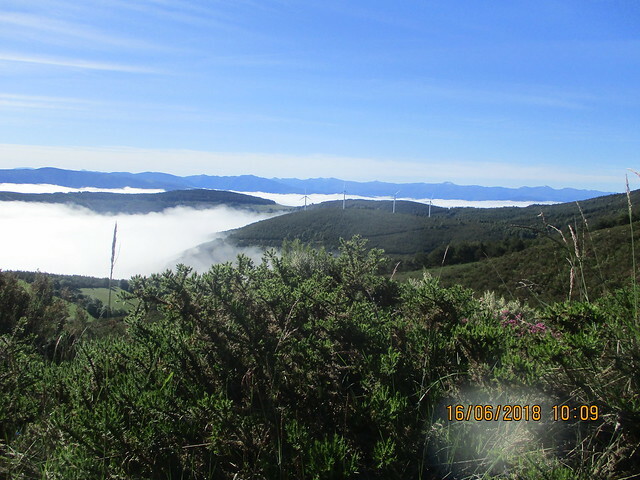 Al menos la niebla estaba desapareciendo. Then…Puerta de Acebo. It was beautiful and reminded me of Alaska. I saw a lot of wind turbines. I was about to arrive to Galicia. I savoured the moment. Luego…Puerta de Acebo. Era precioso y me acordaba de Alaska. Vi muchos turbinos de viento. Estaba a punto de llegar a Galicia. Disfruté del momento. I know most people will argue with me, but I found the views even more beautiful than two days before doing the Hospitales. I think it was because I wasn’t expecting it. 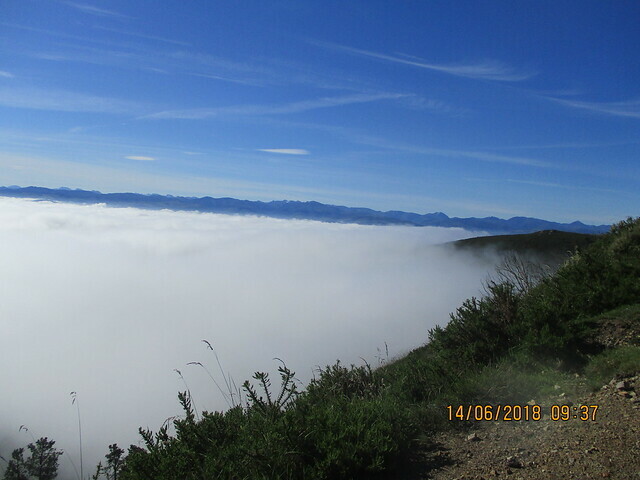 Once again, I was walking above the cloud line which provided for some breathtaking views. Sé que la mayoría de gente no están de acuerdo conmigo, pero para mi, las vistas eran aún más preciosas que las de dos días antes durante la Ruta de Hospitales. Creo que es porque no lo esperaba. 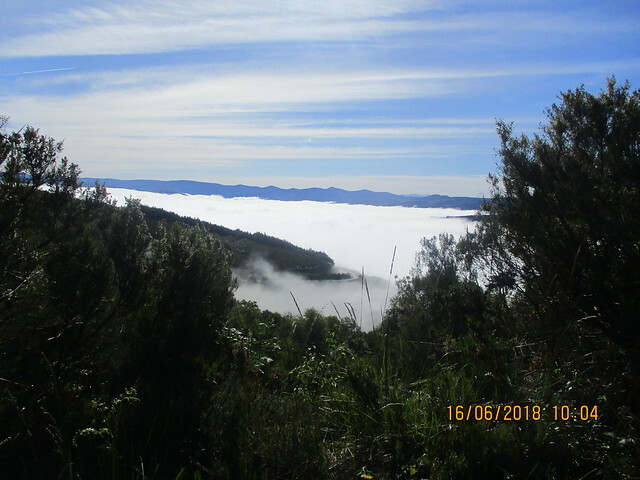 Una vez más, estaba caminando encima de los nubes que daba vistas impresionantes. 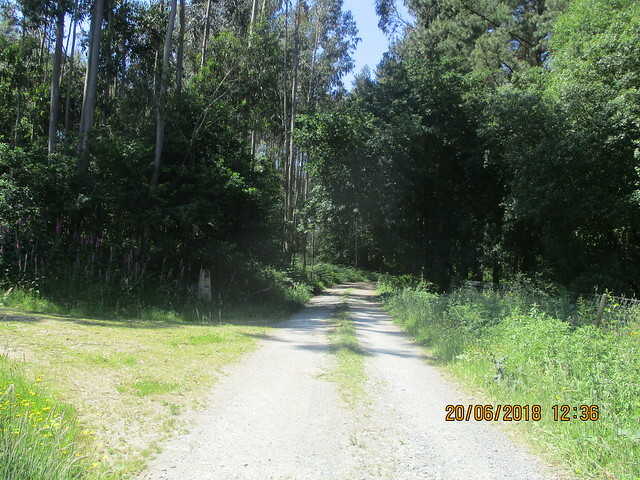 I crossed the line into Galicia. Santiago was that much closer. 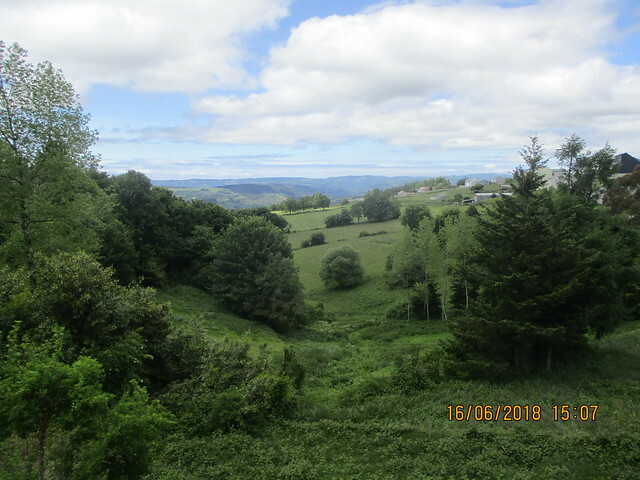 Crucé la frontera entre Asturias y Galicia. Santiago ya estaba más cerca. Just after crossing into Galicia, I came across a bar with questionable hours, according to Gronze and Eroski. I was in luck. It was open, and I treated myself to a piece of tarta de Santiago. Most of the peregrinos I had encountered were there, arriving or leaving. Justo después de cruzar la frontera, encontré un bar con un horario desconocido, según Gronze y Eroski. Tenía suerte porque estaba abierto. 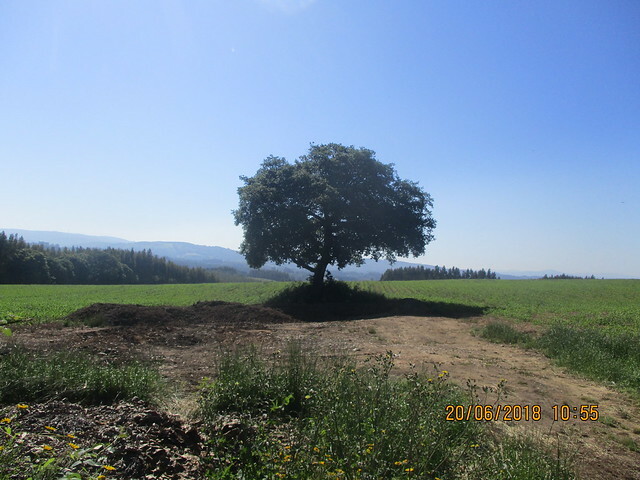 Comí un trozo de tarta de Santiago. Vi a la mayoría de peregrinos que conocía allí, o llegando o yéndose. 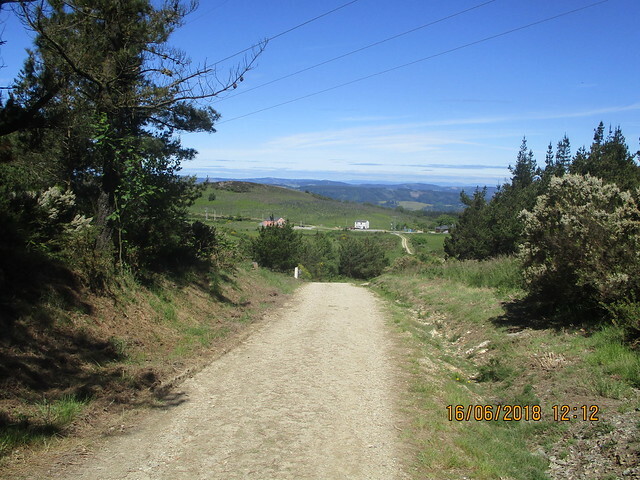 Galicia is turning the Camino into “pista” tracks so vehicles can drive on them in case of emergency. The Primitivo has already suffered from this. It made for a bit easier walking, and the views weren’t hampered any. I still think people should leave nature alone. Galicia quiere convertir todo el Camino a ser de pista para que los vehículos pueden ir por allí en caso de emergencia. El Primitivo ya ha sufrido de eso. Ok, se puede caminar un poco más fácilmente, y no arruinen las vistas. Pero creo que la gente deberían dejar la naturaleza ser sin tocarla. 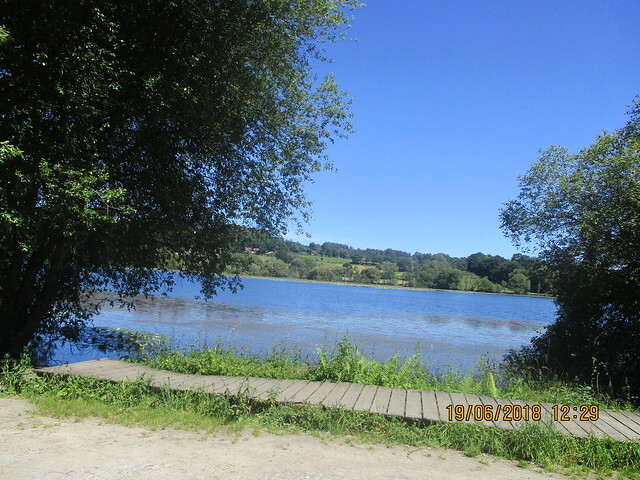 About six or seven kilometres into Galicia, I stopped at the open Mesón and was glad I did. They gave me a huge tapa of carne guisado with my café con leche. Después de unos siete kilómetros, paré en la Mesón que estaba abierta y me alegré haber hecho. Me dieron una tapa gigante de carne guisado con el café con leche. 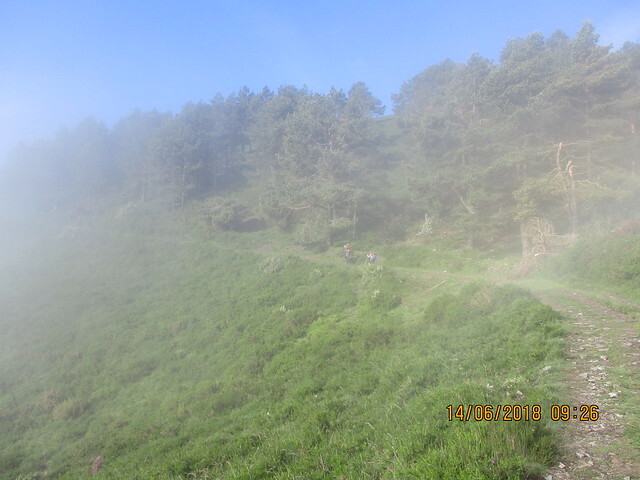 Then there was that final ascent into A Fonsagrada. I ran into the Australians, and I wanted to walk alone…and trying to go faster, I fell. Mistake. I need to learn how to take it easy. They were helpful, and I helped them check into the albergue where they didn’t speak English and the Aussies didn’t speak much Spanish. Después vino esa subida final a A Fonsagrada. Vi a los australianos, y quería caminar solo…e intenté caminar más rápiado. Me caí. Fue un error. He de aprender estar más tranquilo. Me ayudaron, y les devolví el favor y les ayudé registrarse en el albergue, donde no hablaban mucho inglés y los australianos no sabían mucho español. The Albergue-Pensión Cantábrico is another nice, clean and comfortable albergue. I heard good reviews about the municipal albergue too. The toilets were a bit “far” from the bedrooms, but that’s my only complaint. They had a drier for the boots. El Albergue-Pensión Cantábrico es otro albergue bonito, limpio y cómodo. Me hablaron bien del albergue muncipal también. La única queja es que los baños era algo alejado de los dormitorios. 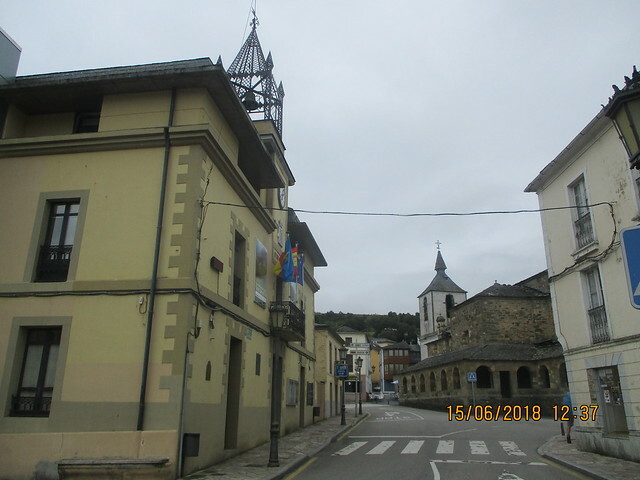 A Fonsagrada is a charming village of 5007. After showering, I went to find a restaurant. I found a great one with beautiful views, and I remember making a mental note to write it down to recommend it. Guess what? I didn’t write it down. I feel horrible because the menú was only 9€ on a Saturday and the terraza featured some spectacular views. A Fonsagrada es un pueblo encantador de 5007 personas. Después de ducharme, fui a buscar un restaurante, y encontré uno bueno, bonito y barato. Recuerdo que hice un apunte mental para escribir el nombre para poder recomendarlo después. ¿Sabes qué? No lo apunté. Me sabe mal porque el menú solo costaba 9€ en un sábado y había vistas espectaculares desde la terraza. The Andorrans also stayed at Pensión Cantábrico, and I chatted with them awhile. 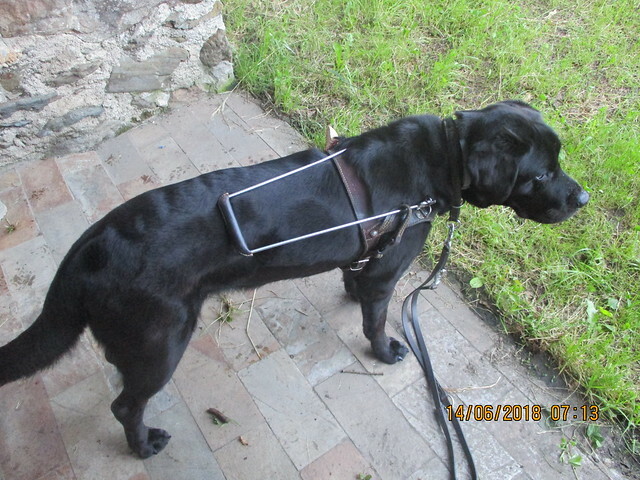 He was still having problems with the legs, and Liza the seeing-eye dog was ready to arrive to Santiago. Los andorranos también se alojaron en la Pensión Cantábrico, y hablé con ellos un rato. Todavía le dolía la pierna, y Liza la perra de guía estaba lista llegar a Santiago. I ended up going to my first misa de peregrino (Pilgrim’s mass) and received a blessing. It was moving. 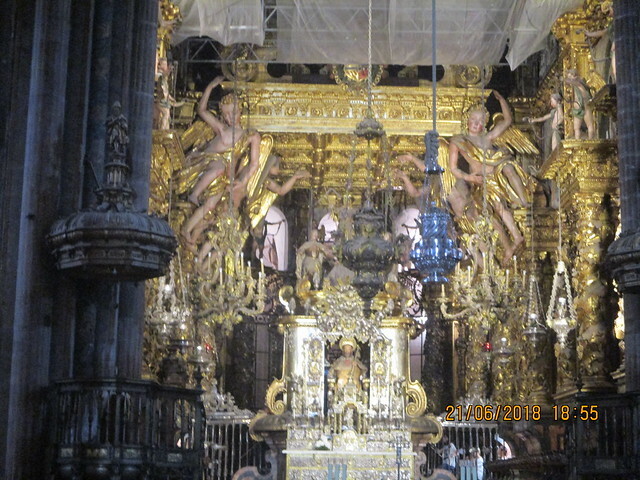 Al final, fui a mi primer misa de peregrino y recibí una bendición. Me tocaba el alma. I slept okay that night, having made up my mind about how I was going to arrive to Santiago. No dormí mal durante la noche, como ya había hecho una decisión de como iba a llegar a Santiago. It’s hard to follow up a day like Hospitales, but my sixth day on the Primitivo certainly tried. 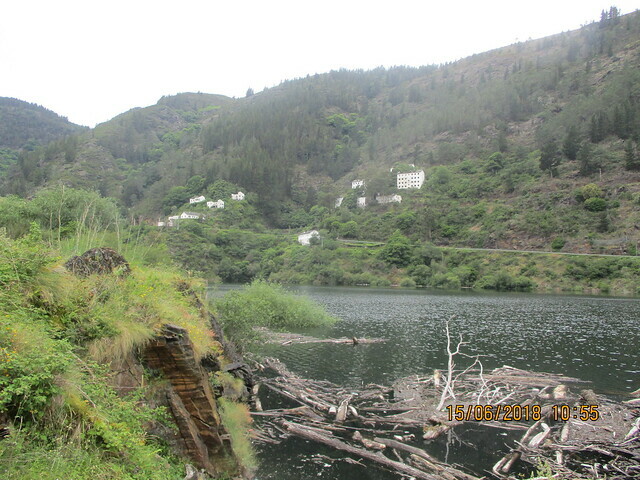 However, the beautiful lake views came after a detour and lots of clouds. Es complicado competer con una etapa como Hospitales, pero el sexto día del Primitivo intentó. 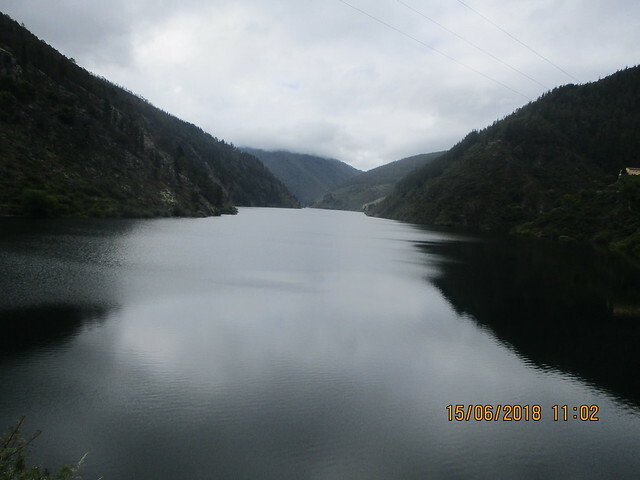 Sin embargo, las vistas preciosas del embalse eran después de un desavío y muchos nubes. I began the day with a tostada and café con leche at 3€ at Casa Marqués. Breakfast always seems to be more expensive in Asturias for some reason. That same breakfast I can find for 1,80€ in València. I chatted with the Andorrans a bit before we all left. 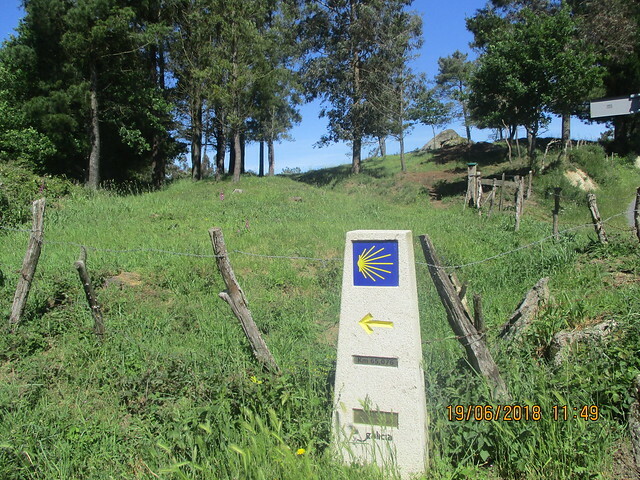 They went by the road and I went on the official Camino. I was on my way by 7:15. Empecé el día con una tostada y café con leche que costaba 3€ en Casa Marqués. 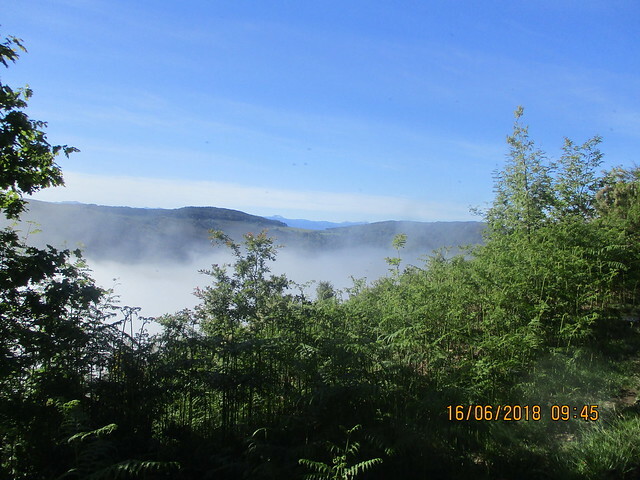 Me parece que el desayuno siempre es más caro en Asturias y no sé porque. Puedo desayunar el mismo en València por solo 1,80€. Charlé con los andorranos un rato antes de salir. Ellos iban por la carretera y yo iba por el Camino oficial. Estaba en marcha antes de las 7.15. 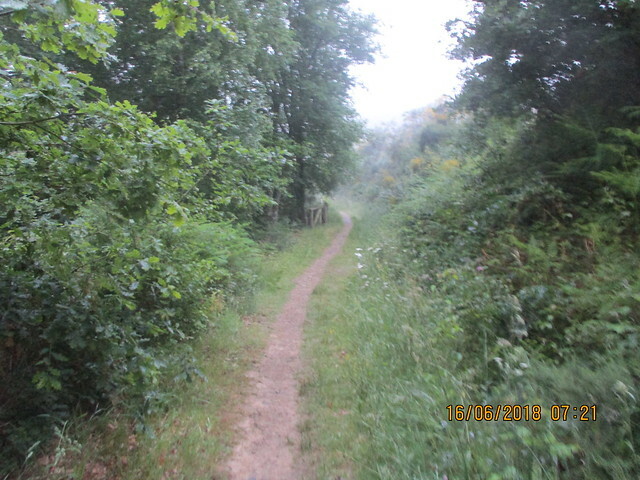 I tried to leave around 7 so I could have the Camino to myself as much as possible. Some people need to connect with others. 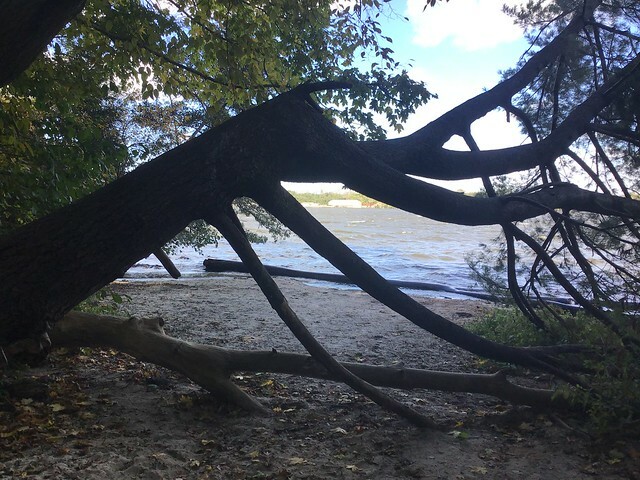 I needed a connection with nature, God and the universe, which I found along the way. Siempre intenté salir sobre las 7 para poder caminar solo tanto como posible. Algunos necesitan conectar con otros peregrinos. Yo necesitaba conectar con la naturaleza, Dios y el universo, y lo encontré por el Camino. 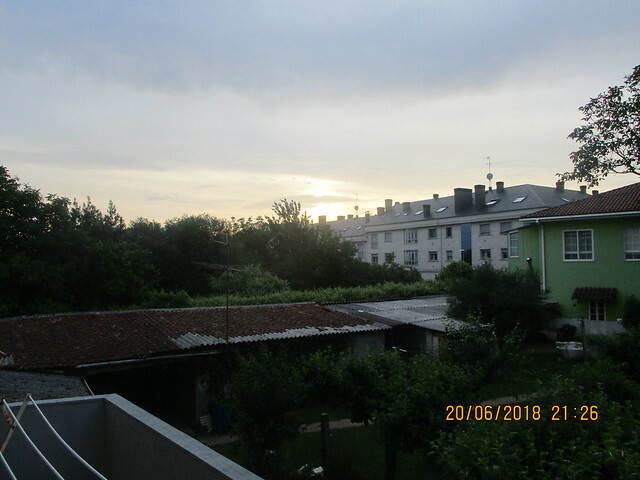 I saw a bit of the sunrise through the clouds. 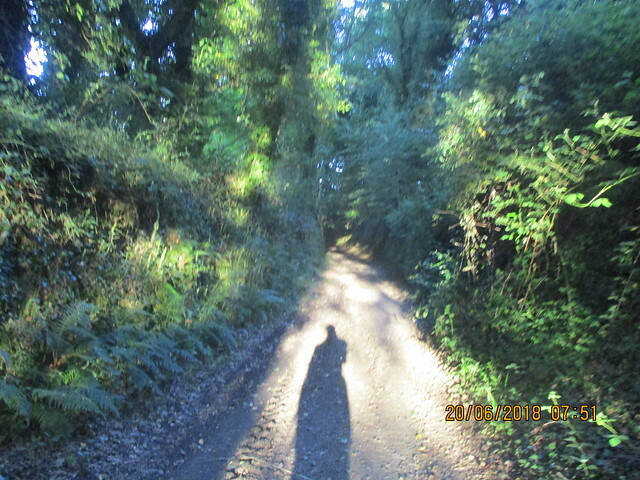 The Camino begins to ascend, as always. Vi un poco del amanecer por los nubes. El Camino empezó a subir, como siempre. I stopped at the albergue in La Mesa for another coffee and ran into the Valencians and Palencian. They had stayed there. It looked to be a nice albergue. Paré en el albergue en La Mesa para tomar otro café y vi a los valencianos y el palenciano. Habían dormido allí, y parecía un buen albergue. I had talked to the Australians about how I needed to always reserve or know I would have a bed. I am jealous of those who can just walk without knowing where they will end. I tried my best not to reserve, but I ended up calling around 9:30 to make a reservation for that night. I needn’t have worried, but it’s easier to walk knowing I won’t have to worry. Había dicho a los australianos de como necesitaba reservar o saber que iba a tener una cama. Me da envidia los que pueden caminar sin saber donde van a acabar. Intenté no reservar, pero al final llamé sobre las 9:30 para hacer una reserva. No tenía que preocuparme, pero camino mejor cuando sé que tengo una cama. In April 2017, this area suffered from some wildfires, and they’re still working on clearing and replanting in 2018. 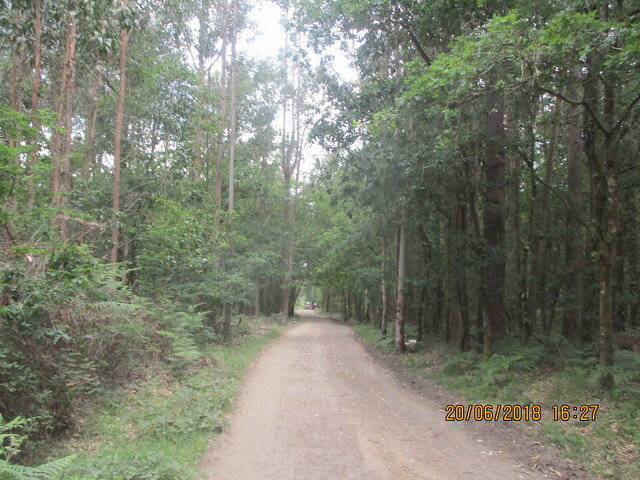 For the time being, there is a detour of around 7 kilometres through a forest trail. It seemed to be without end. En abril de 2017, la zona sufrió unos incendios forestales. Todavía están limpiando y replantando en 2018. 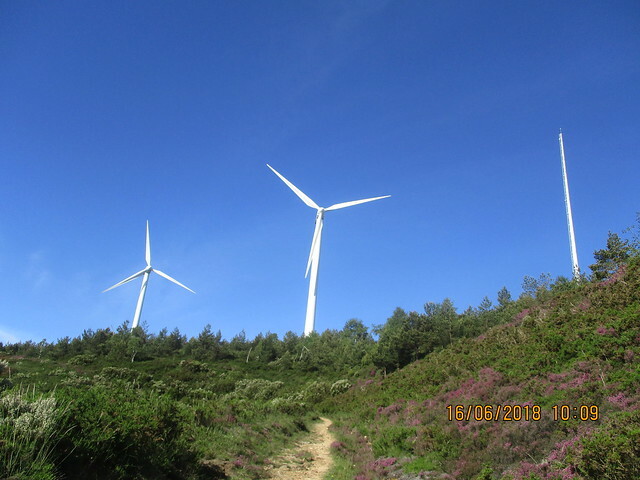 Por ahora, hay un desavío de unos 7 kilómetros por una senda forestal. Parecía que nunca iba a terminar. I was happy to see the lake after an hour and a half of the same forest trail. It’s actually a reservoir, but it is as beautiful as a natural lake. 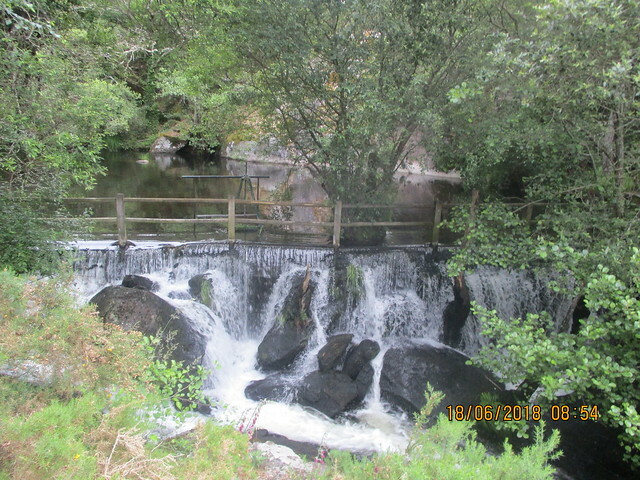 Work began on the reservoir in 1946 and the dam was finished in 1953. The U.K. secretly supplied materials during the U.N. embargo to Francoist Spain, and between 100 and 300 workers died due to the poor working conditions. Estaba contento ver el lago después de una hora y media del mismo paisaje de la pista. 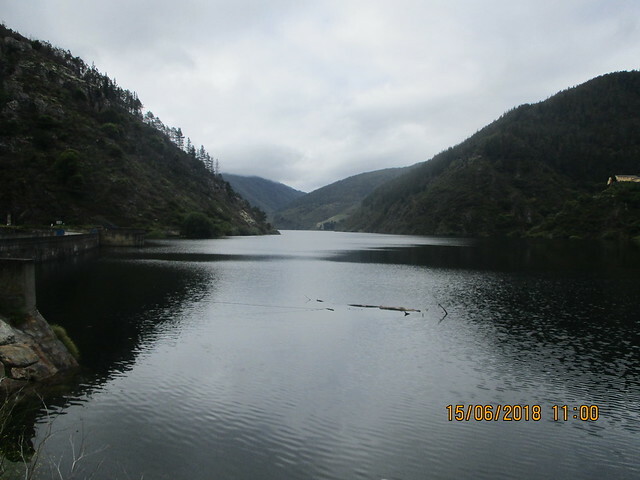 De hecho es un embalse, no lago, pero es tan precioso como un lago natural. Empezaron a trabajar en el embalse en 1946. Terminaron la presa en 1953. El Reino Unido daba materiales a España en secreto porque había un embargo al régimen Franco. Entre 100 y 300 trabajadores se murieron durante las obras dado a las malas condiciones. Beauty comes at a price sometimes. A veces hay un precio para belleza. I stopped at the Hotel de Grames. I then remembered what the Galician peregrina had told me on the San Salvador when I saw it for myself. Peregrinos are not too welcome here. She said they had actually refused to serve her as she was a peregrina. I received service, but horrible service. It is also expensive. Don’t stop here. Paré en el Hotel de Grames. Después, me acordé de que me había dicho la peregrina gallega en el San Salvador. Los peregrinos no están bienvenidos aquí. Me dijo que no le sirvió porque era una peregrina. Me sirvió, pero era muy mal servicio. También es caro. Os consejo que no paréis aquí. 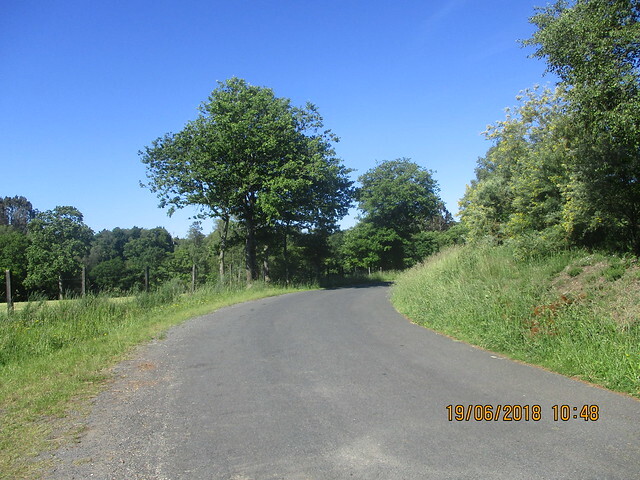 Then came five kilometres of road walking before the last two through a mountain path. The views were beautiful. 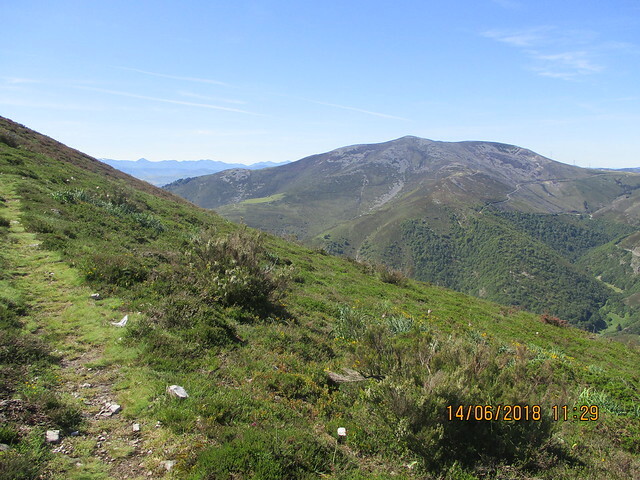 Luego había cinco kilómetros de caminar por la carretera antes de los últimos dos kilómetros por un sendero de monte. Las vistas eran preciosas. 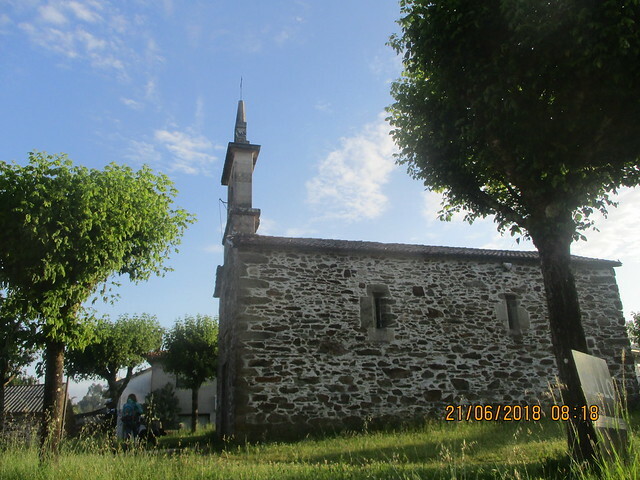 Grandas de Salime is a village of 1101 people. 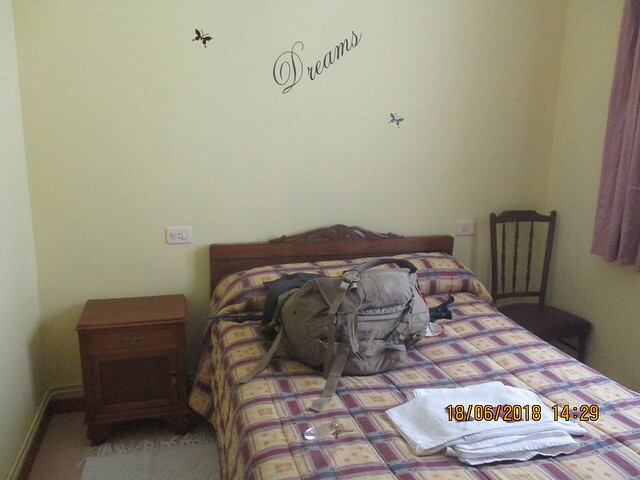 I stayed at Casa Sánchez, which is clean and comfortable but one of the more expensive albergues. 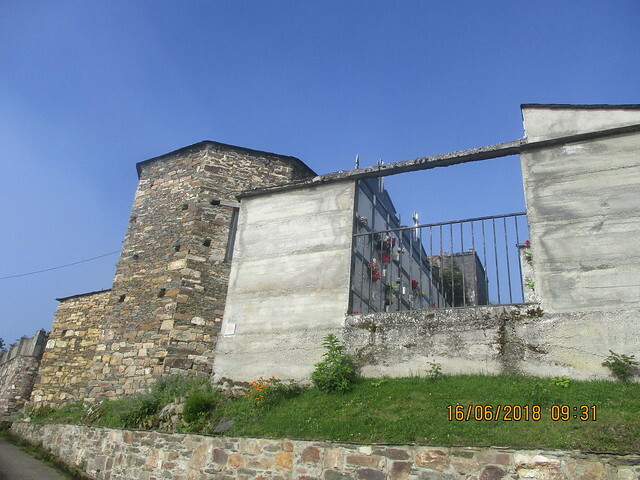 Grandas de Salime es un pueblo de 1101 personas. Me alojé en Casa Sánchez, que estaba limpio y cómodo pero es uno de los albergues más caros. 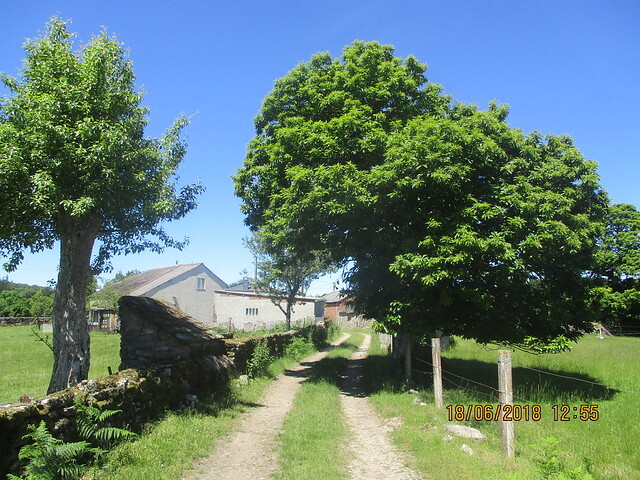 In the afternoon, I went to the Museo Etnográfico de Grandas de Salime. I highly recommend this museum, especially since it only costs 1.50€. I was fascinated by the old schoolhouse. 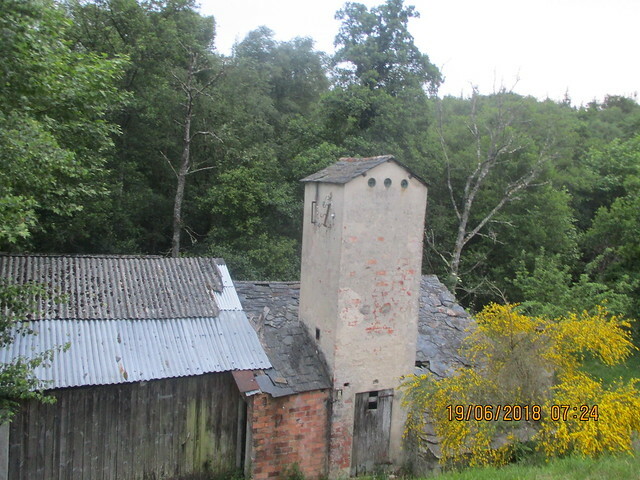 They also have a mill and old house. It’s an amazing opportunity to visit the history of Asturias. Por la tarde, fui al Museo Etnográfico de Grandas de Salime. Os recomiendo el museo, especialmente por el precio de 1,50€. Me fascinó la escuela antigua. También hay un molino antiguo y casa antigua. Es una gran oportunidad para visitar y ver la historia de Asturias. I watched Spain tie Portugal 3-3 in the World Cup during dinner. I would like to state on the record that I cannot stand Cristiano Ronaldo as he is a stuck-up egotistical whiner, and after València, I am a diehard Barcelona supporter. It was difficult to stomach the sight of him during the match. I ought to write an entry on why I support Barcelona (València comes first though) sometime. Vi el empate entre España y Portugal en el Mundial durante la cena. Quiero aclarar algo. No aguanto a Cristiano Ronaldo. Es un pijo creído, presumido y quejica. 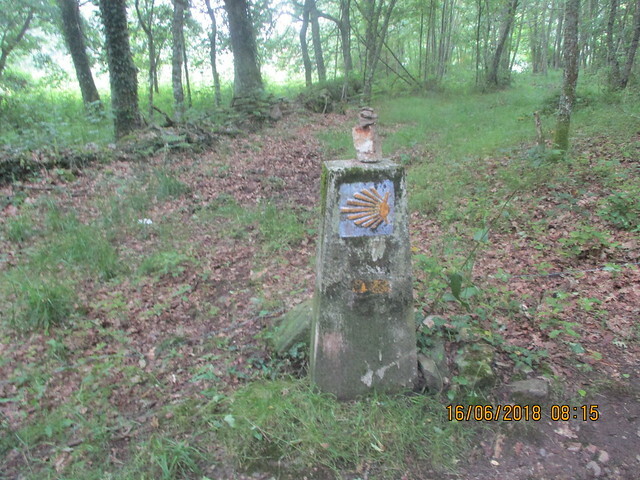 Camino Primitivo (Camino de Santiago) Etapa 5. 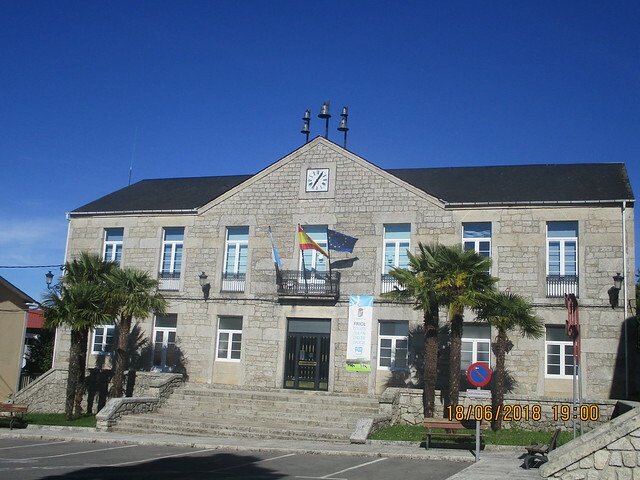 Campiello – Berducedo por Hospitales. 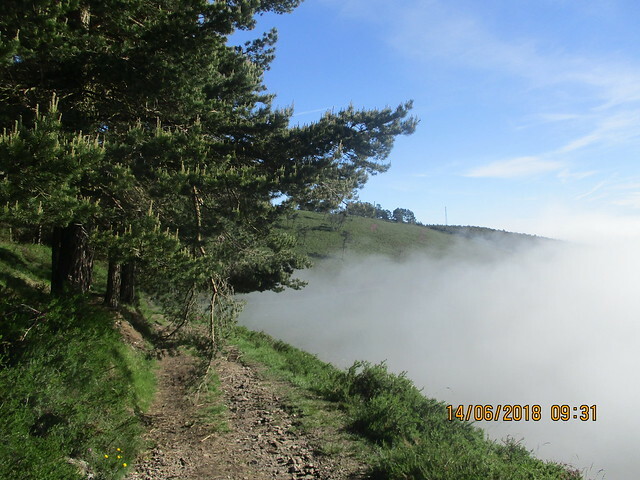 Almost every peregrino who is on the Camino Primitivo keeps their fingers crossed that the Asturian weather cooperates so they hike La Ruta de los Hospitales. 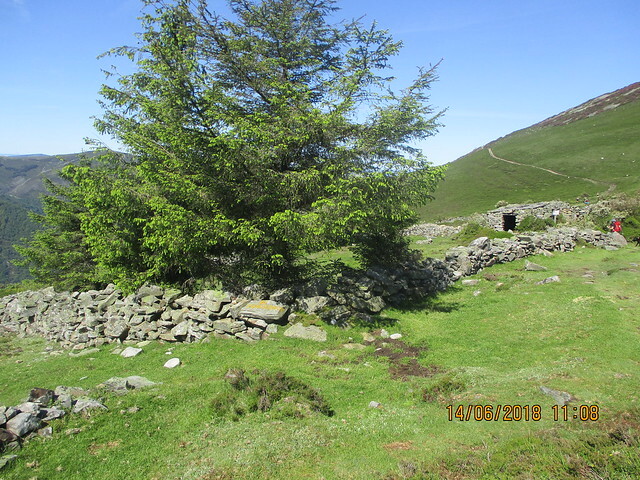 Casí todos los peregrinos que hacen el Camino Primitivo cruzan sus dedos que el tiempo asturiano es agradable para poder hacer La Ruta de los Hospitales. 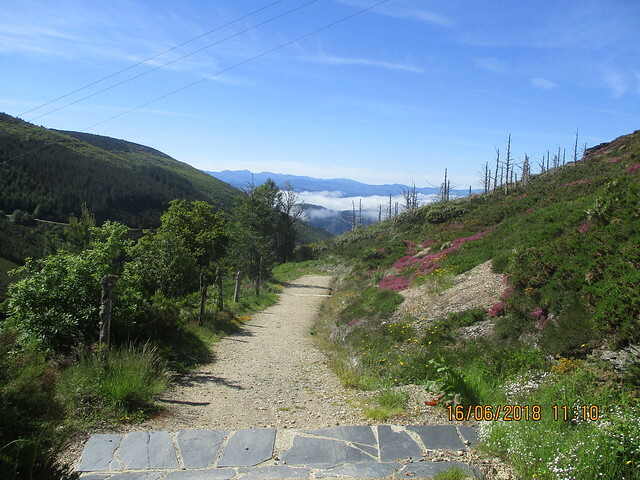 When the Camino began centuries ago, peregrinos walked along this mountain path to arrive to Santiago. If winter arrived, they were stuck in Borres for months, which is why they began to descend to walk along the coast. The hospitales served to give hospitality to the peregrinos. Hace siglos, cuando la gente empezó a hacer el Camino, los peregrinos caminaban por esta ruta del monte para llegar a Santiago. Si vino invierno, estaban atrapados en Borres durante meses, y por eso empezaban a bajar a la costa para seguir caminando. Los hospitales servían a los peregrinos con mucha hospitalidad. I was in luck, however, as the forecast was sunny for the mountains. 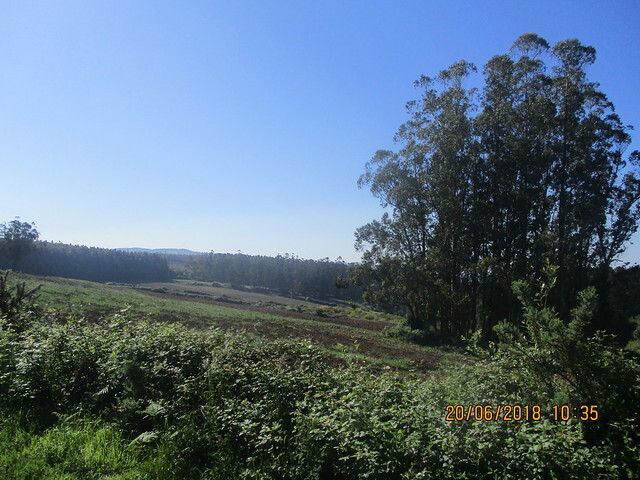 Estaba afortunado este día como daba sol, sol y más sol para los montes. Down below was a different story. I awoke to fog. Several peregrinos were already in the kitchen getting ready. I had bought a capsule for a morning coffee and had something for breakfast, though I don’t remember what. Pero era una historia diferente abajo. Me desperté para ver niebla. Ya había peregrinos en la cocina preparándose para el día. Había comprado una capsula de café para la mañana, y desayuné algo, pero no recuerdo qué desayuné. 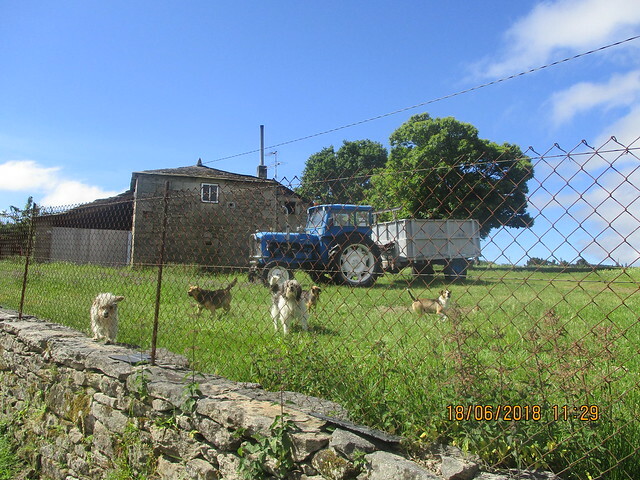 The Andorrans and I set off around 7 and went along the road so their seeing-eye dog, Liza, wouldn’t get muddy paws. 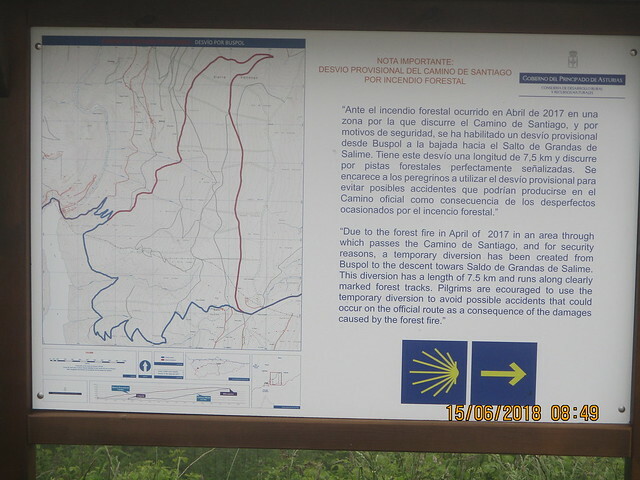 After arriving to Borres, we struggled to find the Camino, as this alternative wasn’t marked like they had told us at the albergue. Los andorranos y yo empezamos el día sobre las 7. Fuimos por la carretera porque la perra de guía, Liza, no pudo caminar con el barro. Después de llegar a Borres, nos costaba encontrar el Camino, porque esta alternativa no era señalizada como nos dijeron en el albergue. We found our way by the green house and stopped at a church. We were already past the fork, so I didn’t get the photo I wanted. We passed a Russian pilgrim who I never saw again after that night. 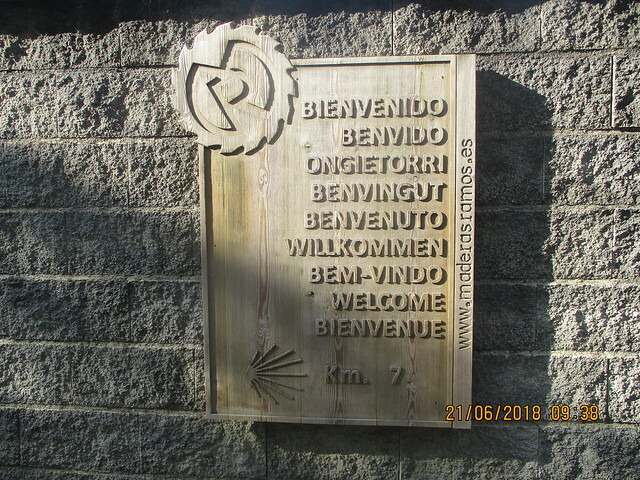 Peregrinos come and go along the Camino! Al final lo encontramos por la casa verde y paramos en una iglesia. Ya habíamos pasado la bifurcación, y no pude hacer la foto que quería. También adelantamos a un peregrino quien nunca vi de nuevo después de aquella noche. As we began to ascend, we saw a ton of cows. 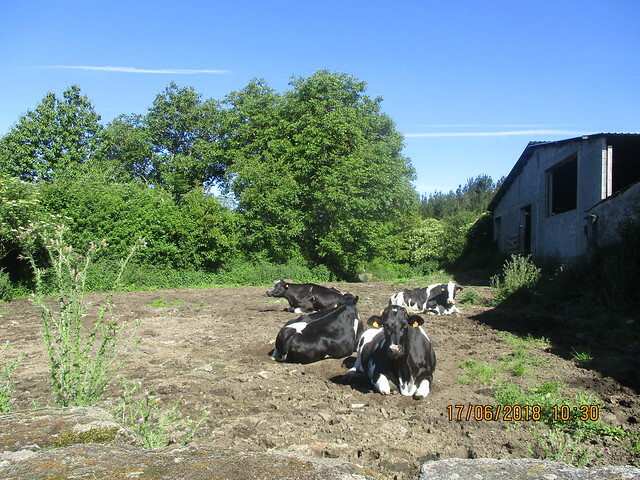 Some of the cows were fascinated by the dog and followed her. I couldn’t help but laugh. 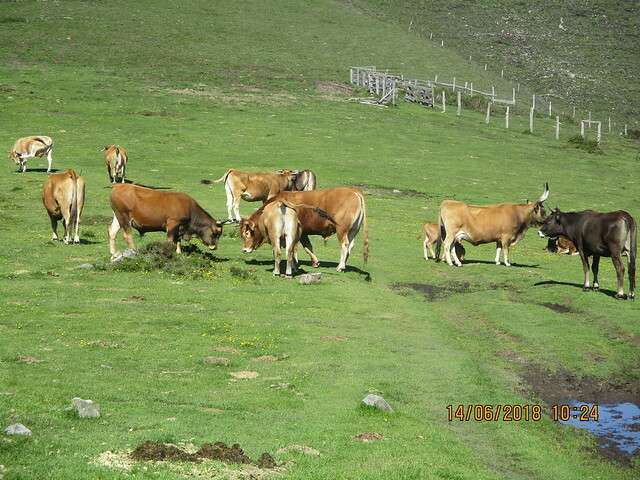 Vimos muchas vacas durante la subida. La perra le fascinó a algunas de las vacas quien intentaron perseguirla. Tenía que reírme. We continued on the ascent. Suddenly we began to rise above the cloud to see a bright, shining sun. 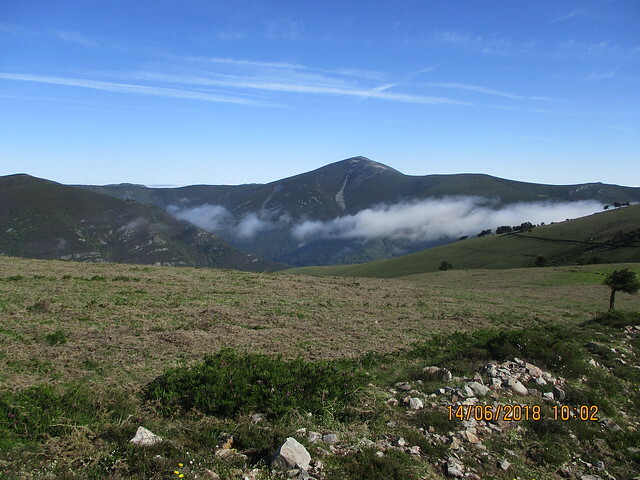 Several of the peregrinos, including the Italians, were at the summit of a mountain, which the Camino didn’t exactly climb…but we went there to have a short break. I put on more sunscreen. Seguimos subiendo. De repente, estábamos encima de los nubes y hacía un sol brillante. 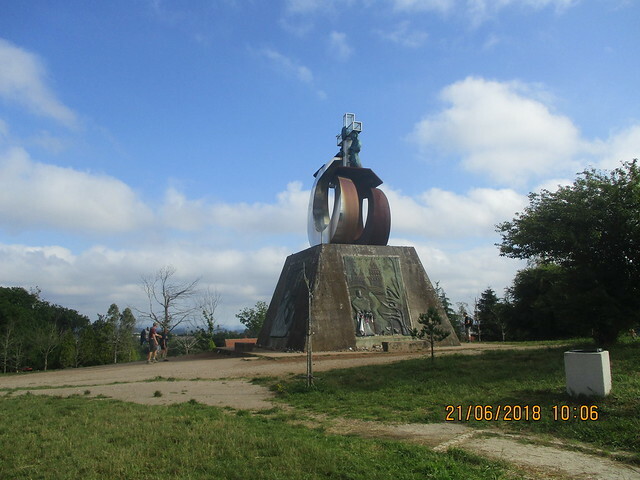 Algunos de los peregrinos, incluso los italianos, estaban en la cima de un monte, y creo que el Camino no lo subía…pero subimos igual para descansar un rato. Apliqué más crema solar. The dog didn’t like the grass. 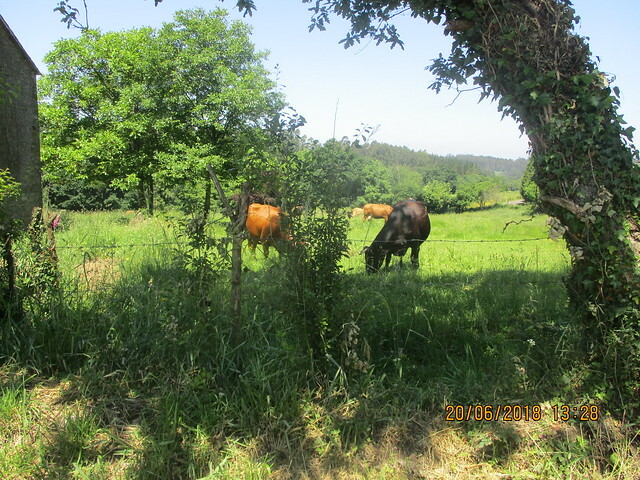 Cows grazed in the middle of the Camino. 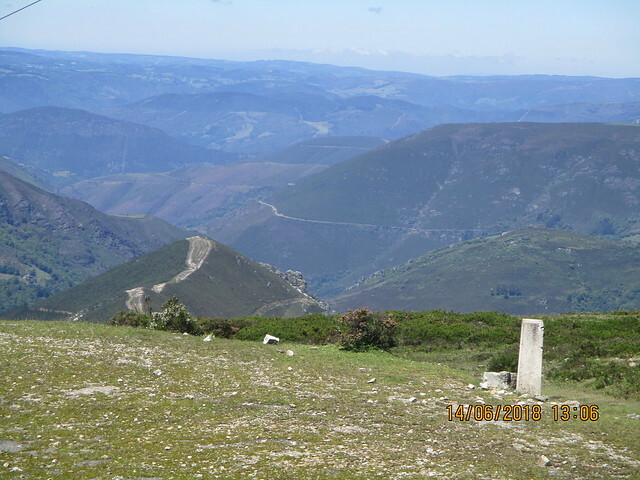 The ascent was steep, but after two years of Samarucs and the Camino Salvador, I did it without problem. I did go slower than the Andorrans and walked at my own pace. 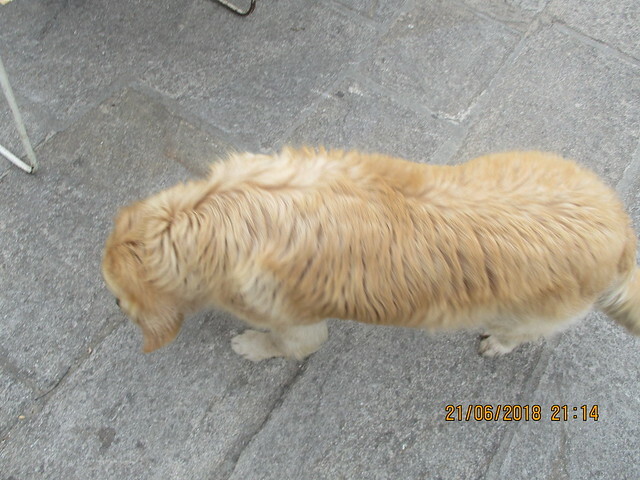 Al perra no le gustaba nada pisar el césped. Las vacas pastaban por el medio del Camino. Había bastante pendiente, pero después de dos años de salidas con Samarucs y el Camino Salvador, lo hice sin problema. Caminaba yo más despacio que los andorranos, caminando en mi propio ritmo. I passed the ruins of three hospitales. The day was going by much faster than I thought it would. Nine kilometres above 1000 metres, if I remember correctly. Vi las ruinas de los tres hospitales. La ruta estaba pasando mucho más rápido que pensaba. Si recuerdo bien,, eran nueve kilómetros sobre 1000 metros. We stopped to eat around 1 p.m., in Puerto de Alto, and I saw the guy from Palencia and the Australians. Paramos para comer sobre las 13 en Puerto de Alto, y vi al palenciano y los australianos. At the first village we came to, Montefurado, the Andorrans had to call a taxi as the husband had injured his leg and was walking badly. I continued on despite being tired. I thought about sending my backpack with them, but I made myself continue with it. En el primer pueblo después de Puerta de Alto, Montefurado, los Andorranos tenían que llamar un taxi porque el marido se había lesionado la pierna y estaba caminando mal. Seguí a pesar de estar cansado. Pensé en enviar la mochila con ellos, pero al final seguí caminando con ello. The views were worth it. I passed a nice ermita. The bar in Lago was closed for good. 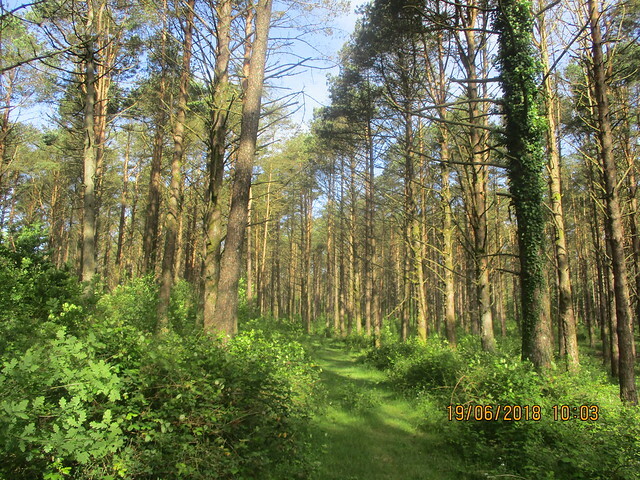 There were lots of woods, and I struggled the last hour or so. I did arrive by my goal of 5. I actually arrived at 4! Las vistas merecían la pena. Pasé una ermita bonita. El bar de Lago ya se cerró para siempre. 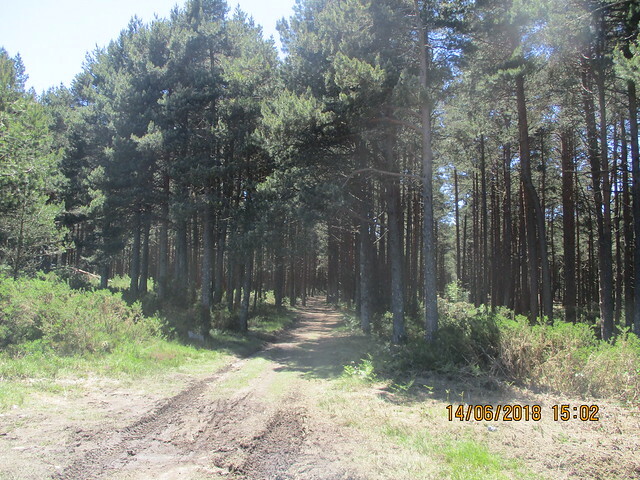 Había bastante bosque, y me costaba la última hora. Tenía la meta de llegar antes de las 5, ¡y llegué a las 4! I had reserved a private room at Casa Marqués. It wasn’t bad. I chatted with the Australians and the Andorrans and planned for the next day. Había reservado una habitación individual en Casa Marqués. No estaba mal. Charlé un rato con los australianos y los andorranos y planifiqué para el próximo día.